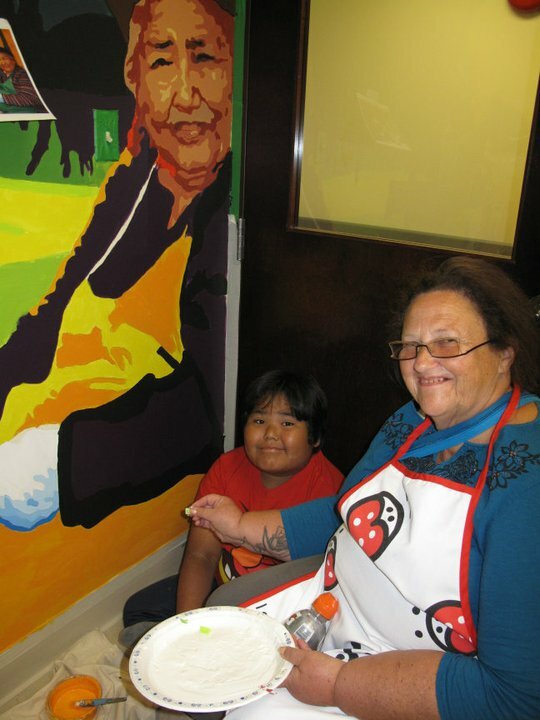 Intergenerational Community Mural Projects are a tool, space to celebrate stewardships, cultural ties, protection, community experiences. . Mural can share intergenerational knowledges, stories, values, experiences, assert local governance, create an alive memory of the resilience, resistance, self-determination. 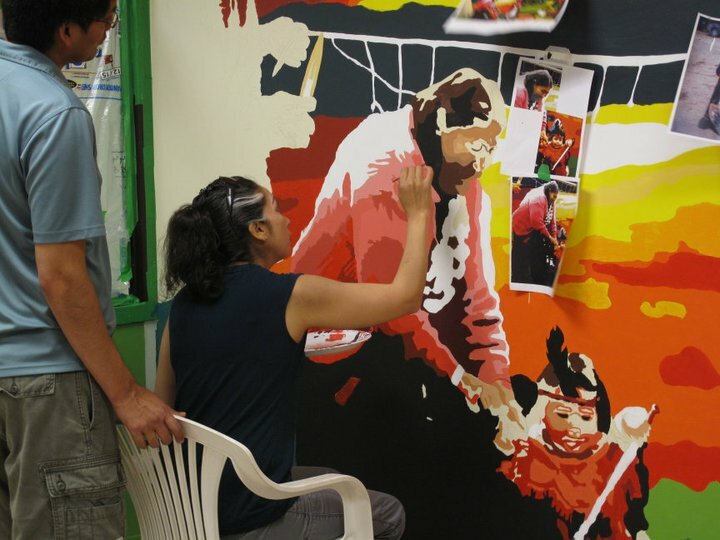 It's a way to reclaim public spaces to remember, celebrate, reclaim through the power of colours. 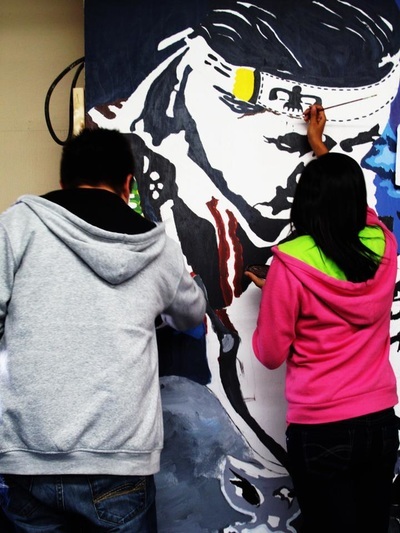 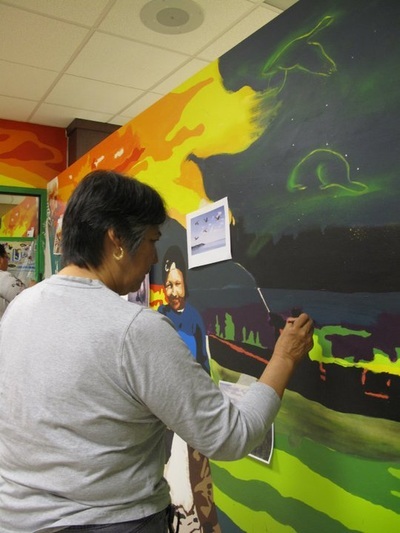 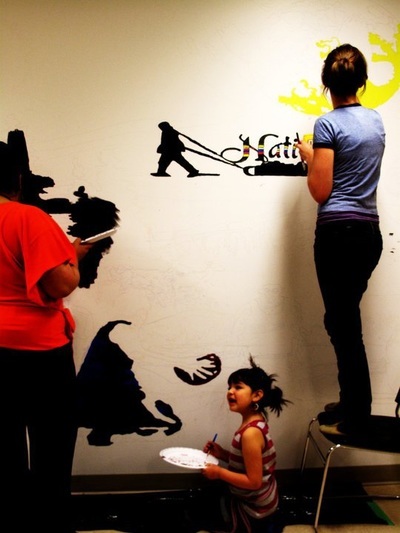 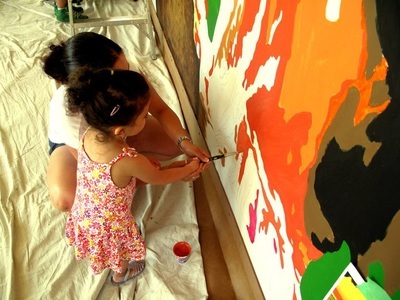 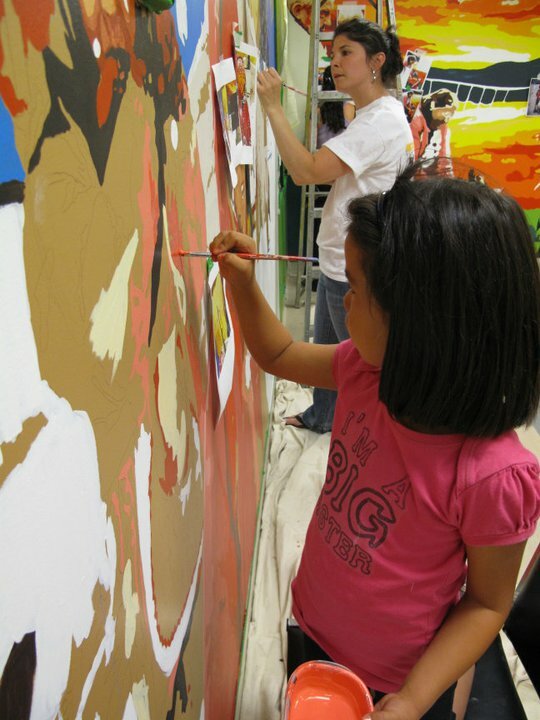 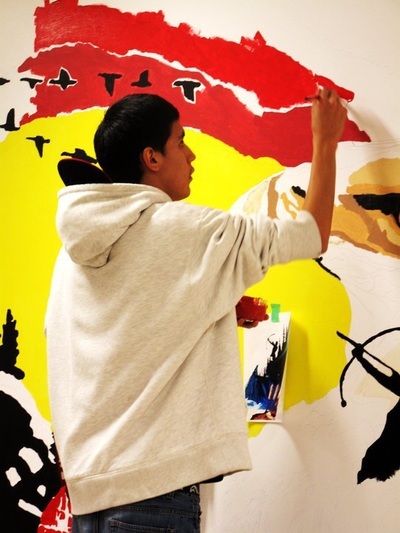 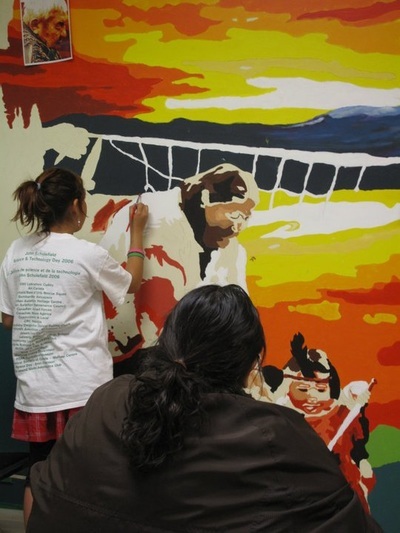 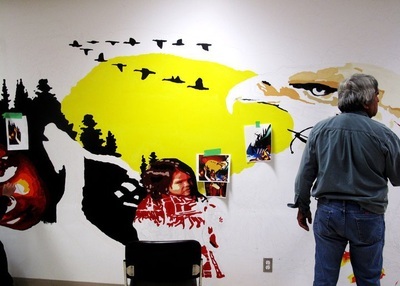 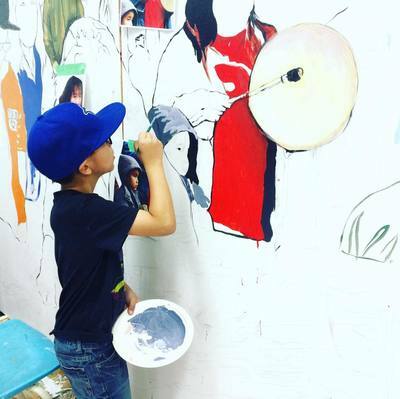 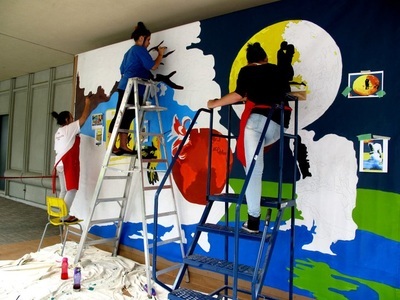 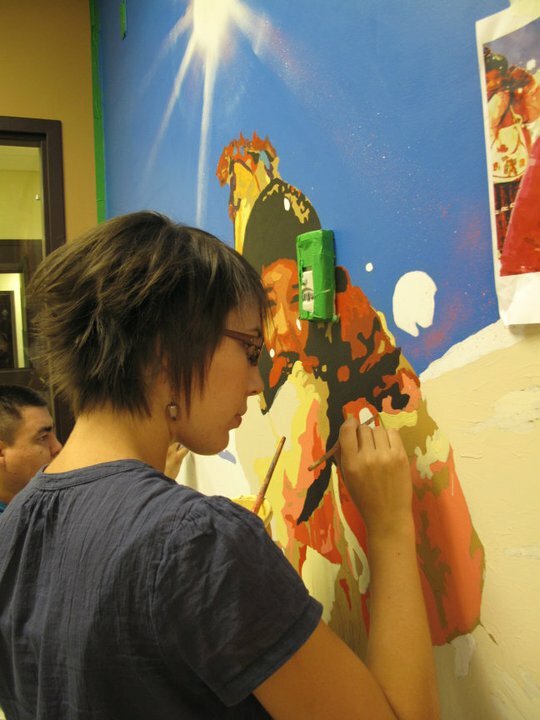 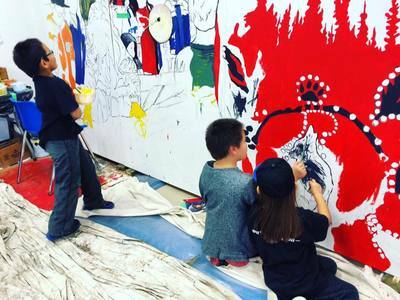 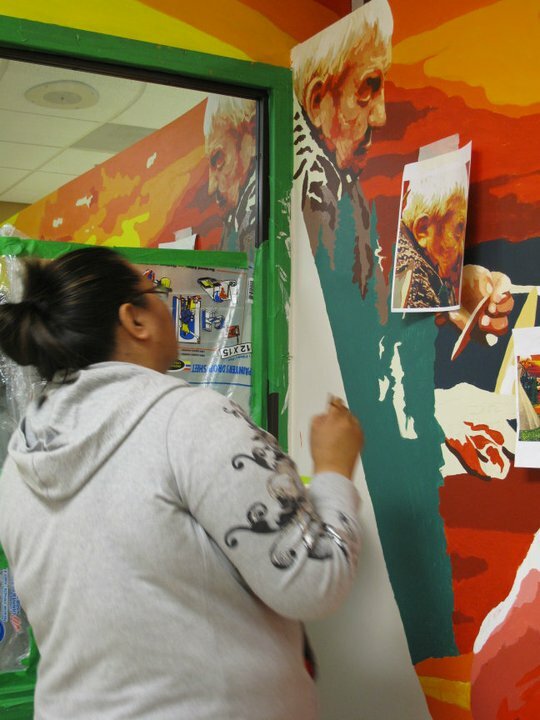 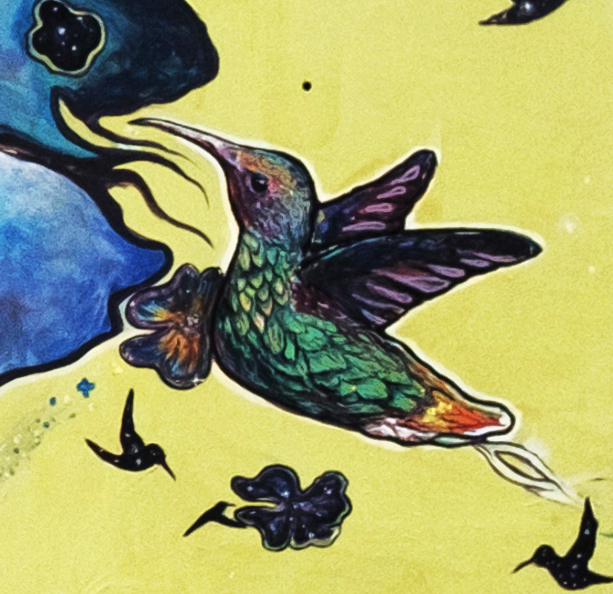 Intergenerational murals bring together community members especially youth to collect stories, knowledges, experiences, visions, perspectives and intertwined them in a collective visions. 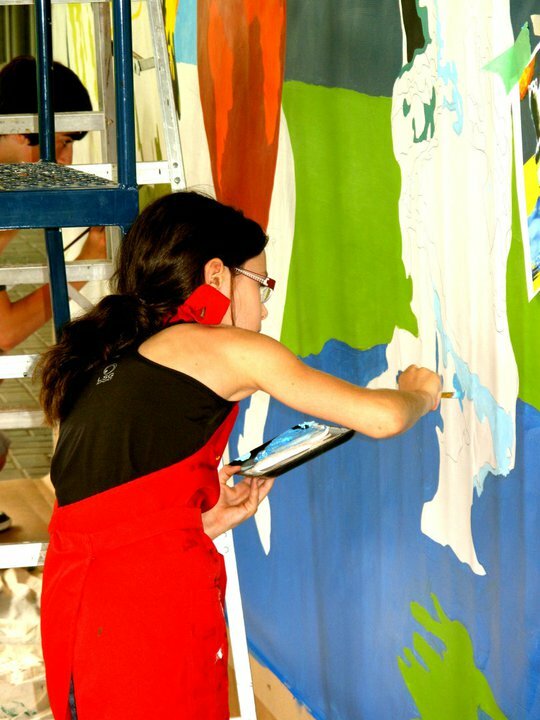 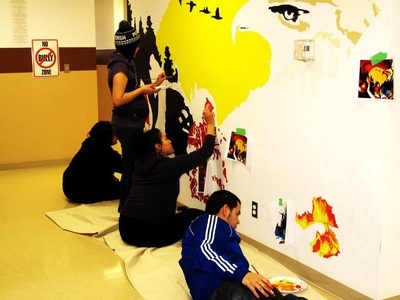 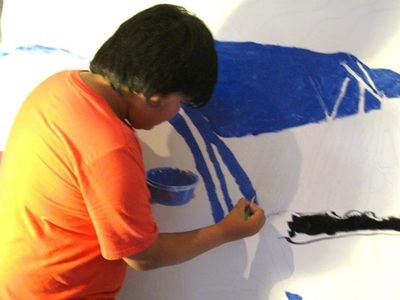 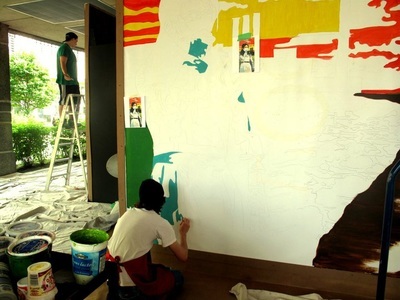 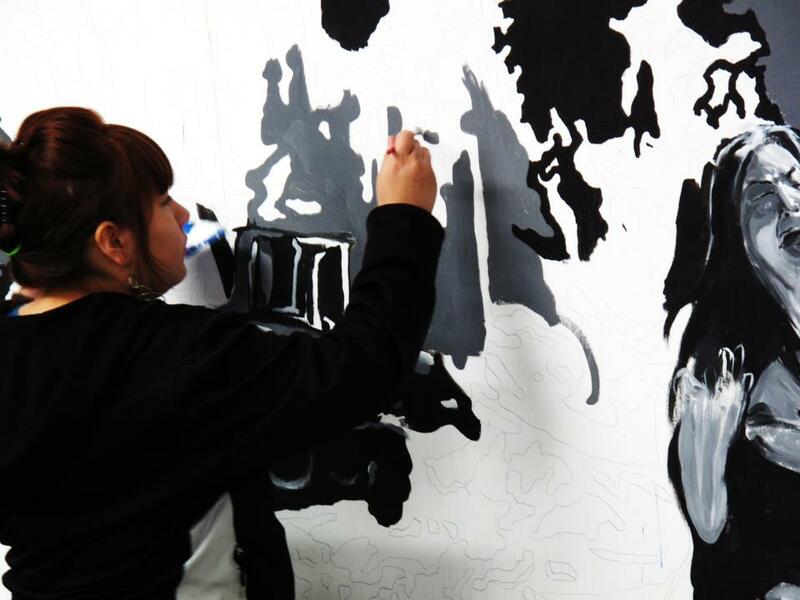 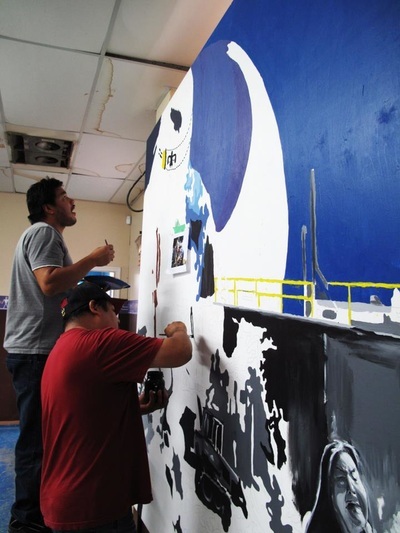 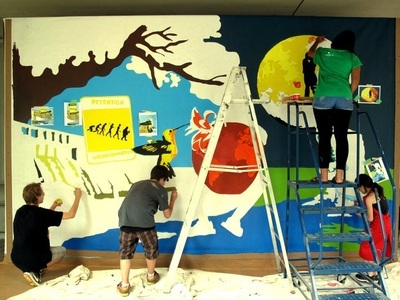 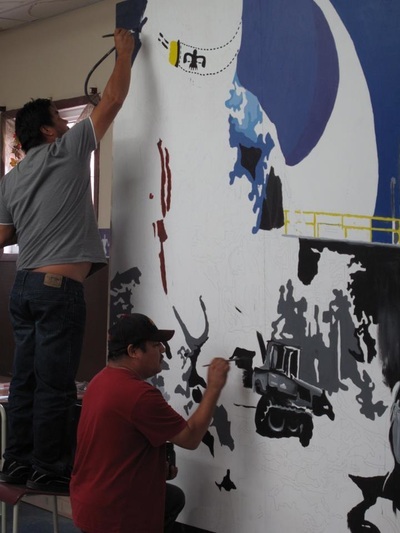 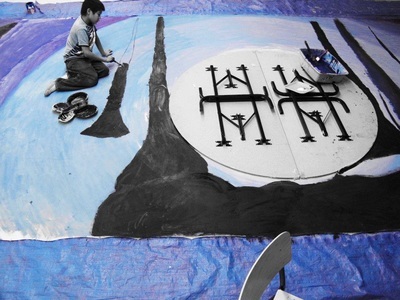 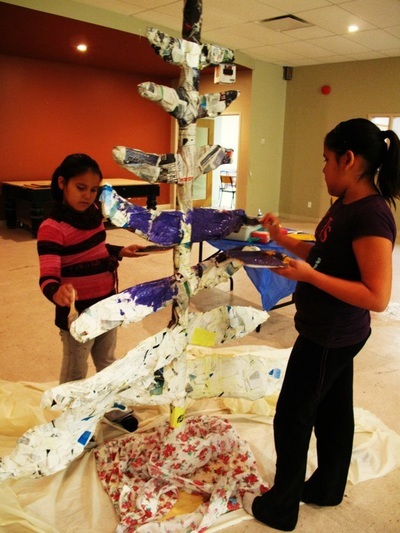 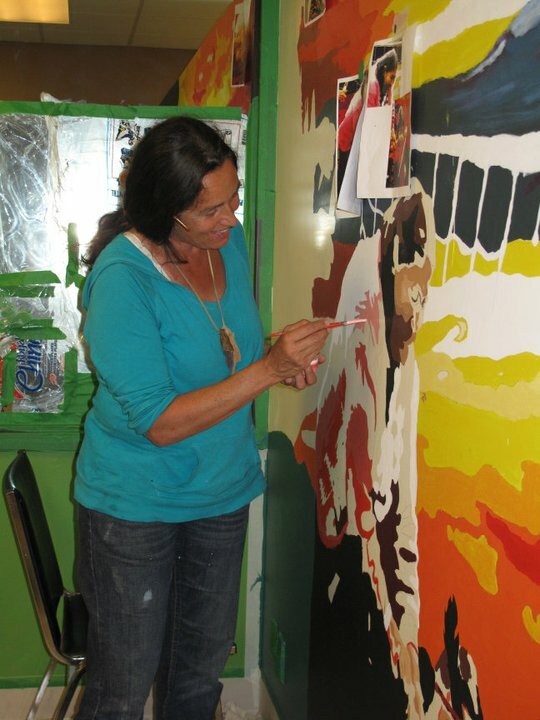 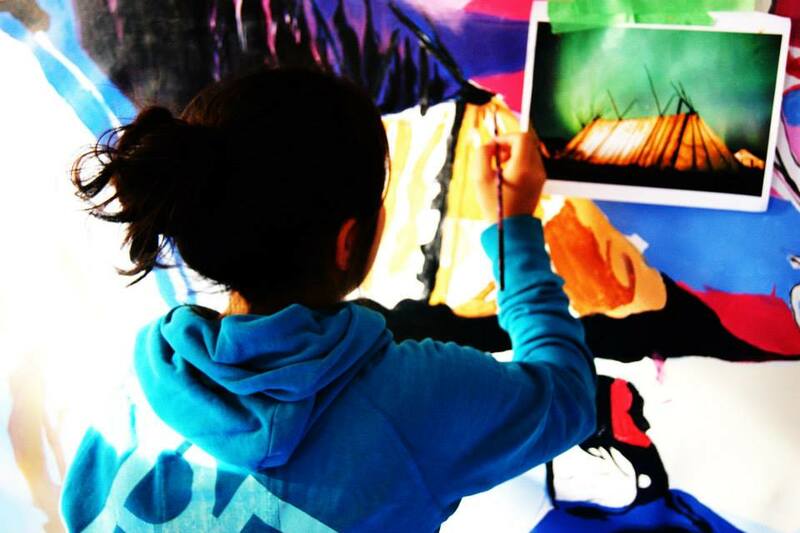 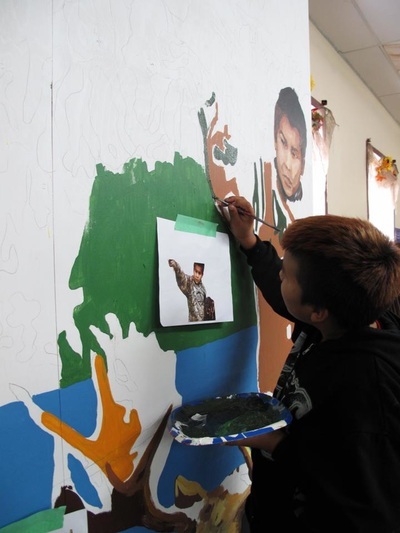 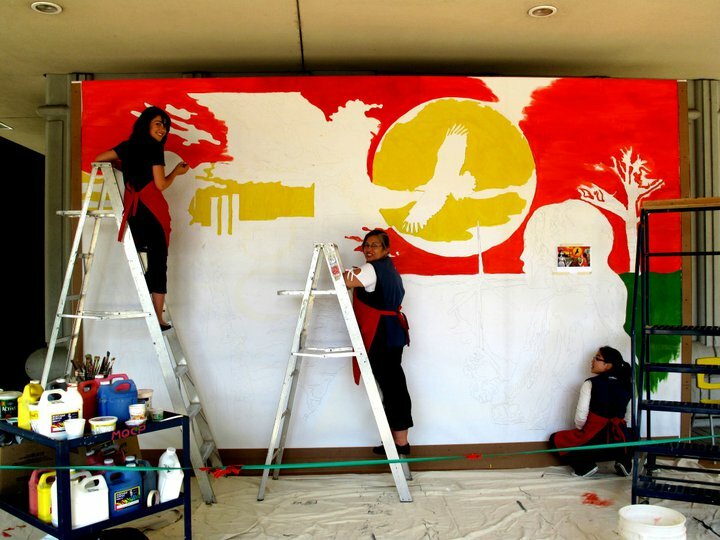 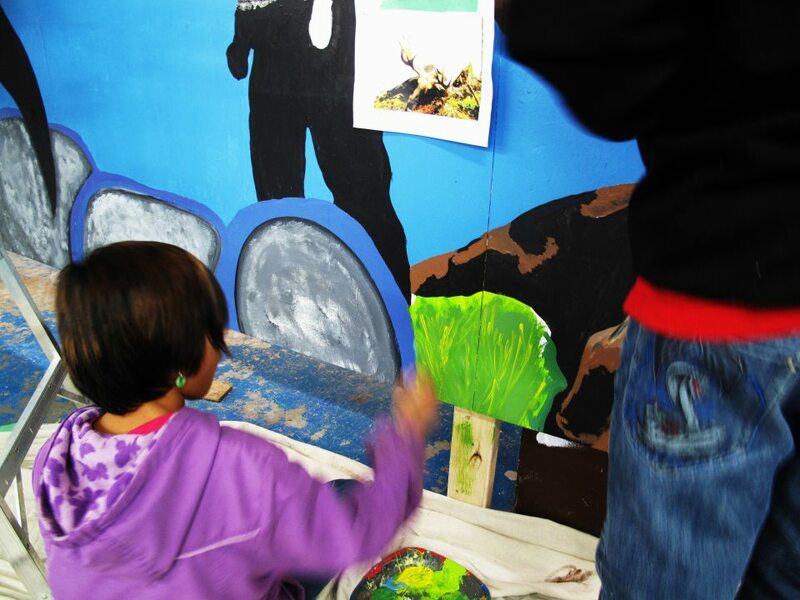 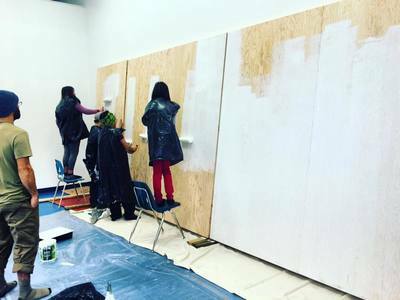 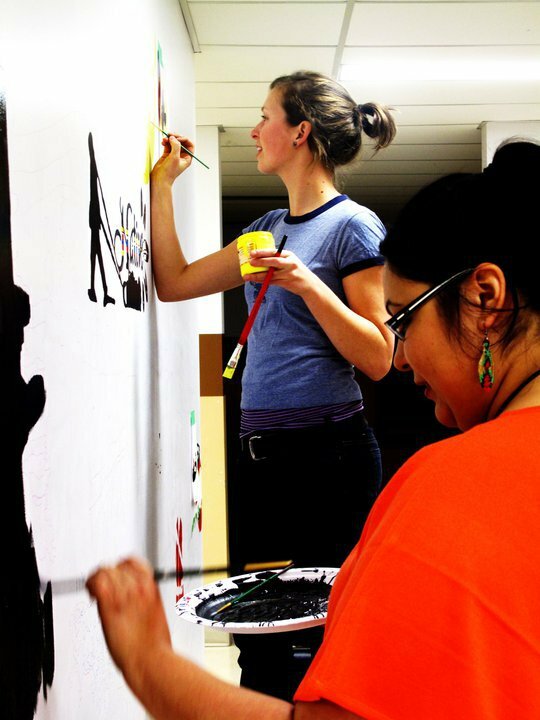 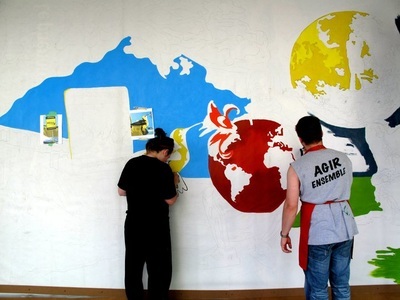 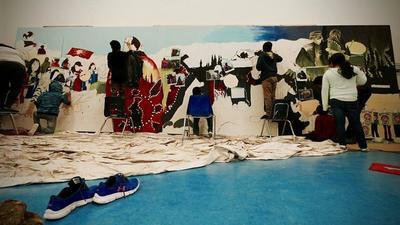 The murals are crafted by the vision of the participants and process is developed with local leaders, youth, artists. The connection with local leaders, cultural leaders, elders, traditional governance, is a way to embrace a learning process. 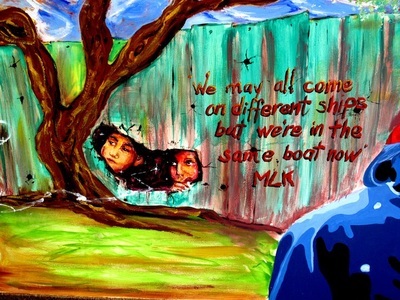 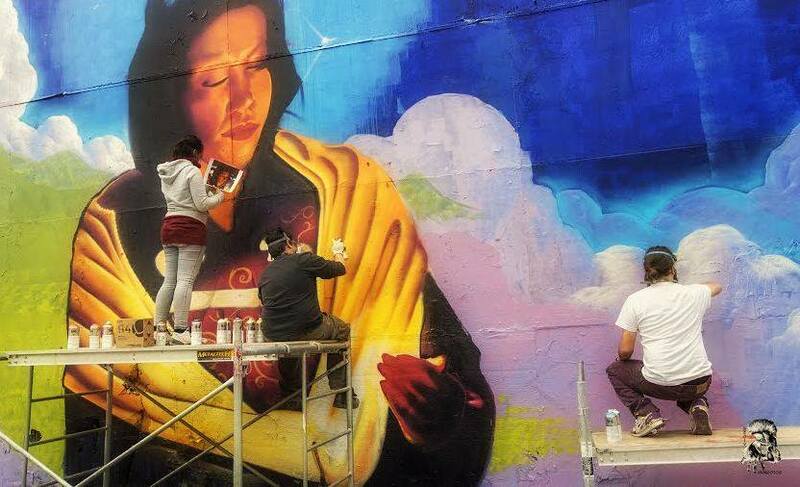 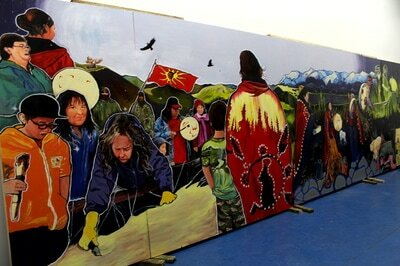 Being a guest of community, murals are often a humble way to give back, to give thanks from my heart and passion. 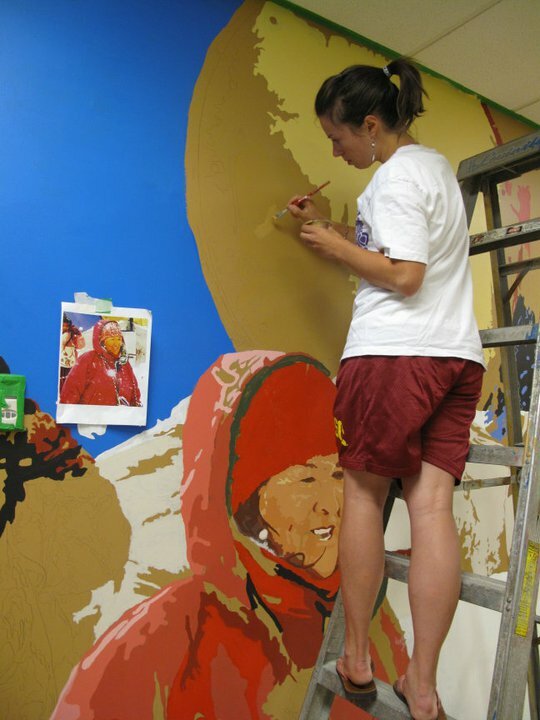 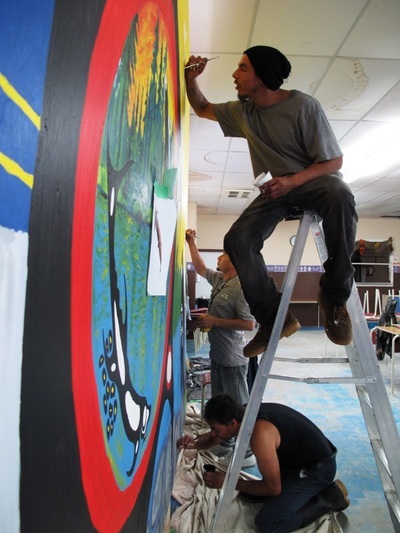 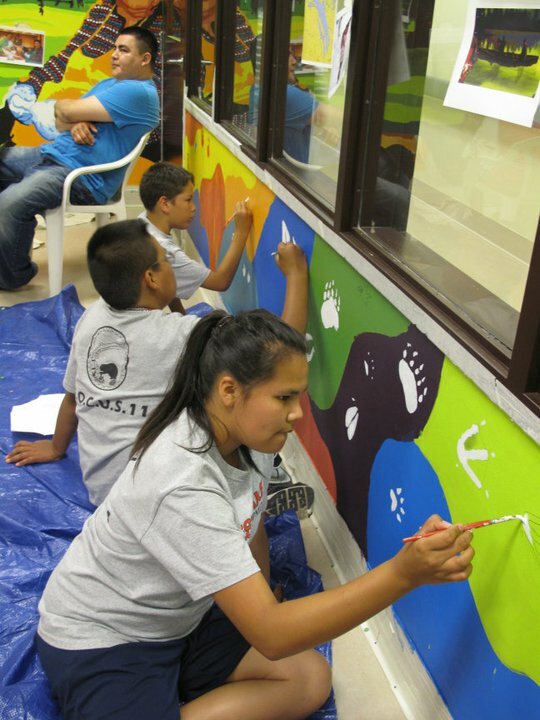 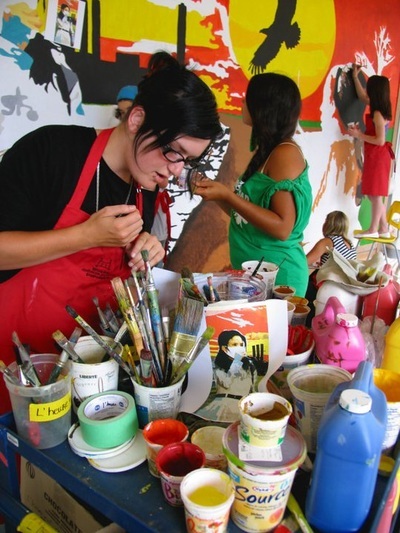 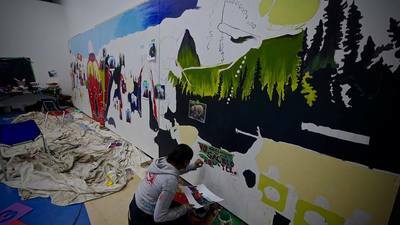 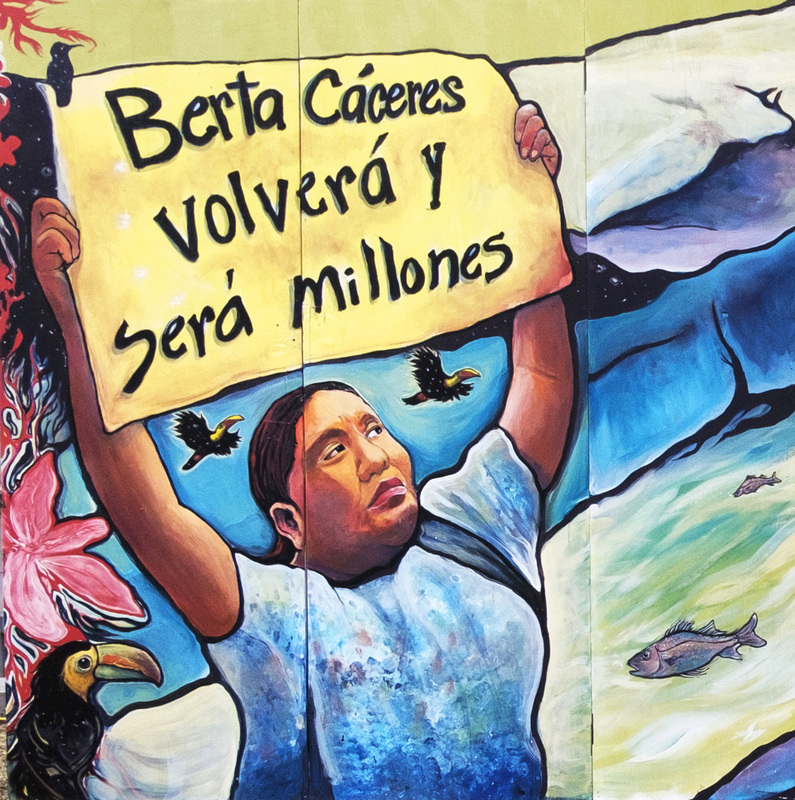 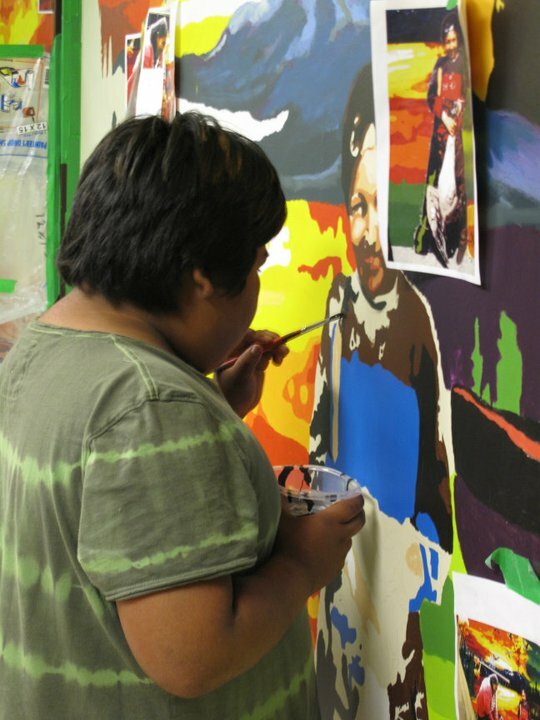 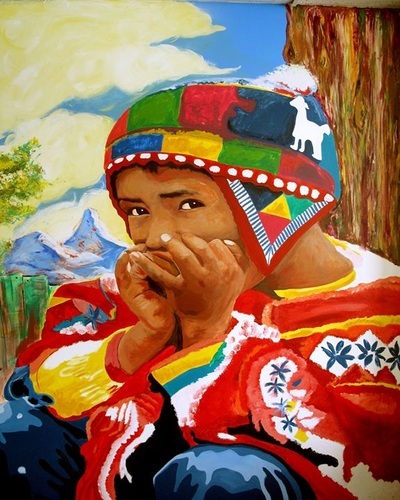 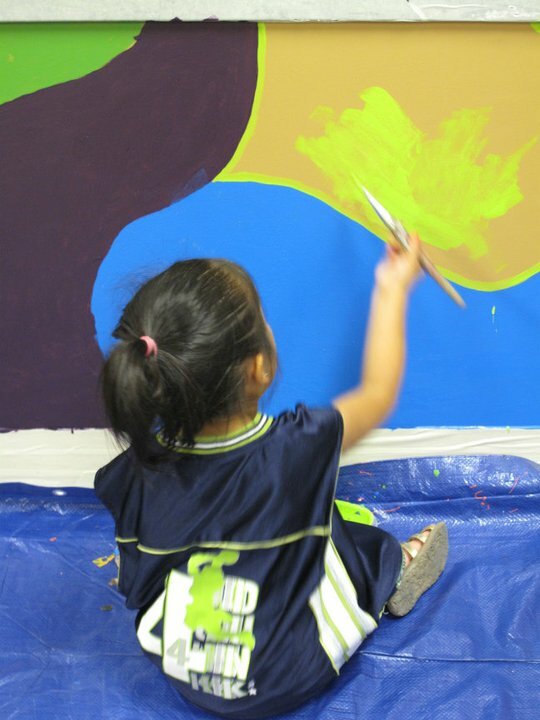 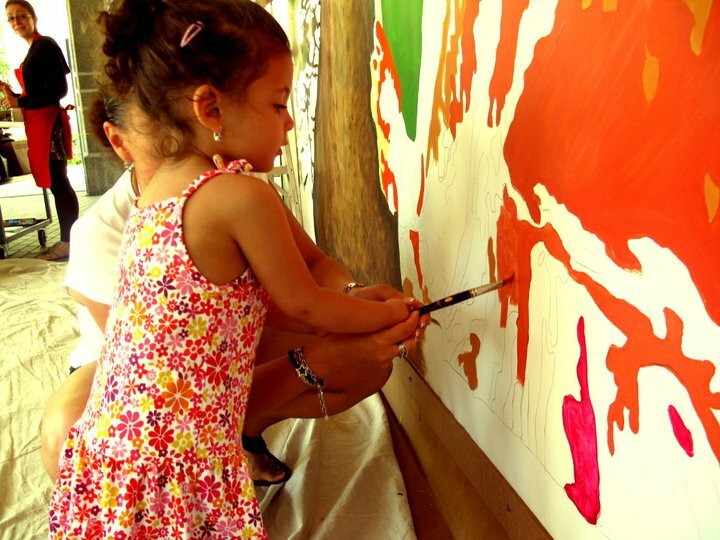 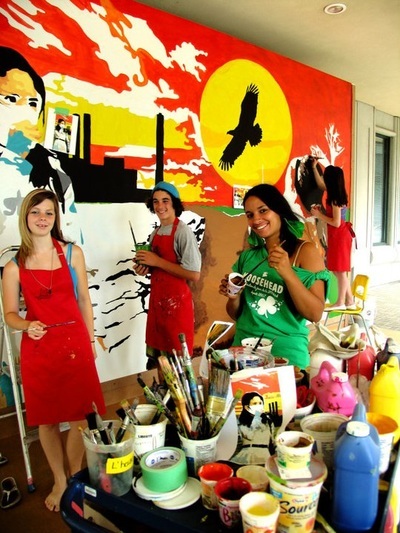 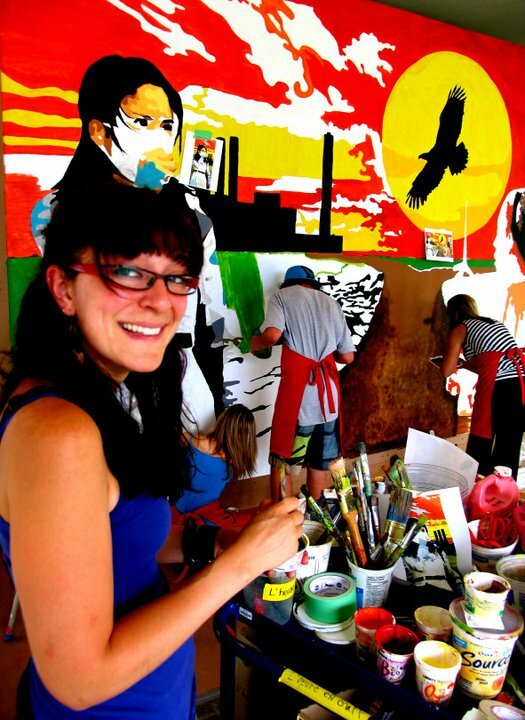 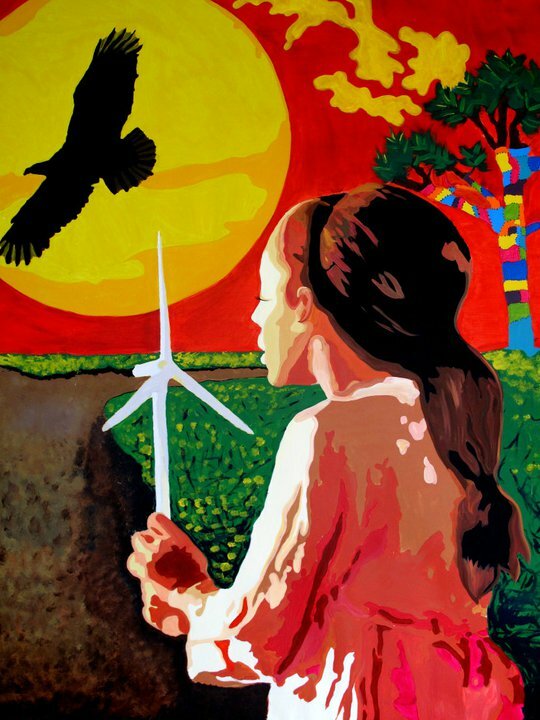 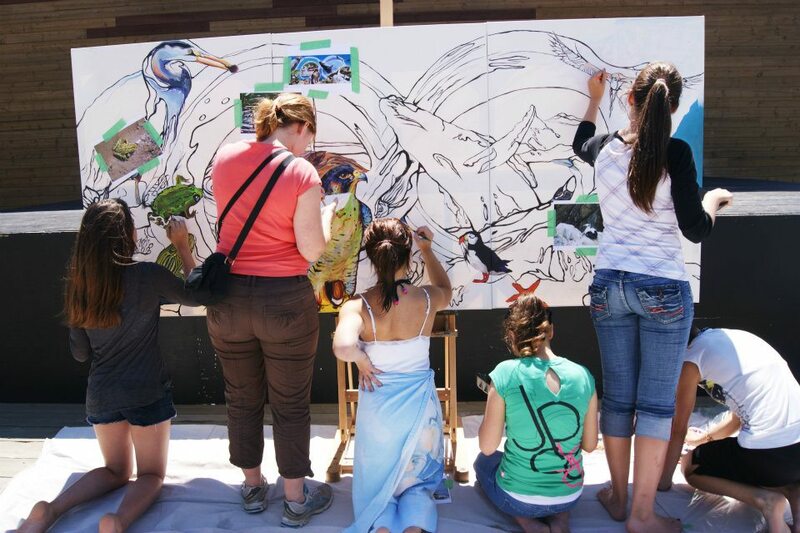 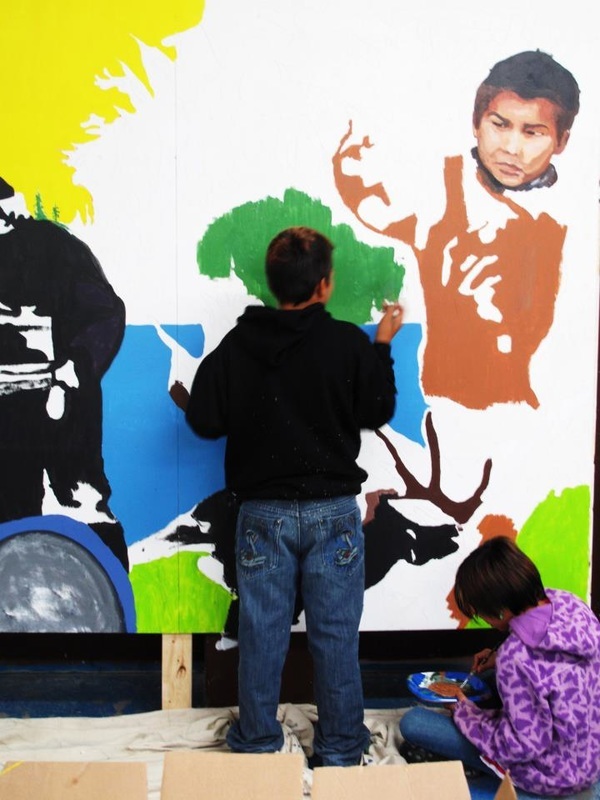 Community murals interweaves art, culture celebration, stewardship & education. Its also a space to celebrate connection, relationships, building trust and pride of community stories and strenght. 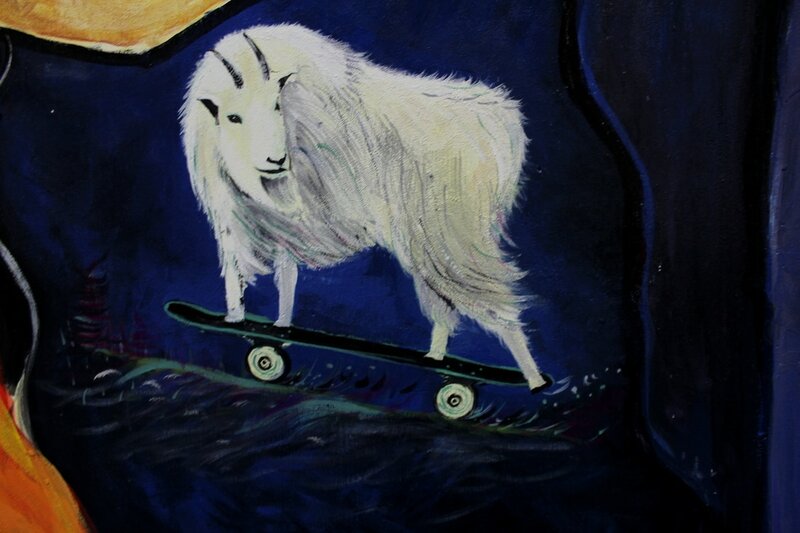 Sometimes art is seen as an aesthetic, expression, result, I see murals as a way to celebrate relationship and stewardship with all living creatures, with the natural world and supernatural. 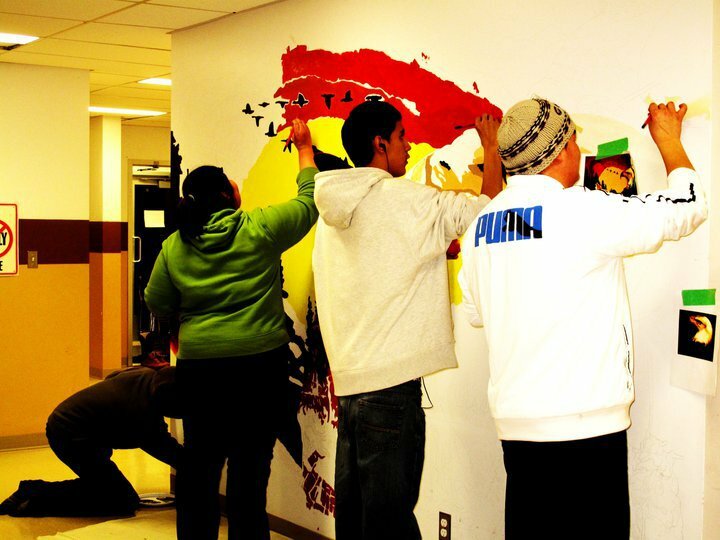 Its also a great tool to involve, empower youths, next leaders of their community. 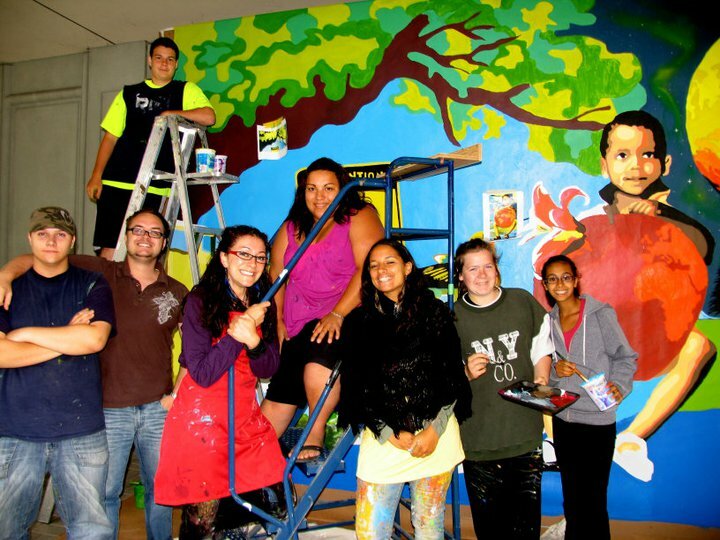 More of those projects are lead by youth and younger generations! 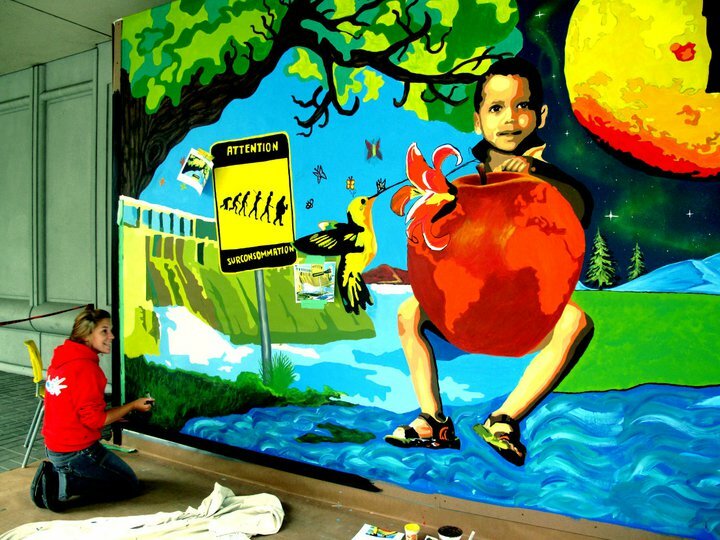 All those projects are fruits of collective efforts, research sharing and not my personal accomplishement. I'm grateful for all the communities that welcomes me to share my passion of mural as a tool of storytelling. 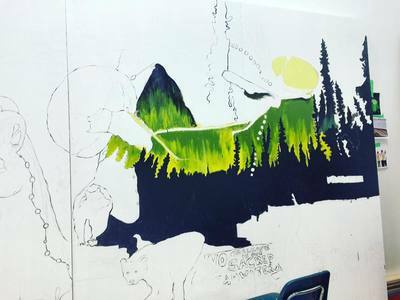 I aim to always improve and change the process in order to be accountable and respectful to protocols where those mural process takes places. 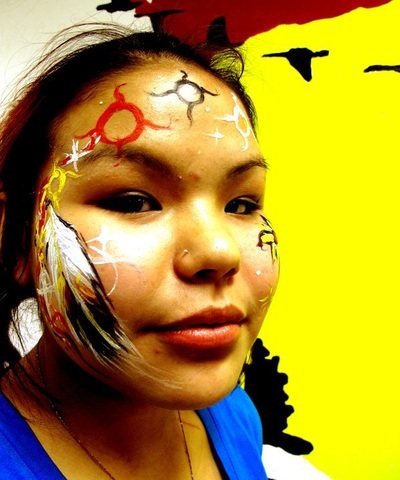 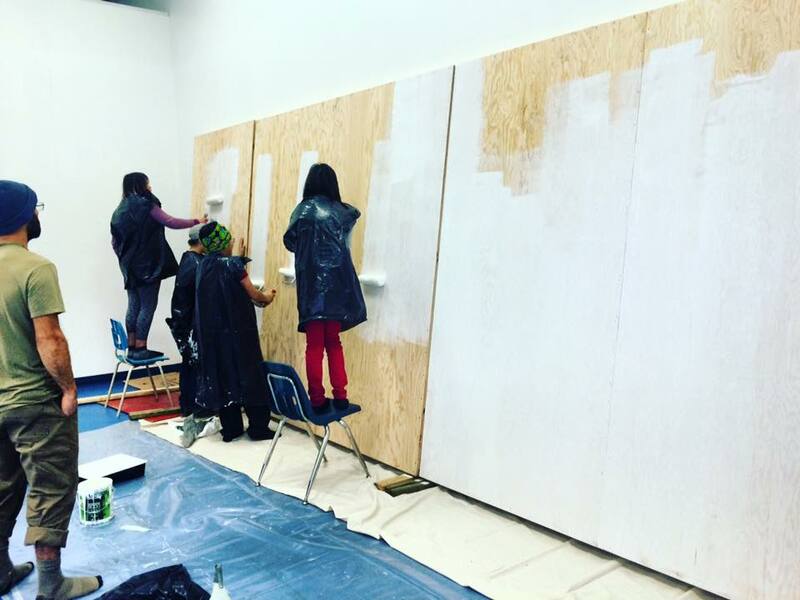 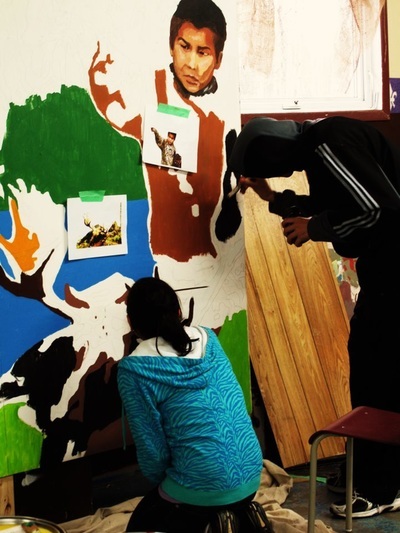 This video was produced by Tamo Campos (Beyond Boarding) and based on youth interviews reflecting on mural process and self-determination and strenght of Musgamakw Dzawada'enuxw. 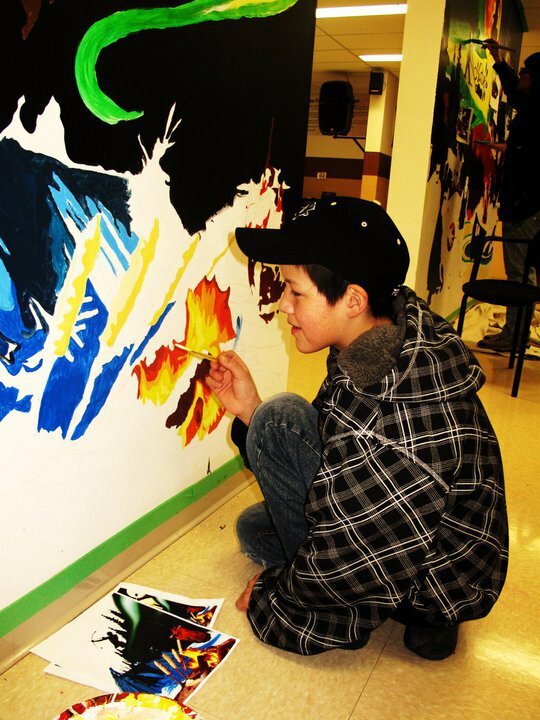 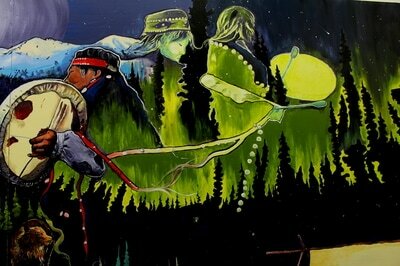 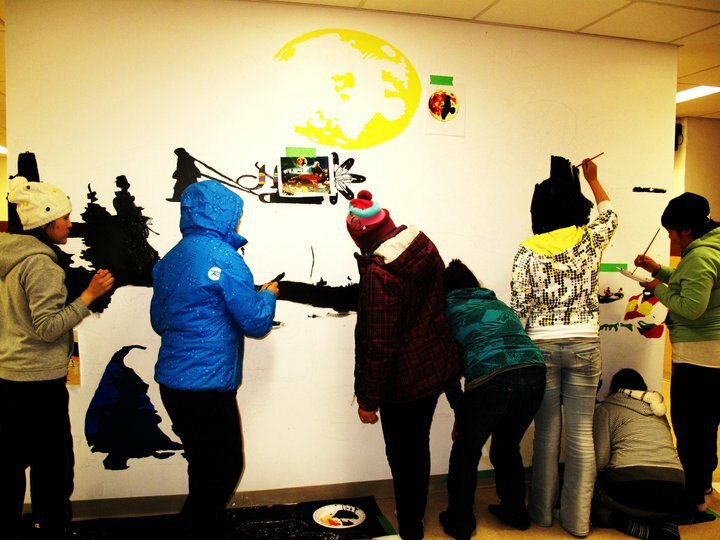 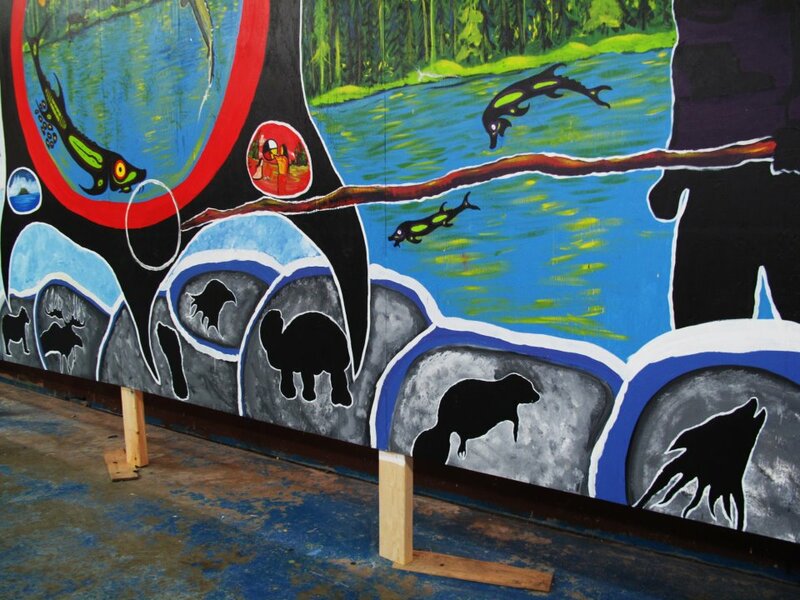 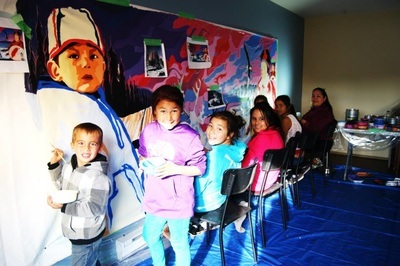 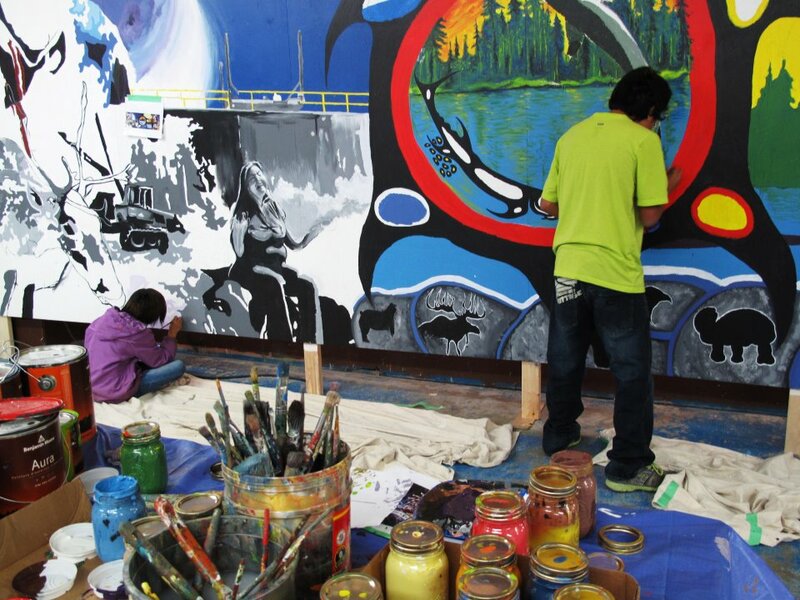 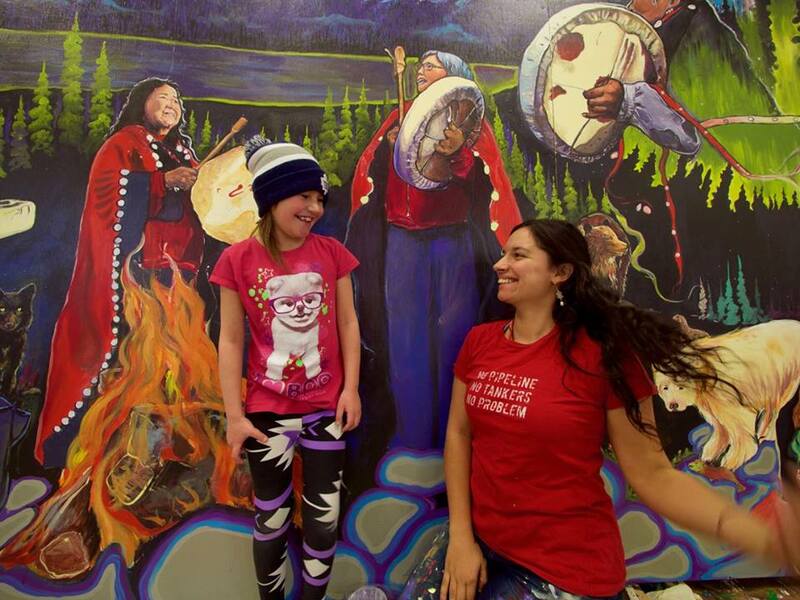 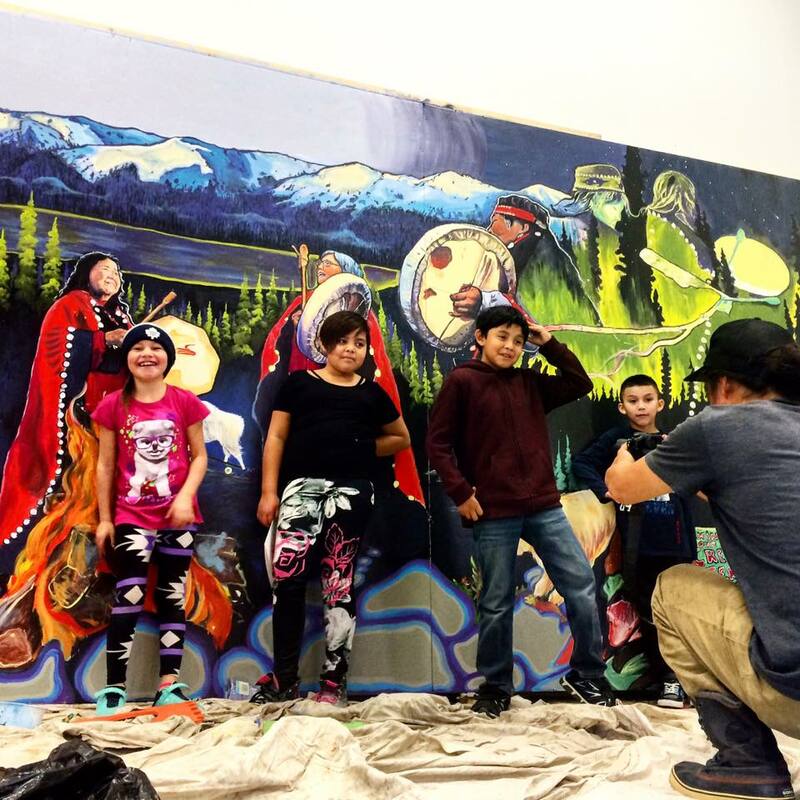 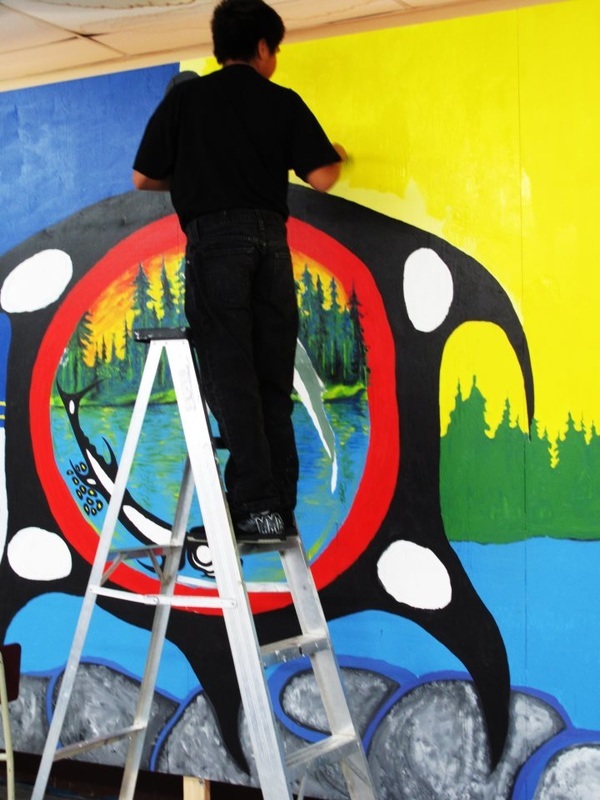 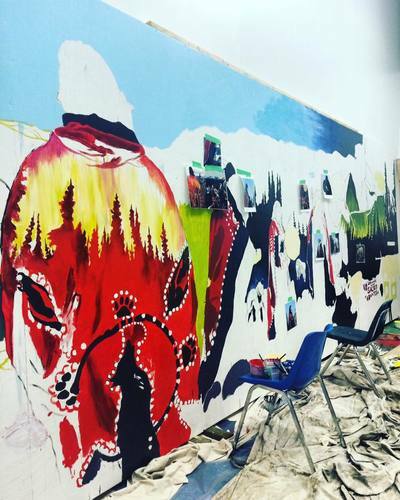 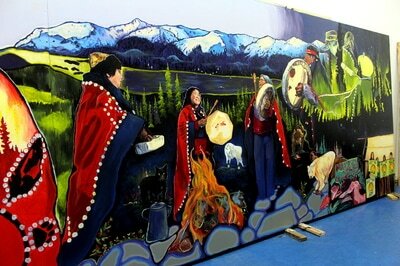 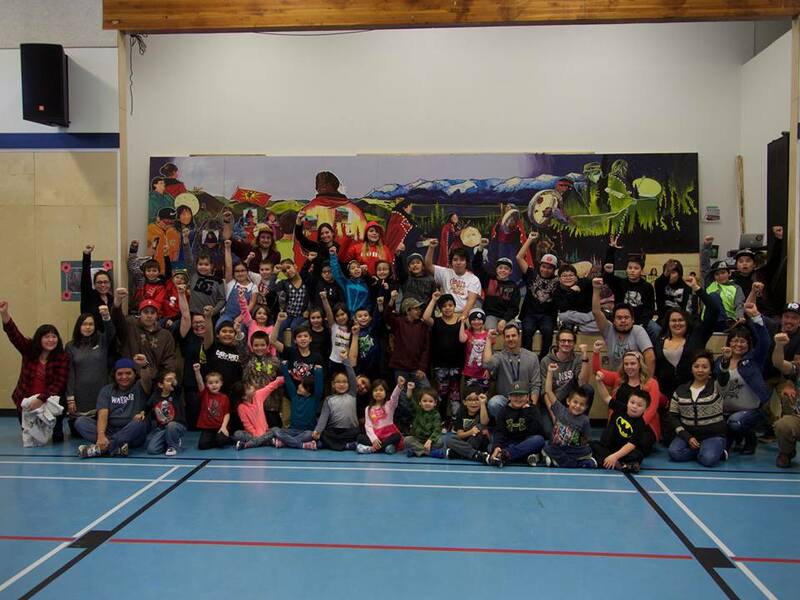 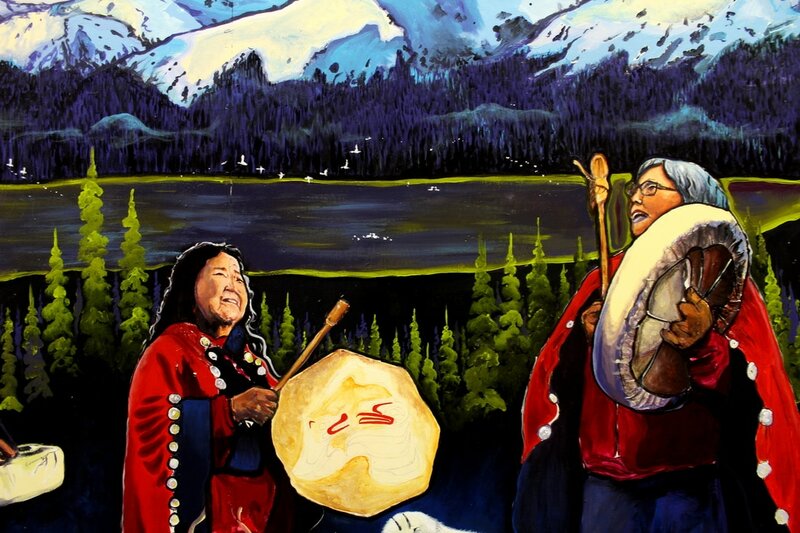 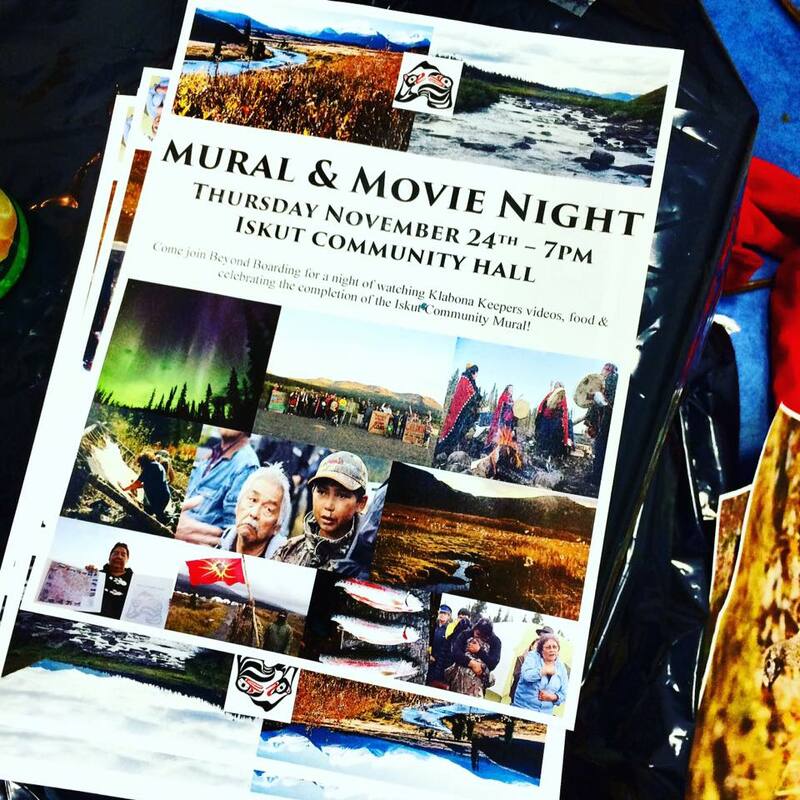 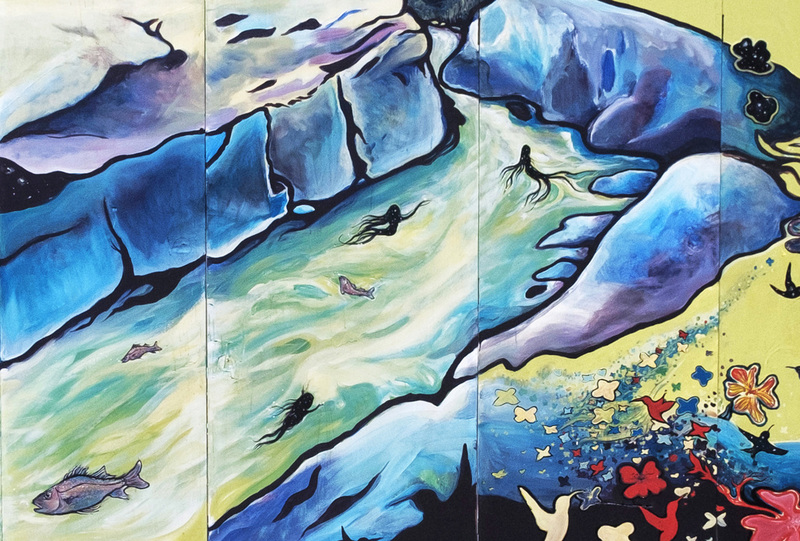 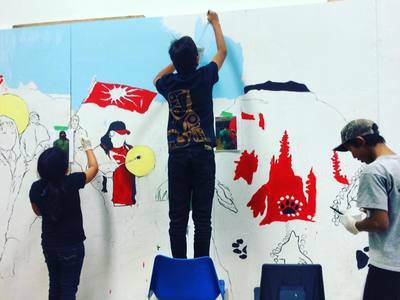 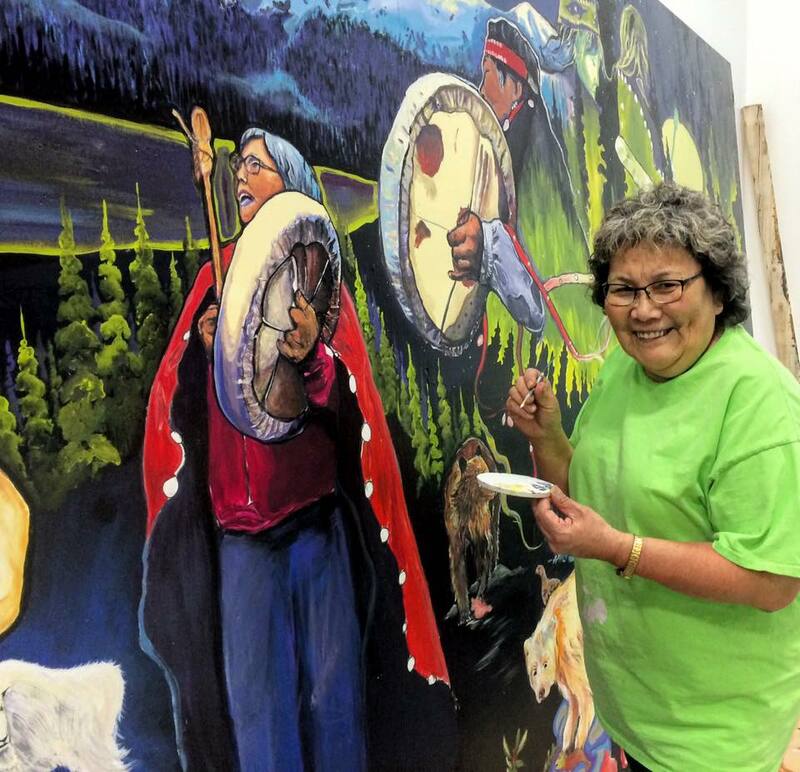 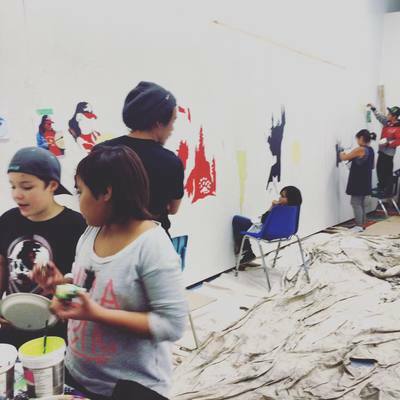 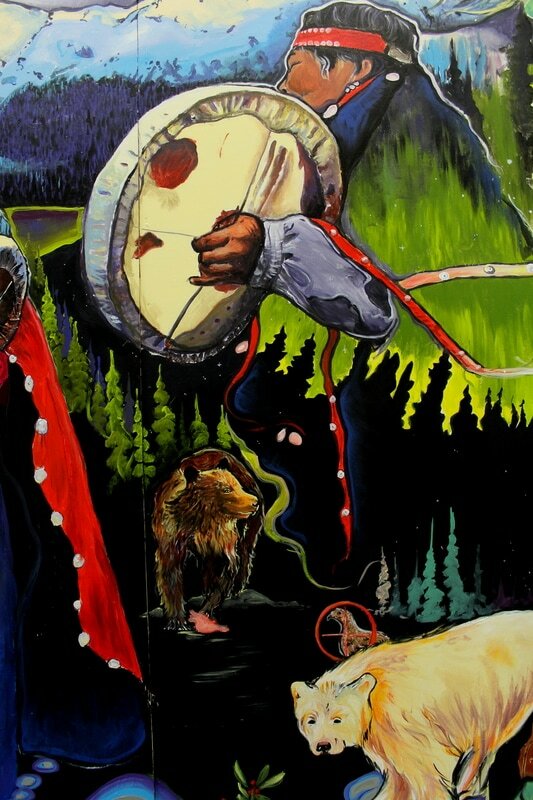 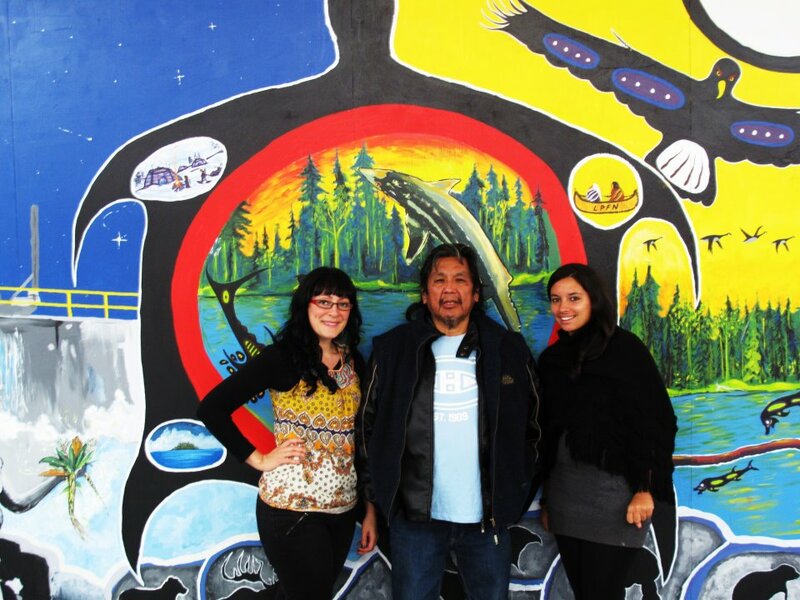 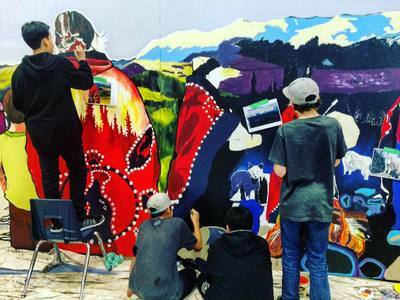 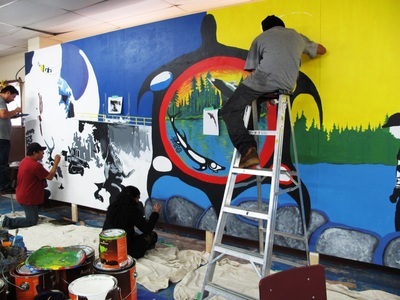 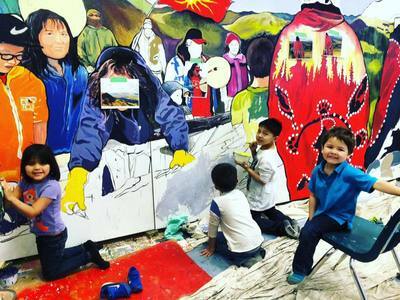 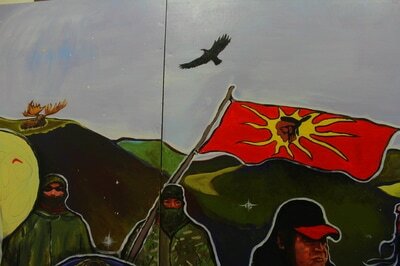 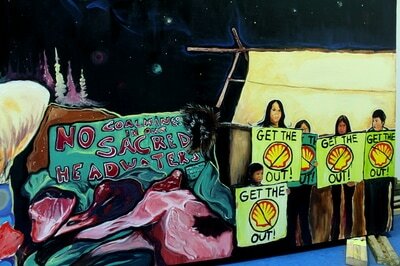 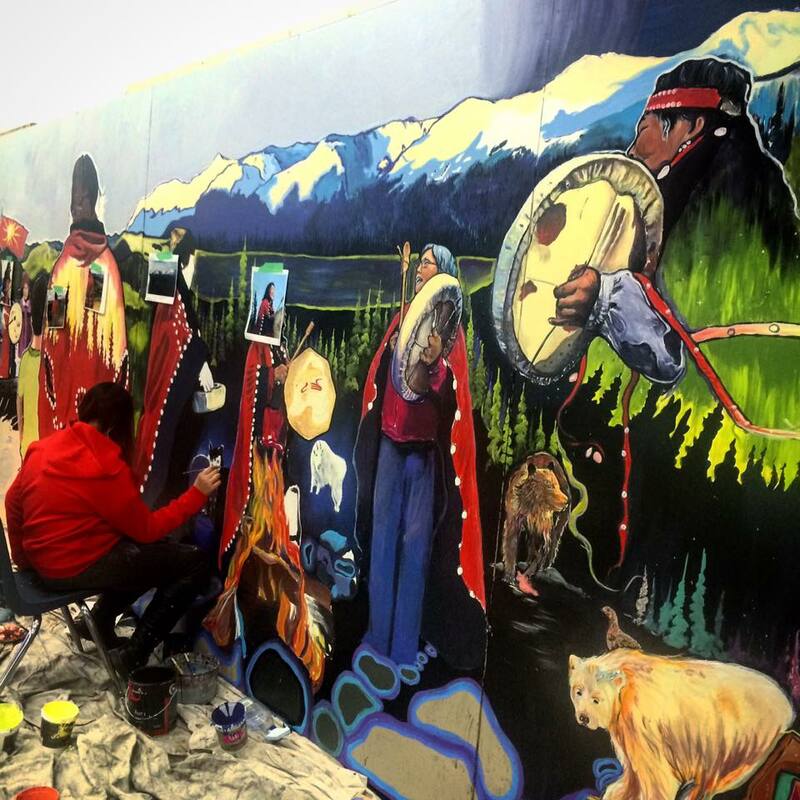 The mural was realised in collaboration with Kingcome Inlet Community and youth! 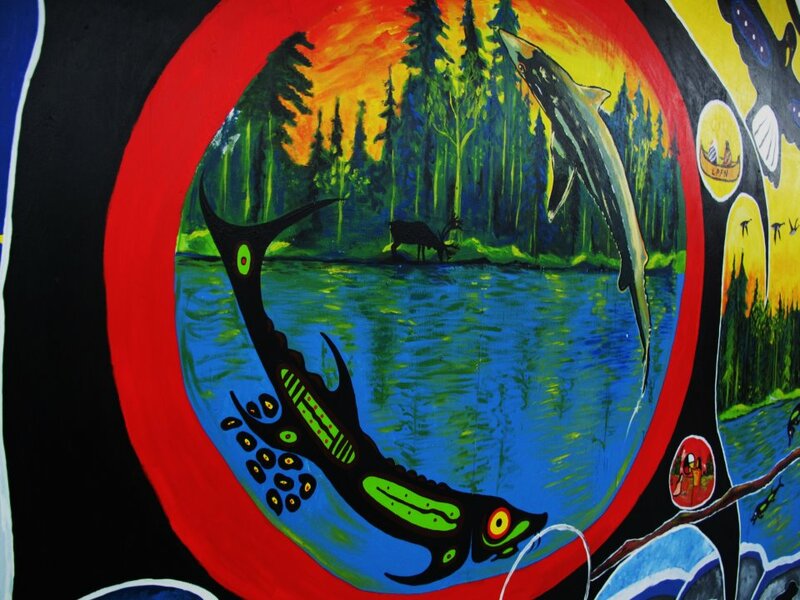 This mural was done in response to the community fight to protect wild salmons from salmon fish farms imposed in their territory. 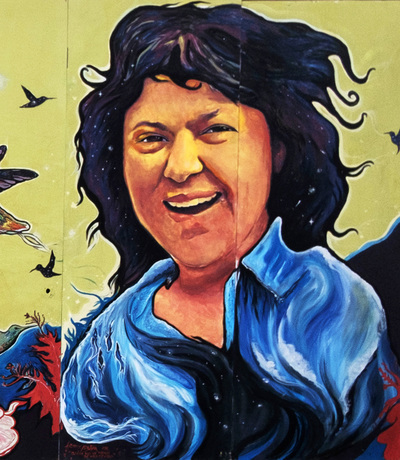 Murale Berta Caceres no Murio se Multiplico! Berta Cáceres, líder autóctona Lenca de Honduras, co-fundadora del Consejo Cívico de Organizaciones Populares e Indígenas de Honduras (COPINH) Copinh Intibucá y defensora del agua y de la vida, fue asesinada el 2 de marzo del 2016 por luchar para proteger el rio sagrado Gualcarque codiciado por Desarrollos Energéticos-DESA para la construcción de una presa hidroeléctrica. 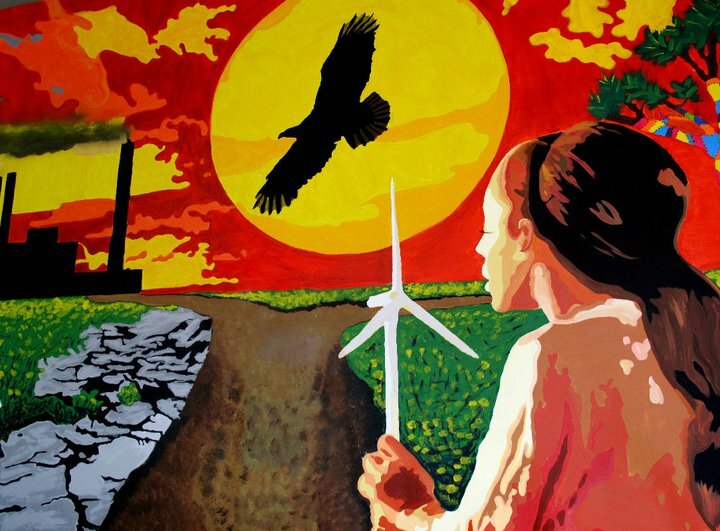 Símbolo de la resistencia y de la lucha de los pueblos contra el sistema capitalista que despoja y destroza las comunidades y los territorios, Berta Cáceres deja un legado en la articulación de los movimientos, de dignidad y de combatividad. 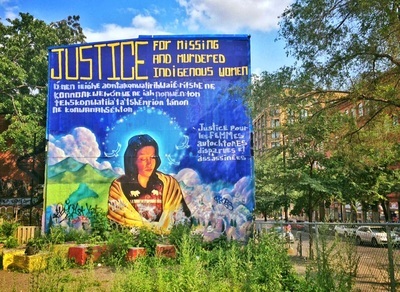 Su asesinato provocó una ola de movilización e indignación alrededor del mundo. 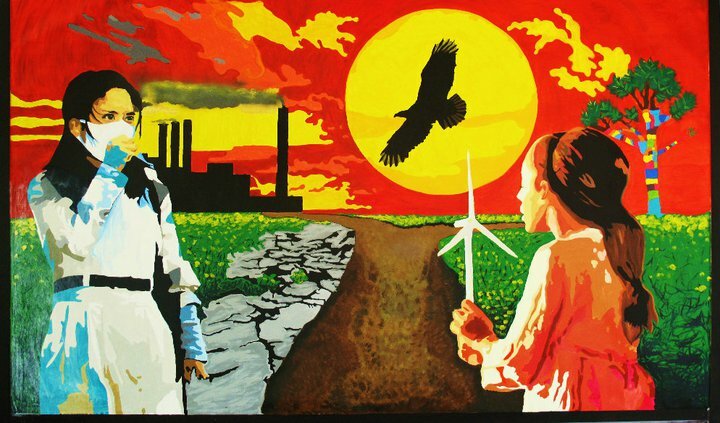 En cada esquina del planeta, cientos de activistas son perseguidos, asaltados y asesinados por su lucha para defender el agua, la tierra, la dignidad y la vida. 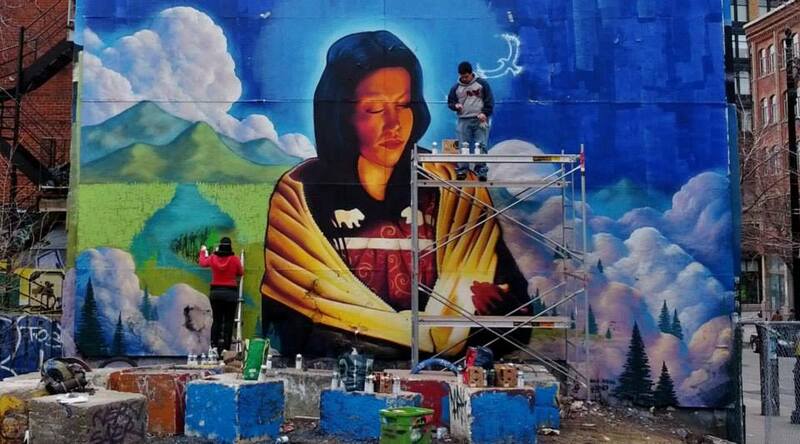 Gracias de todo corazon a la fuerça collectiva que permiti a este mural de nacer, todas la donaciones de pinturas y el equipo magico que ayudo en todo el proceso. Berta Caceres, leader autochtone Lenca du Honduras, co-fondatrice du Conseil civique d'organisations populaires et autochtones du Honduras (COPINH) et défenseure de l'eau et de la vie, a été assassinée le 2 mars dernier en raison de sa lutte pour protéger la rivière sacrée Gualcarque, convoitée par l'entreprise Desarrollos Energeticos-DESA pour la construction d'un barrage hydroélectrique. 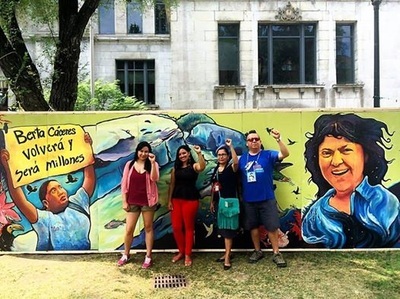 En tant que symbole de la résistance et lutte des peuples contre le système capitaliste qui dépouille et saccage les communautés et les territoires, Berta Caceres a laissé un héritage d'articulation des mouvements, de dignité et de combativité. Son assassinat a provoquée une vague de mobilisation et d'indignation à travers le monde. 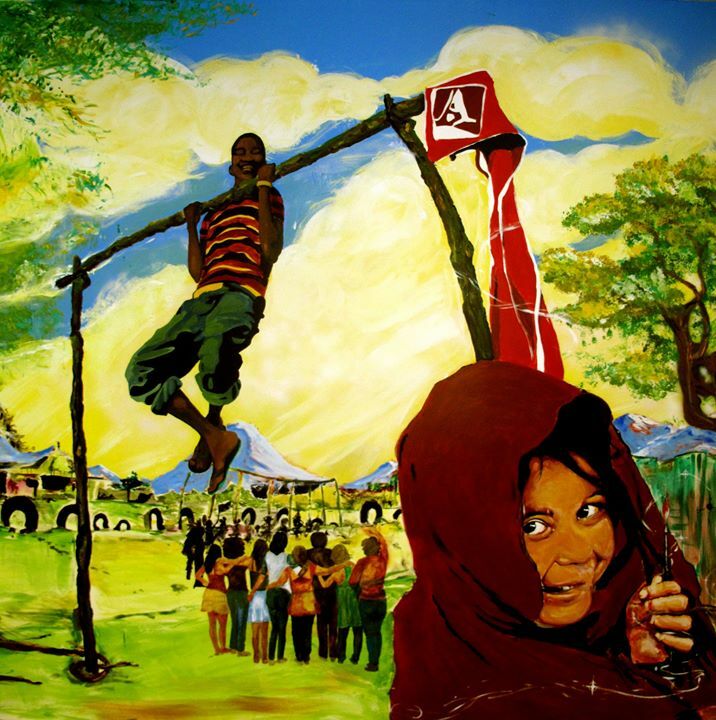 Partout sur la planète, des centaines d'activistes sont poursuivi.e.s, agressé.e.s et assassiné.e.s en raison de la lutte qu'ils et elles mènent en défense de l'eau, de la terre, de la dignité et de la vie. Merci de tout coeur à la force collective qui a permis de réaliser cette murale indépendamment, budget zéro, matières recyclés et qui ont appuyé tout le processus. 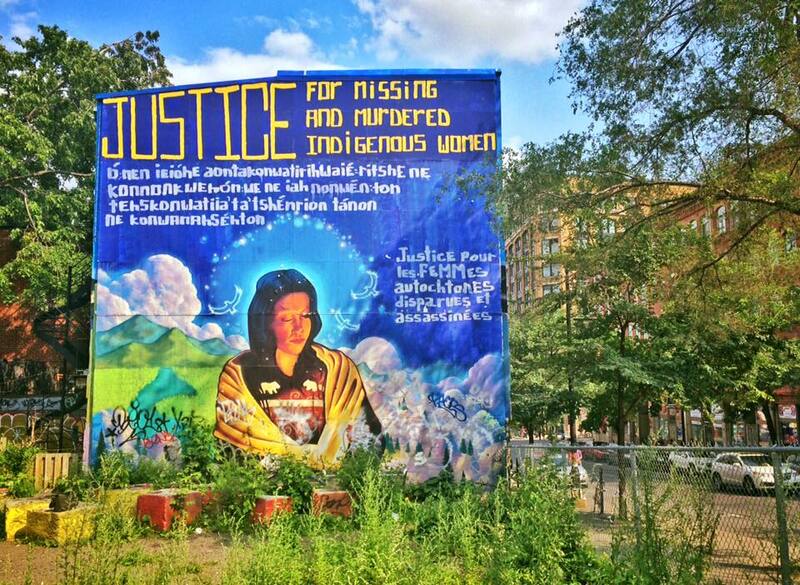 This mural was done in 2013 on St-Laurent/Ontario to commemorate and honor all Missing and Murdered Indigenous Woman and Girls across Turtle Island! Collaboration with Guko and Monk.e with the support of Missing Justice. Huge thanks to all people, families, medias, organisation that struggles everyday to give voice to this issue and seek justice. 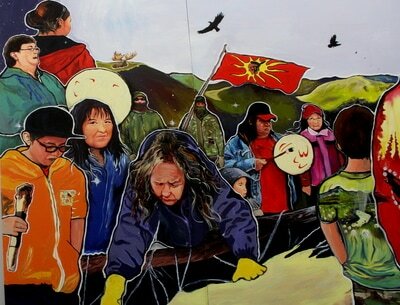 We all need to adnowledge the colonial problem and support the need of a national inquiry for healing! 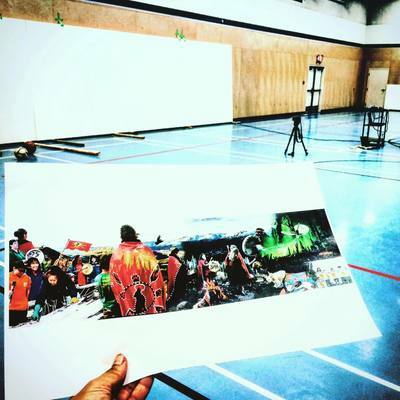 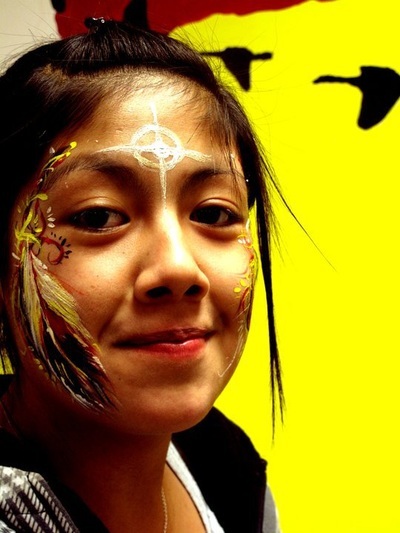 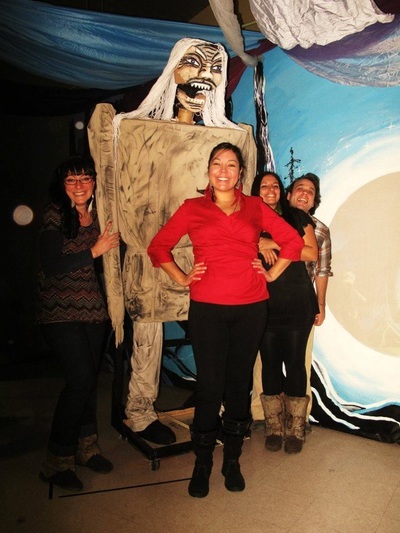 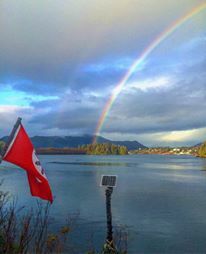 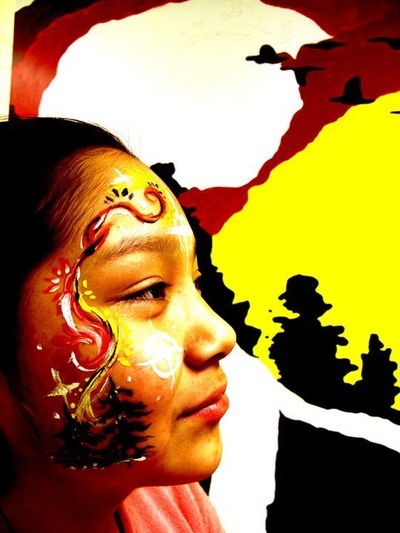 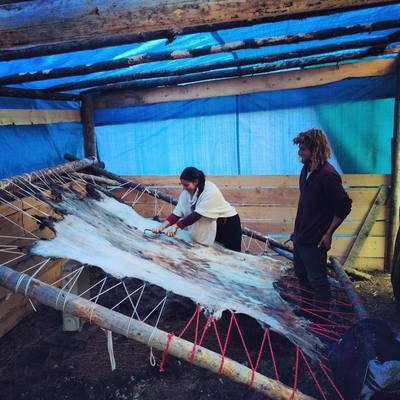 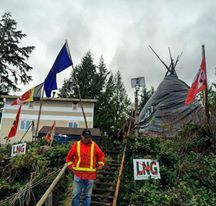 Nia:wen to Cheryl Diabo and Erin Spark for the original picture and (The Language & Culture Training Center) and the Kanien’kehá:ka Onkwawén:na Raotitióhkwa Cultural Center of Kahnawà:ke for their translation contribution to this cause. 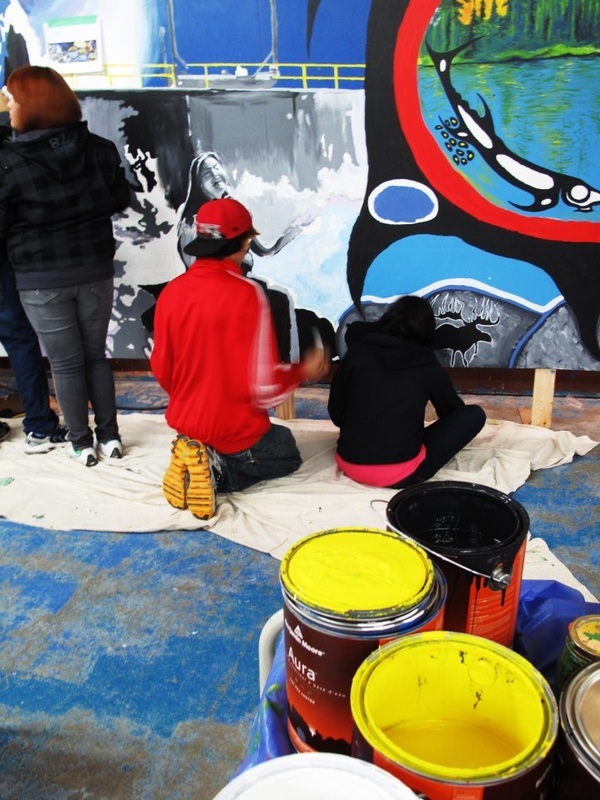 Thanks to Melodie Jourdain and the organisator of the Youth Indigenous Week in Maliotenam, Maison de la Famille to offer the painting space and 52 painters participants that came to paint and contribute with ideas! 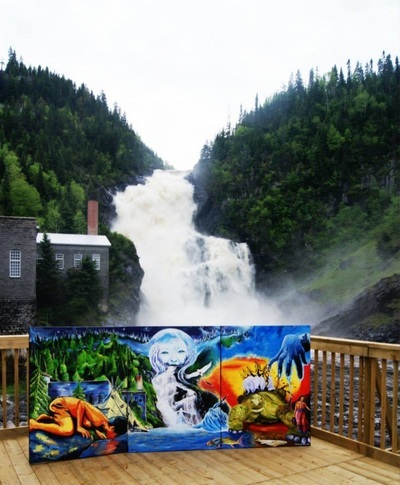 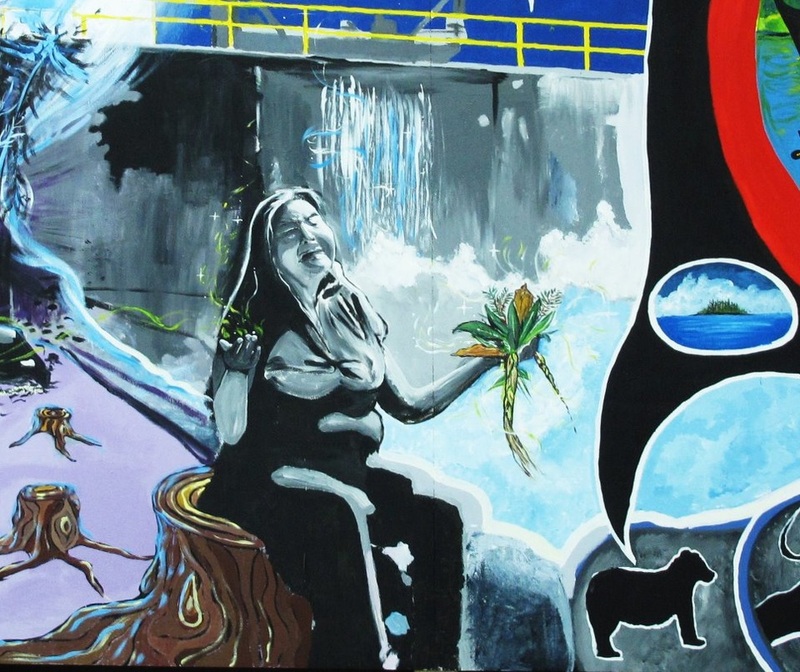 Collective mural create to honor the river and waterfall Ouiatchouan who was brought to death by a hydroelectric dam. 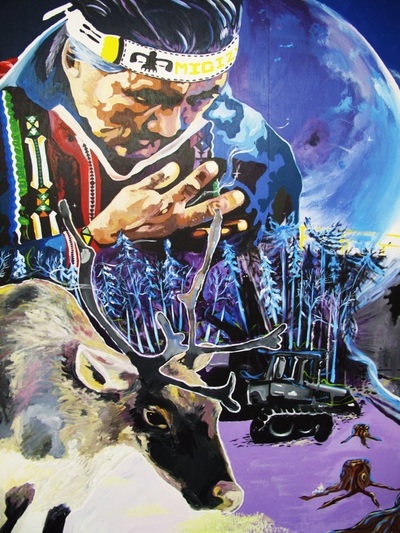 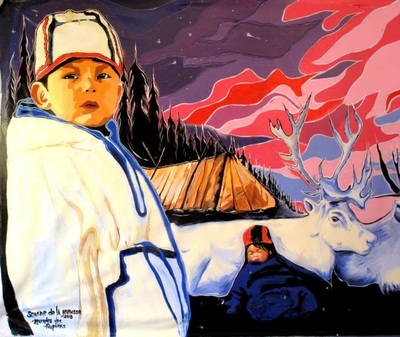 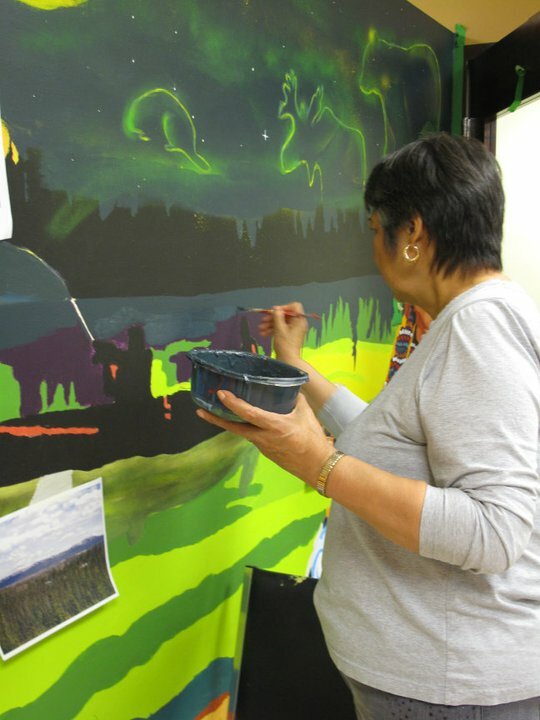 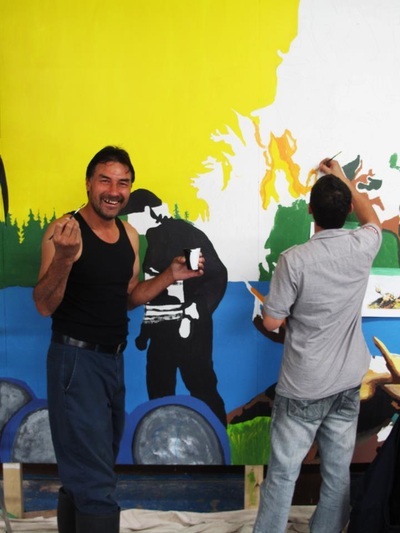 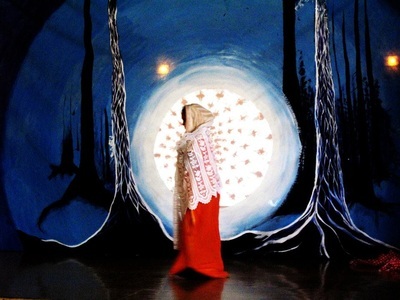 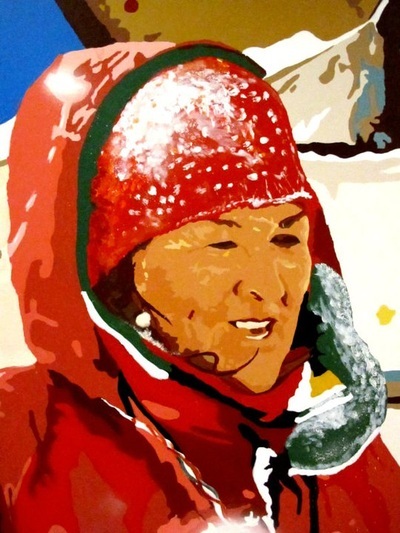 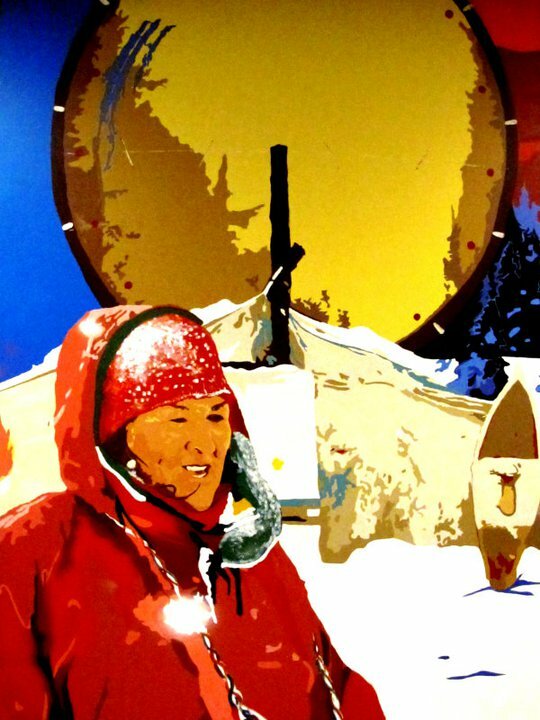 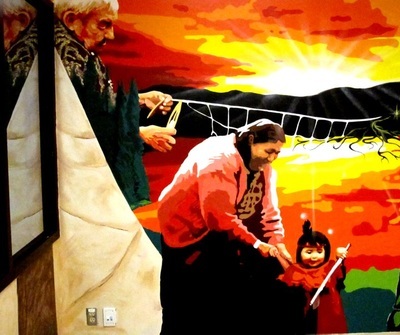 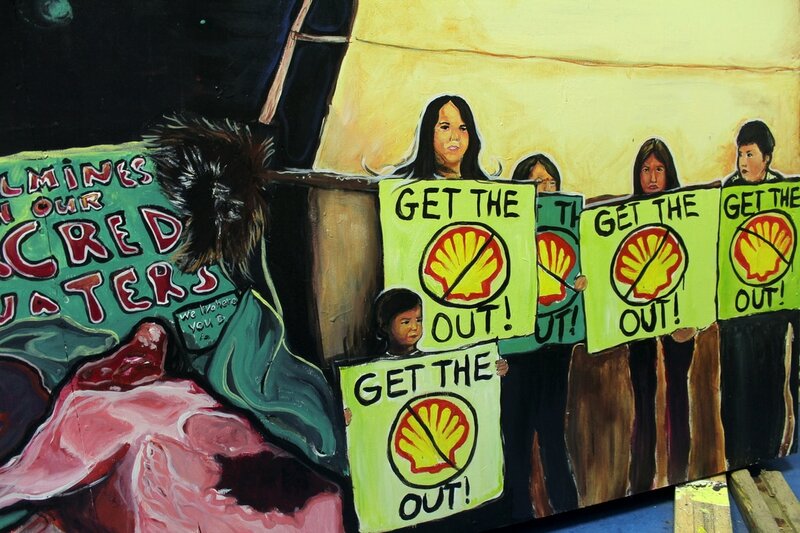 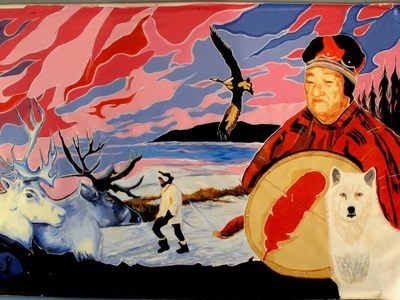 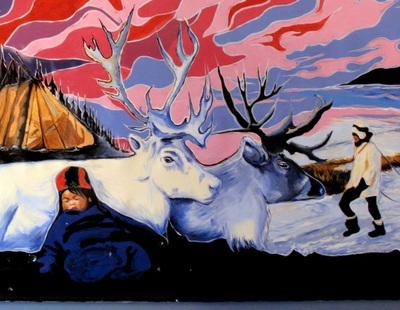 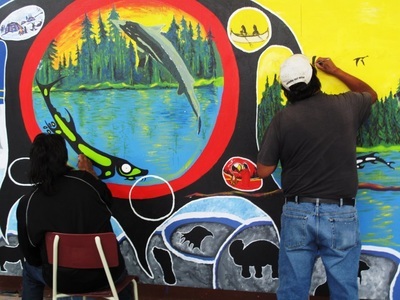 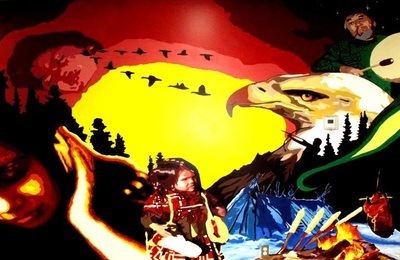 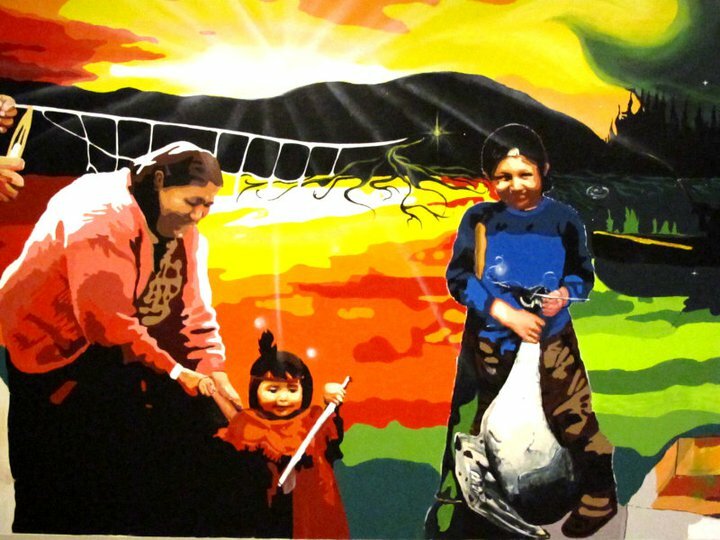 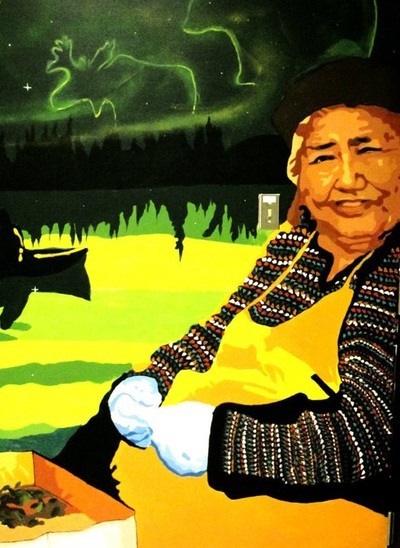 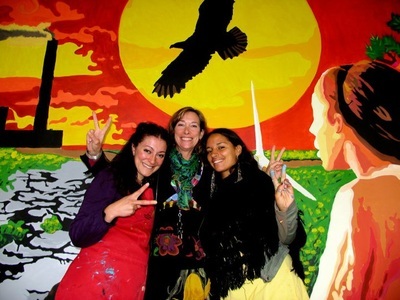 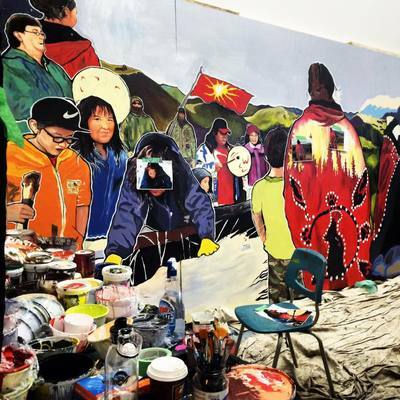 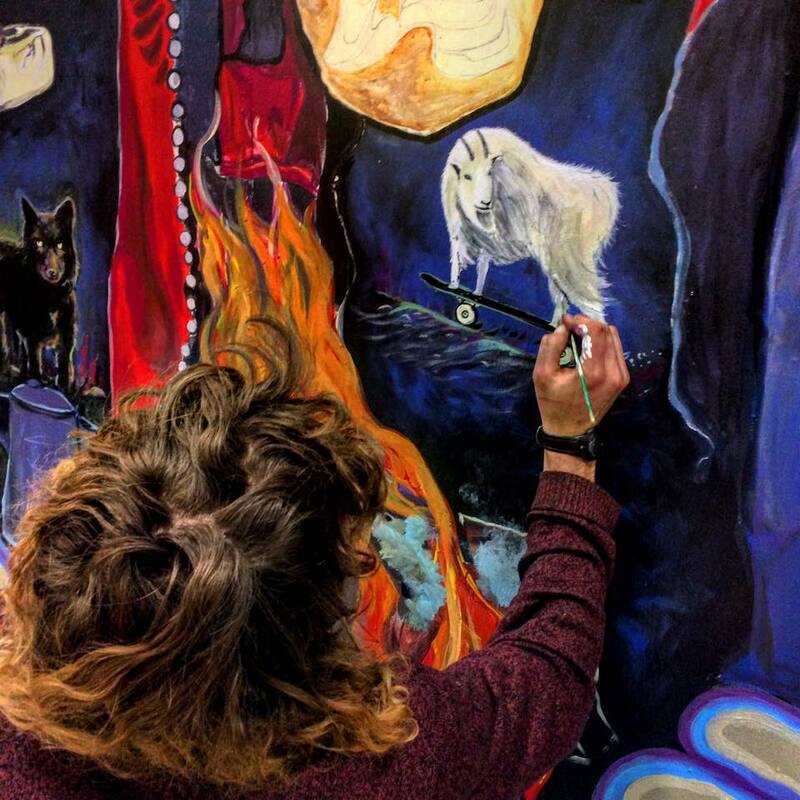 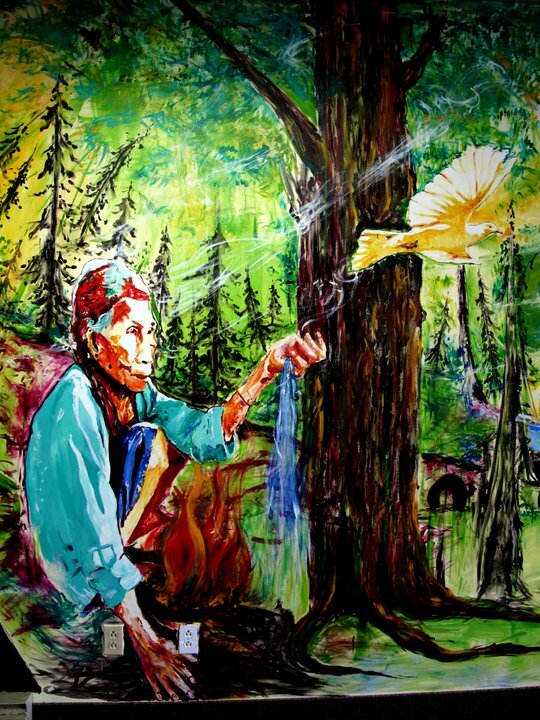 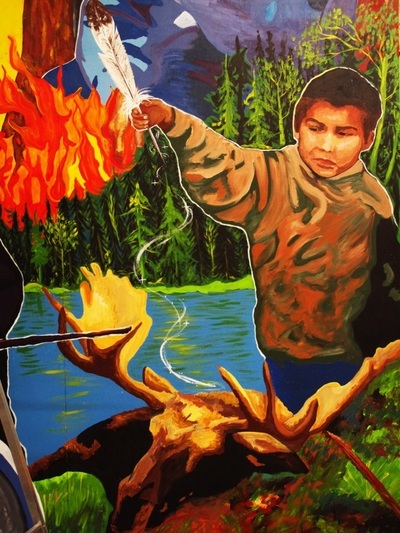 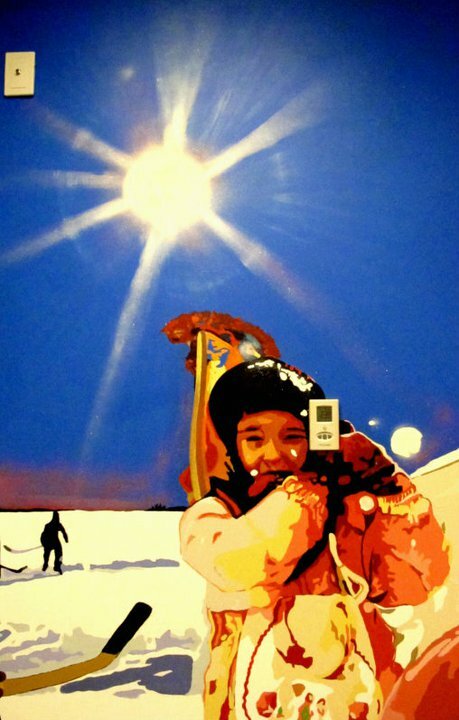 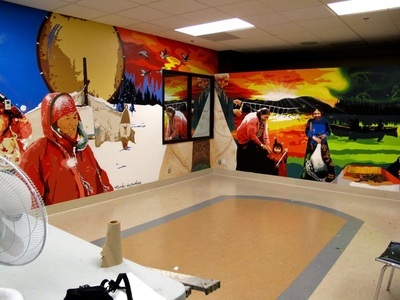 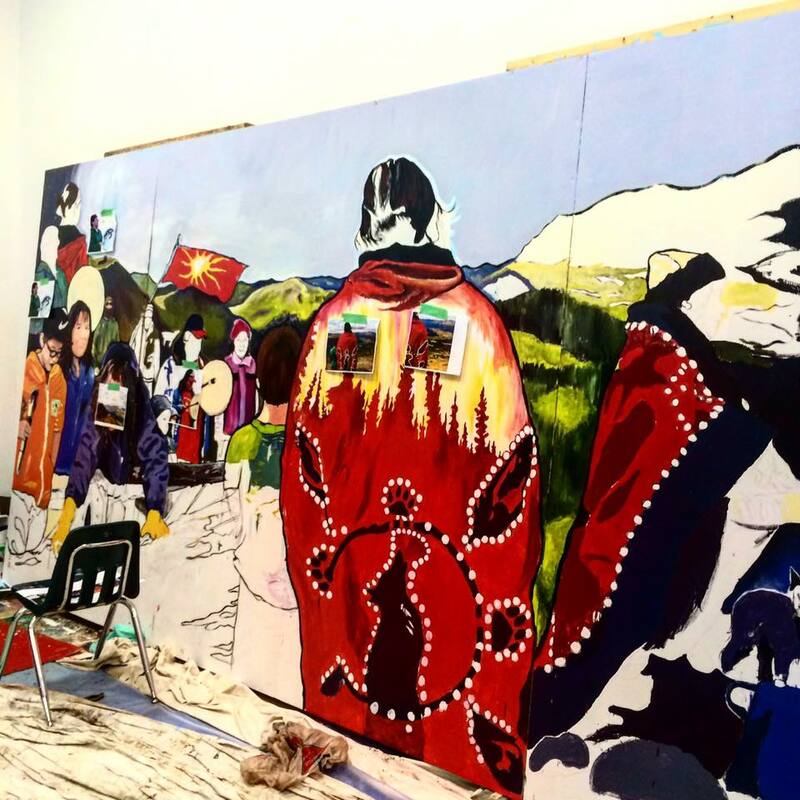 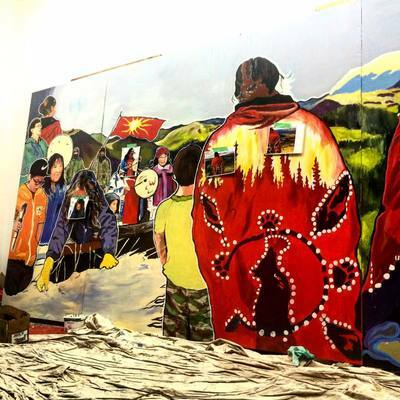 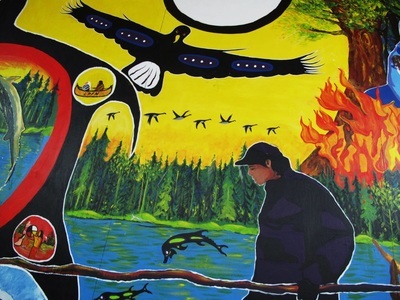 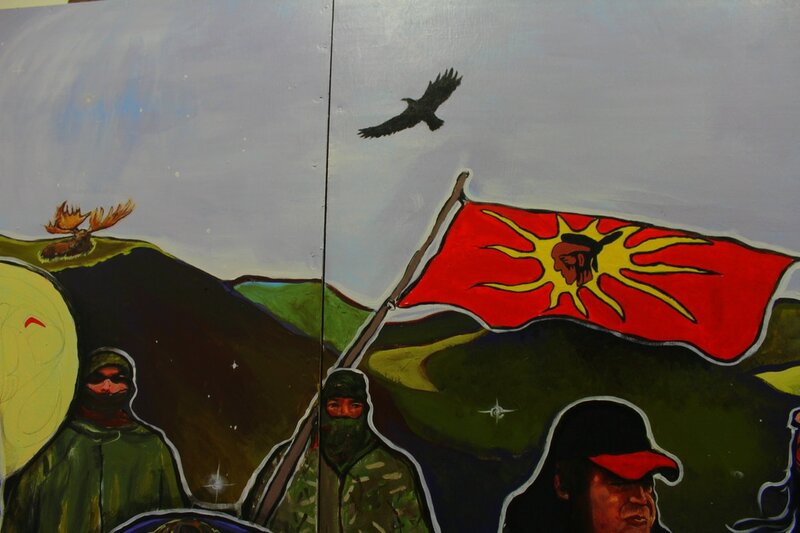 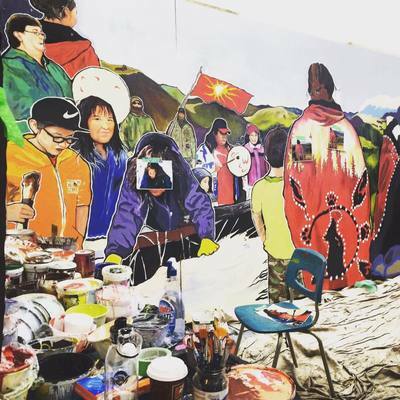 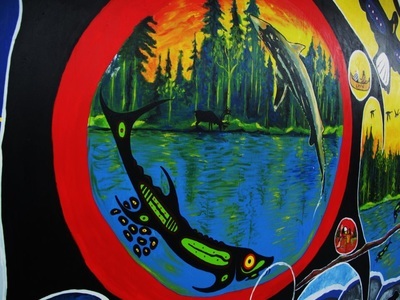 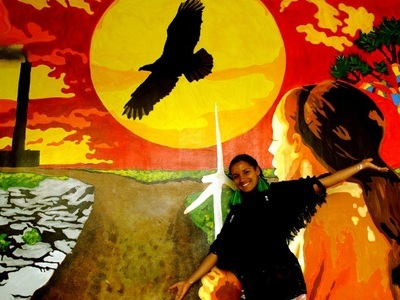 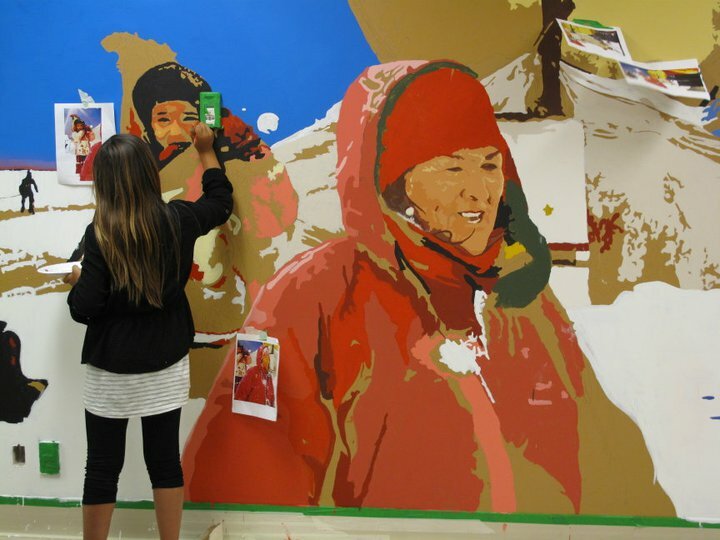 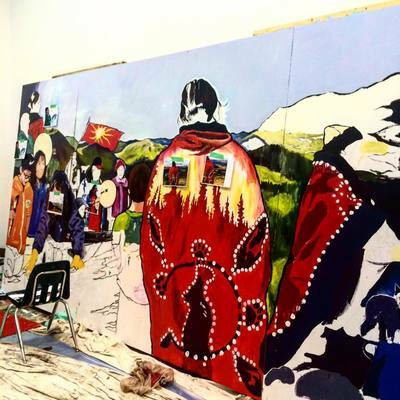 This mural aimed to bring spiritual connections, stories from activist, citizens, indigenous Innu testimonies about their relationship to this sacred site. "“It's a spiritual site for us. 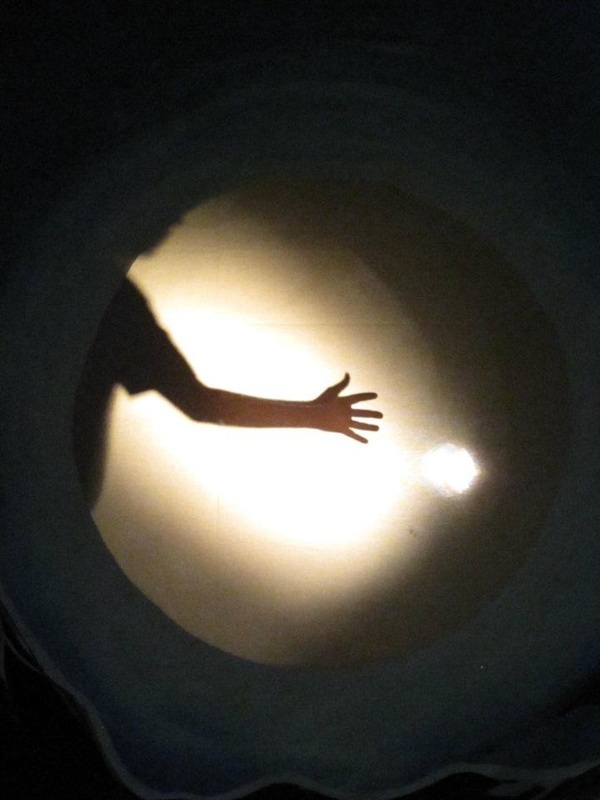 The water is life for us,” he said. “There's a pool, a beautiful place to fish, and it's very easy to go down. 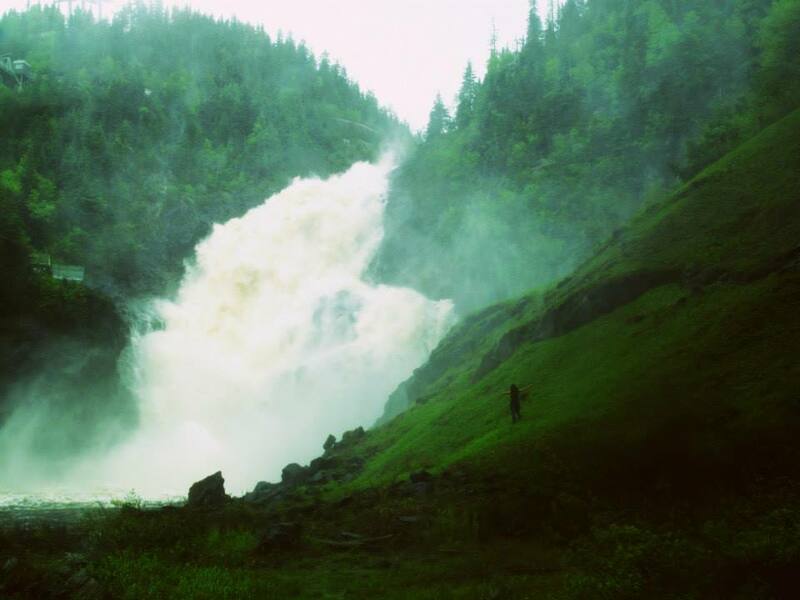 You can catch very beautiful trout.” Mikael Paul. Partnership with Fondation Rivieres, Rivières Libres Commitee (GRIP-UQAM), Murales des Peupliers. 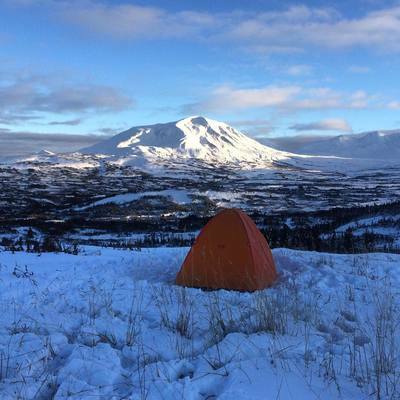 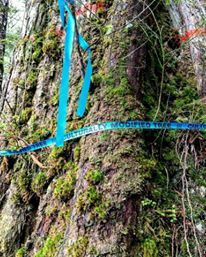 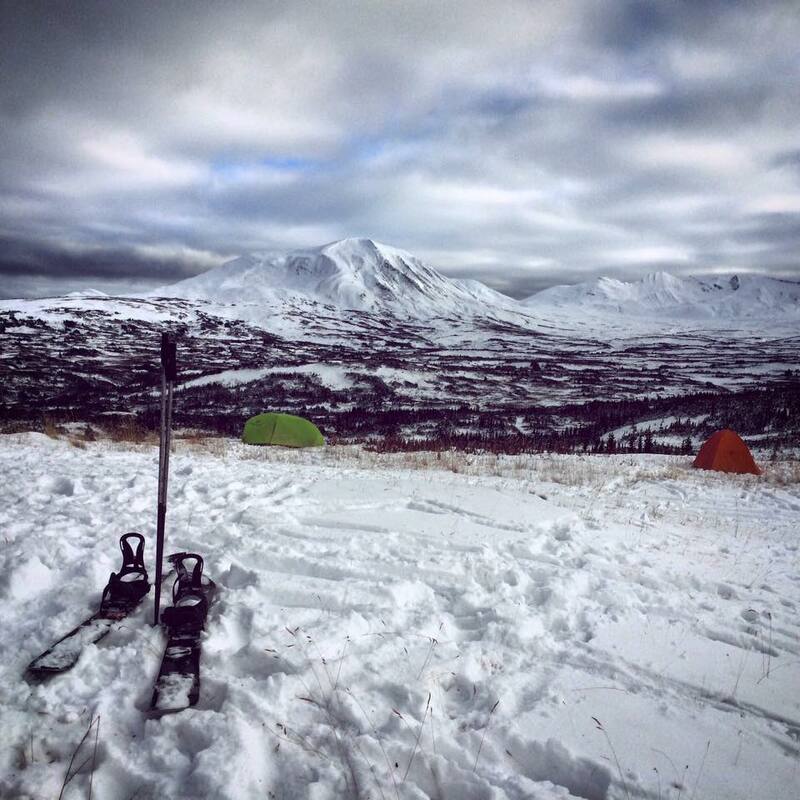 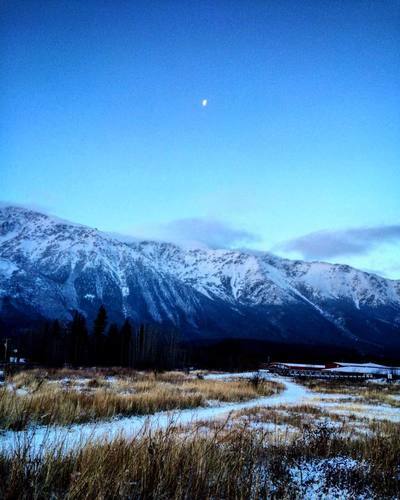 Really grateful for all the ideas, stories shared and all the efforts put with humility until the end to preserve this natural living legacy and historic site. 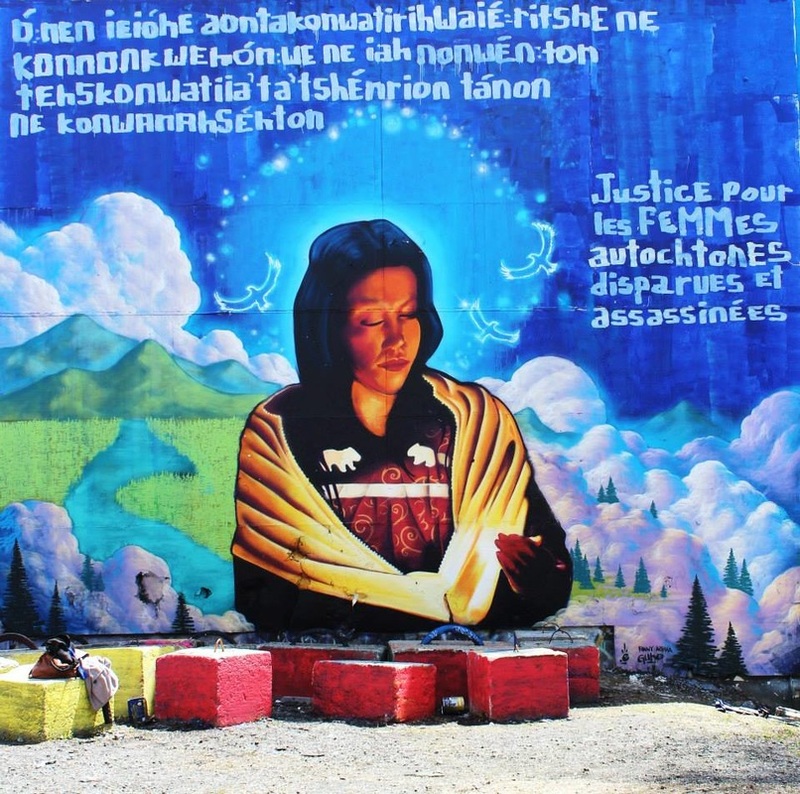 Murale créée lors du Colloque Protection des territoires, une collaboration entre La Fondation Rivières, le Comité Rivières Libres du GRIP-UQAM, Murales des Peupliers pour souligner l'implication citoyenne de la CSOV, L'Alliance Pekuakamiulnuatsh et tous les citoyens de coeur qui se sont unis dans la préservation de la Ouiatchouan et se battent avec amour pour cette chute pittoresque!! 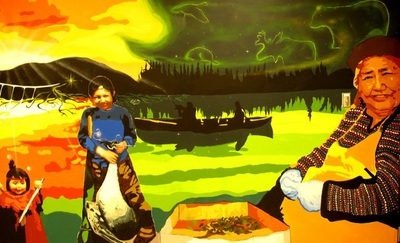 !Merci à tous les témoignages d'amour des gens qui ont nourrit les idées de la peinture et chaque main précieuse qui a permis de confectionner cette oeuvre!!! 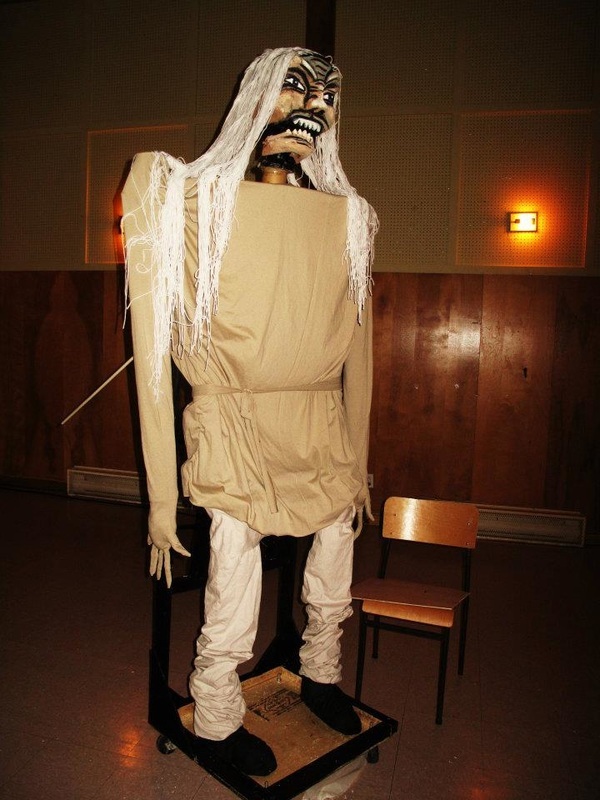 Il est inconcevable de laisser s'éteindre autant de beauté!! Collective mural commissionned by Stratégie St-Laurent in partnership of Madeleine Auclair Natural Funds. 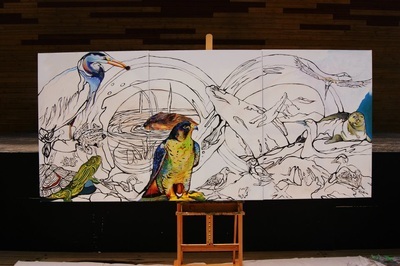 A piece to celebrate endangered biodiversity of St-Lawrence River and marine Estuary. 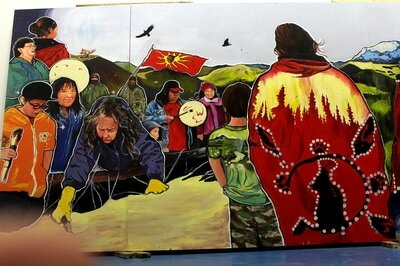 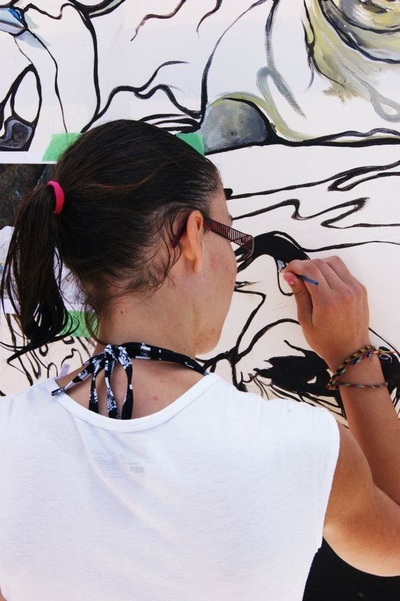 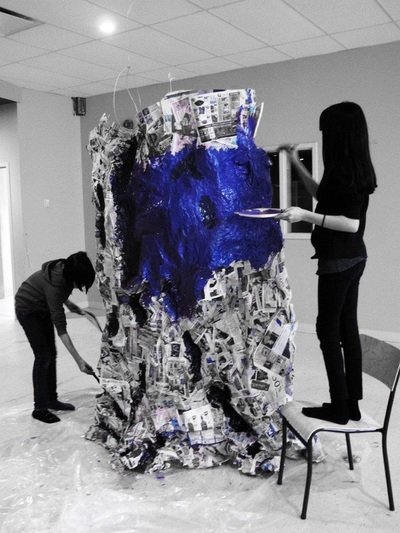 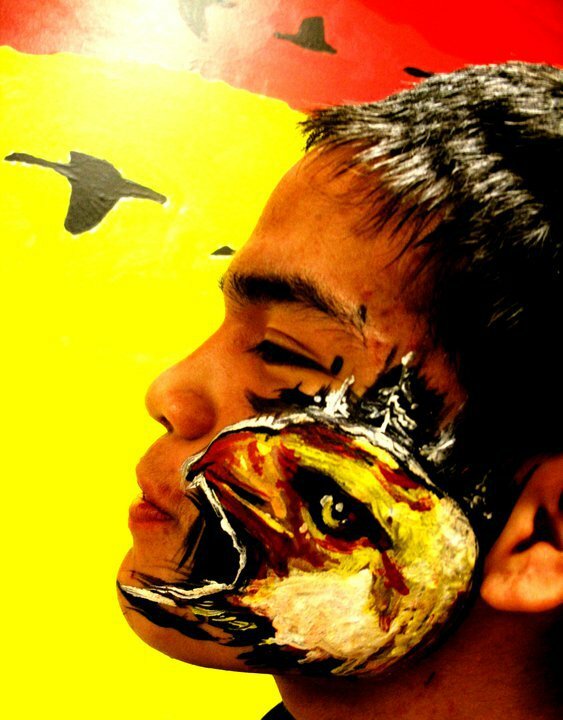 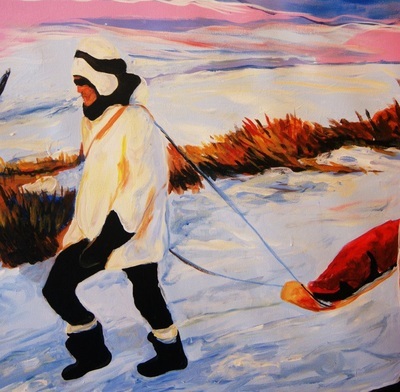 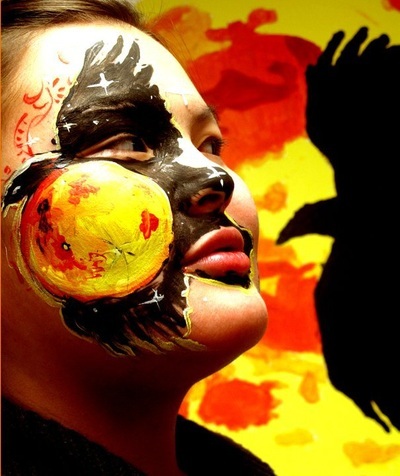 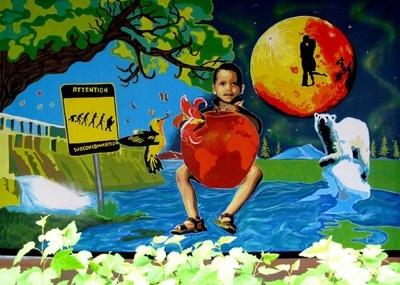 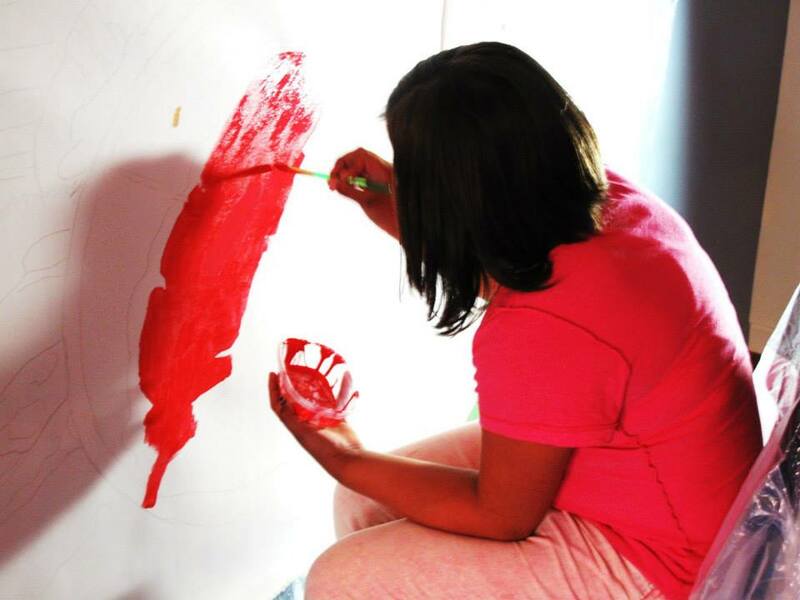 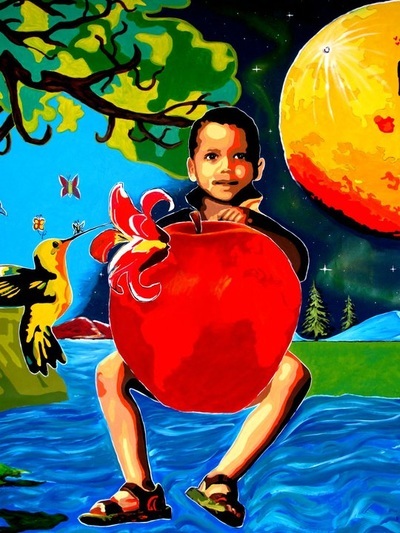 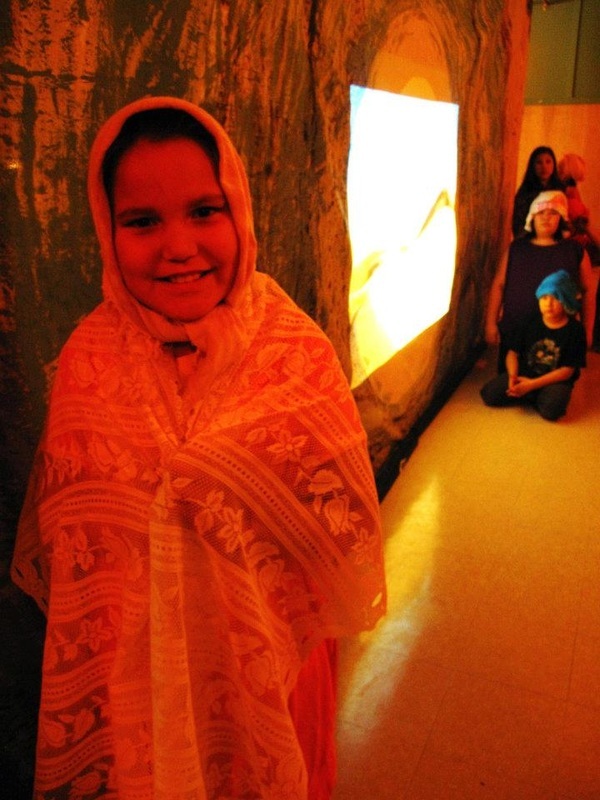 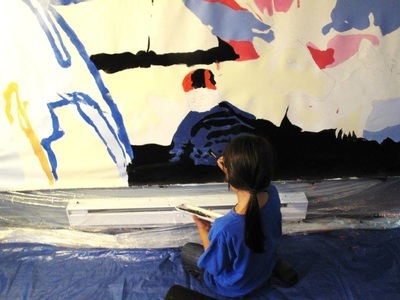 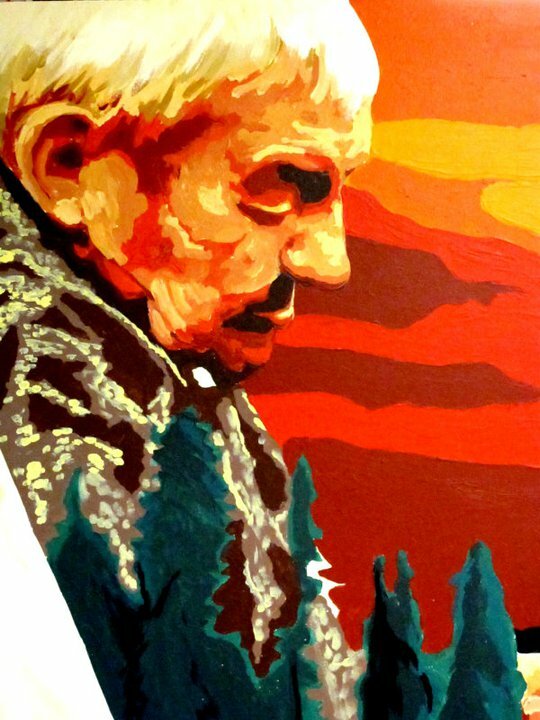 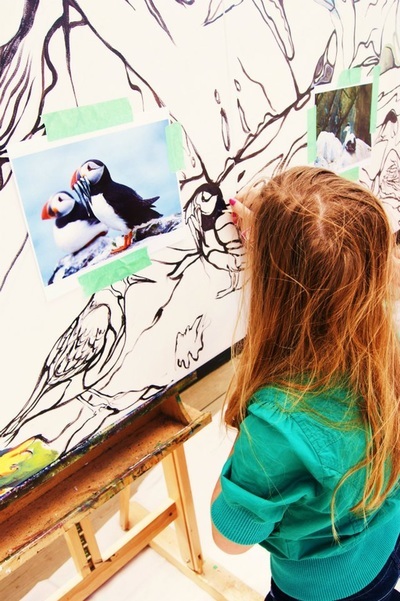 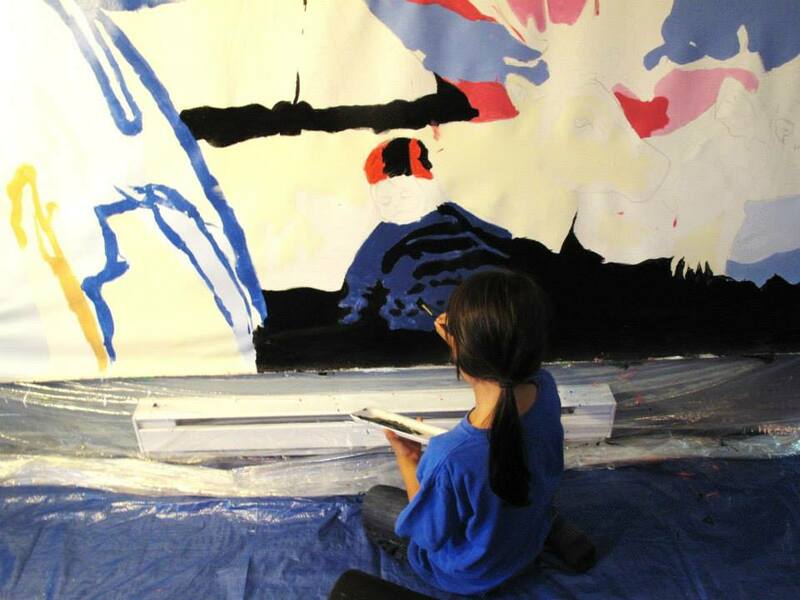 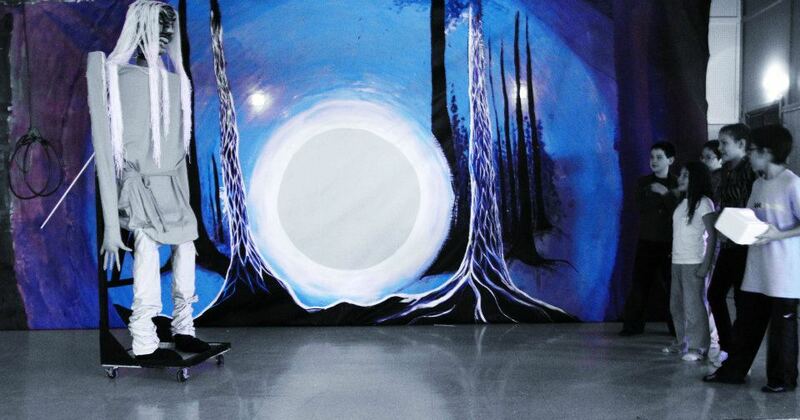 This project was painted with youth for educative purpose and is permanently exhibit at Baie de Beauport in Québec. 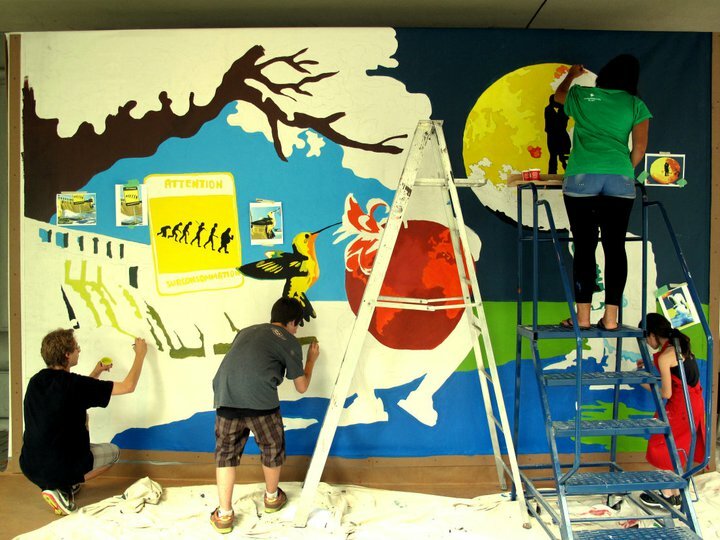 Animé par le projet Murales des Peupliers. 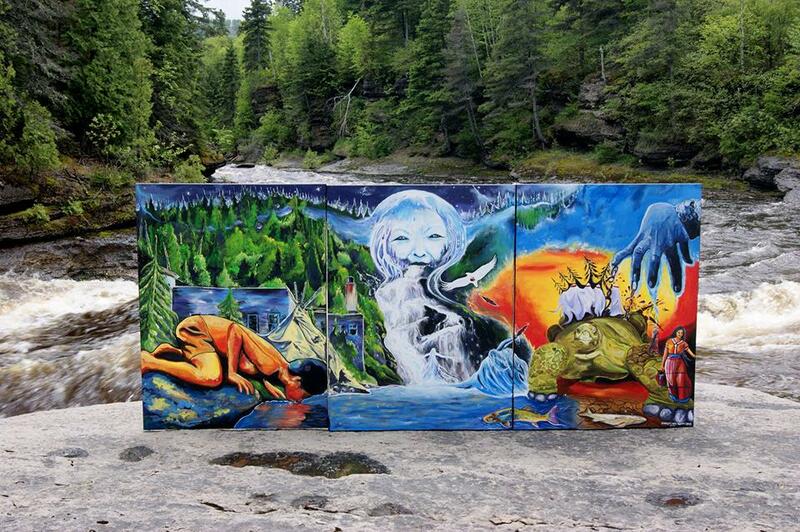 Murale réalisé en collaboration avec Stratégie St-Laurent et le Fond Nature Madeleine-Auclair. 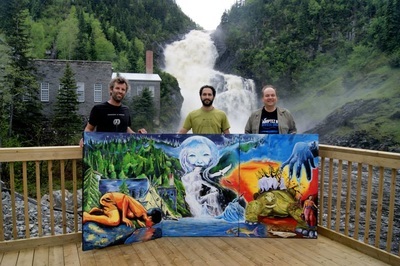 Une oeuvre pour célébrer la diversité des espèces en milieu fluvial et marin du fleuve St-Laurent. 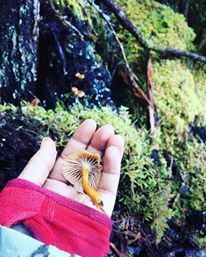 Tellement d'espèces et de vie à protéger et prendre soin. n exposition permanente bientôt à la Baie de Beauport, QUébec! 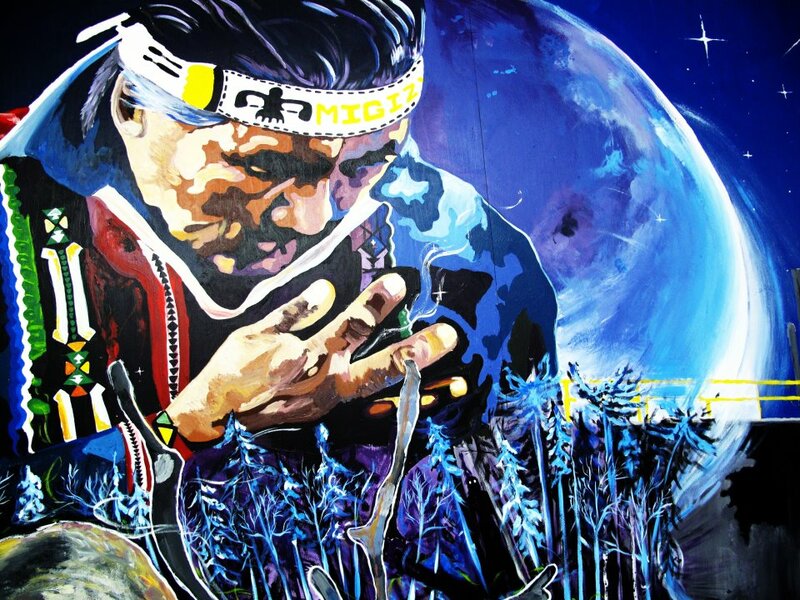 Animated by Murales des Peupliers Project. Wonderful experience and mural painted by 120 people of Mistissini Cree Community in the waiting room of the new hospital. 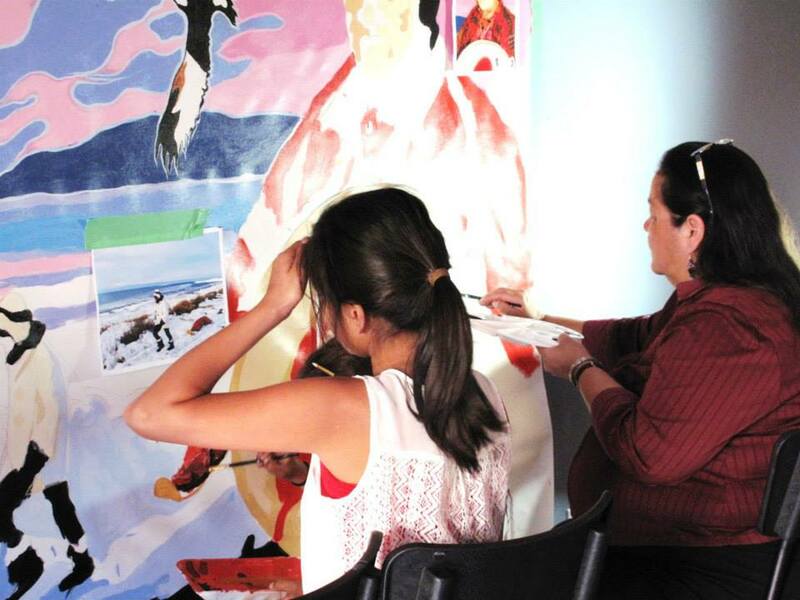 Thanks to all the community for sharing ideas, photos and teaching us about Miypimaatisiium, traditions and the importance of traditional medecine, cultural teachings and the Cree Way of Life to maintain a good health, balance of life and being alive. 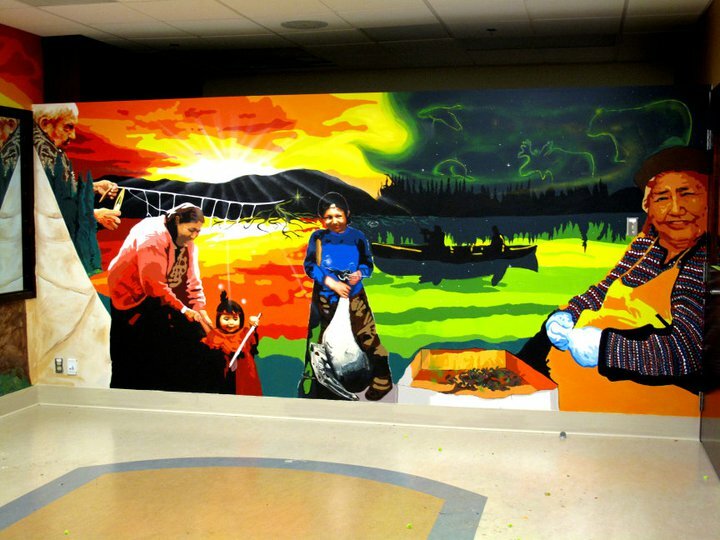 Murale peinte par 120 personnes de la communauté cri de Mistissini dans la salle d'attente de la nouvelle clinique de l'hôpital. 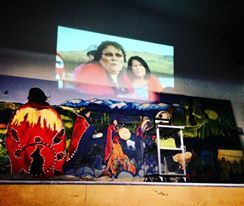 Différentes personnes ont offert des photos, idées sur le thème de Miypimaatisiium afin d'inclure des éléments des cérémonies traditionnels, de l'importance de la médecine traditionnelle, de la culture et de la relation du Cree Way of Life pour maintenir une santé, un équilibre de vie, et être en vie, bien en santé. Merci à tous les participants! 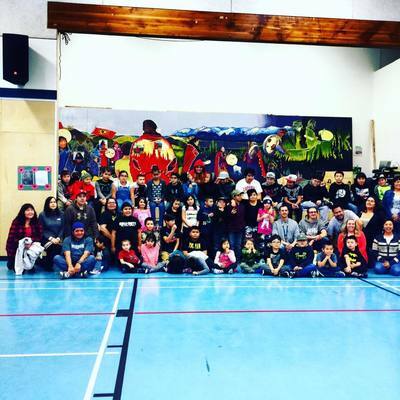 Partenariat avec le Cree Health Board, Miyupimaatisiwin aa uhchi pimipiyihtaakinuwich utih iiyiyuu aschiihch Marie-Hélène Gilbert, Head Start Program, Youth Center Staff, et toutes les belles âmes qui ont partagé des idées et enseignements ! 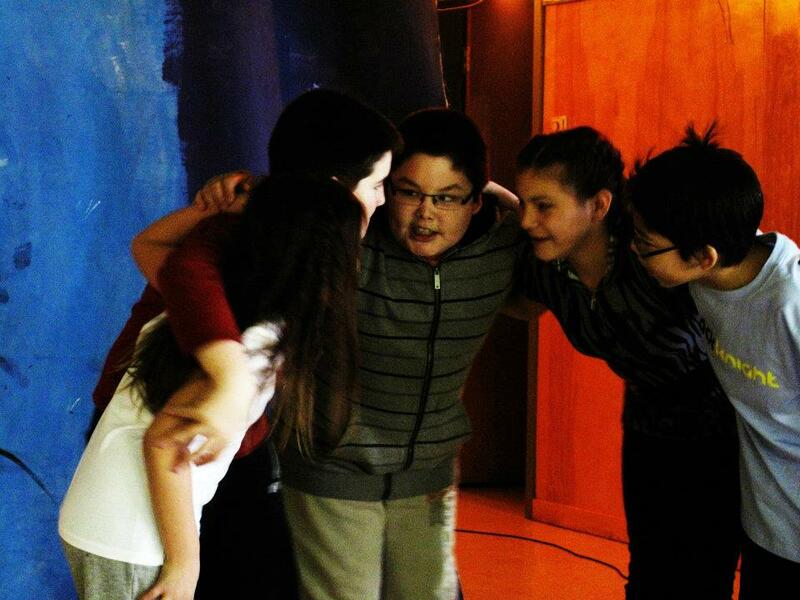 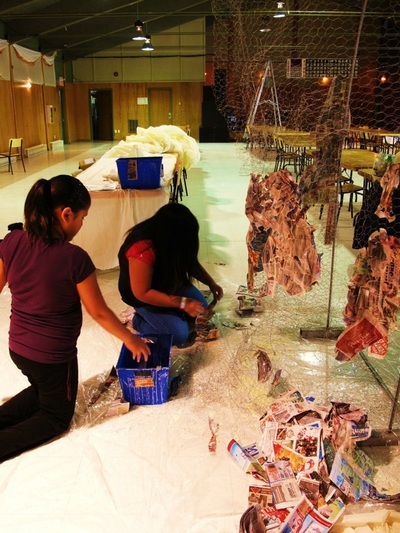 A project of play that involved 300 childrens of Maliotenam and Uashat (Johnny Pilot & Tshishteshinu School). 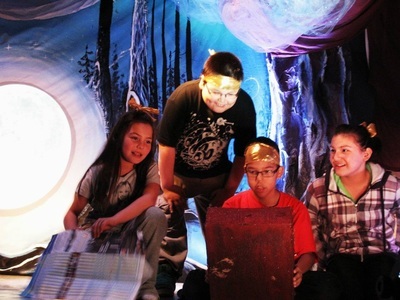 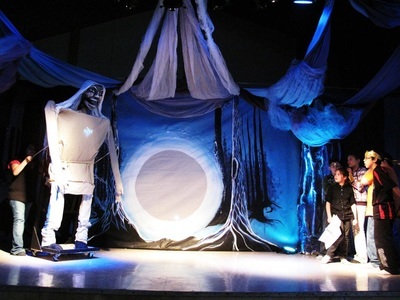 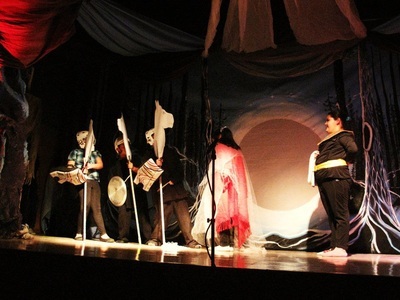 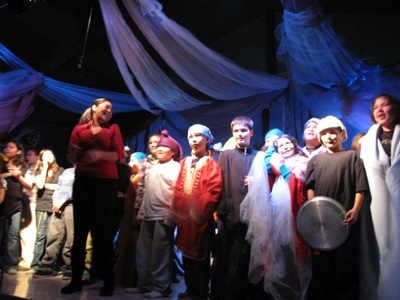 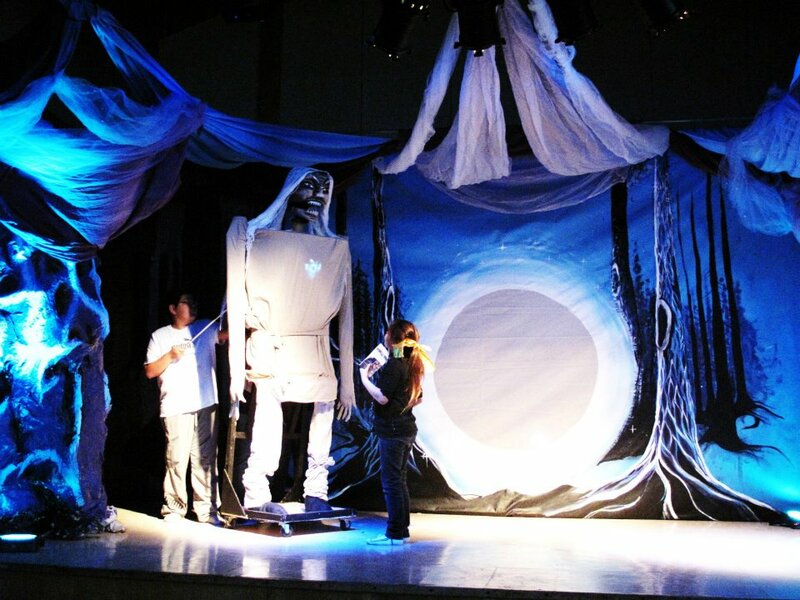 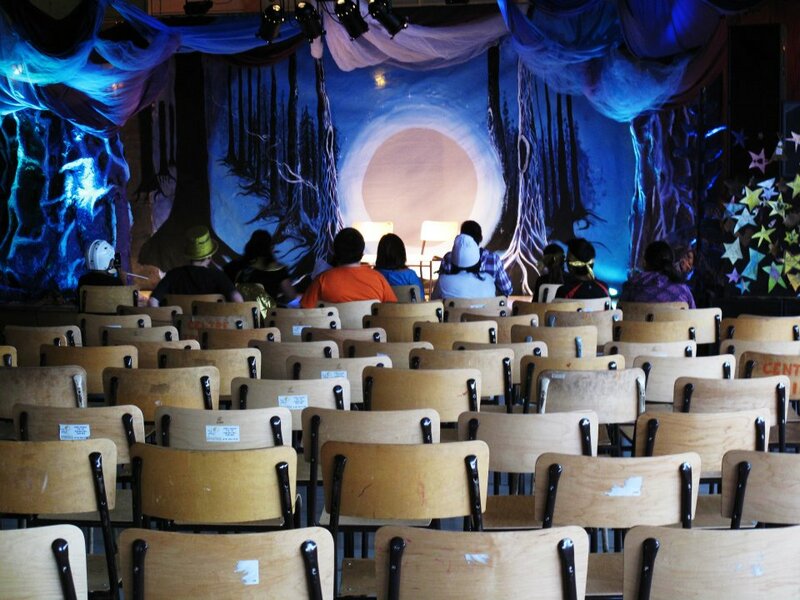 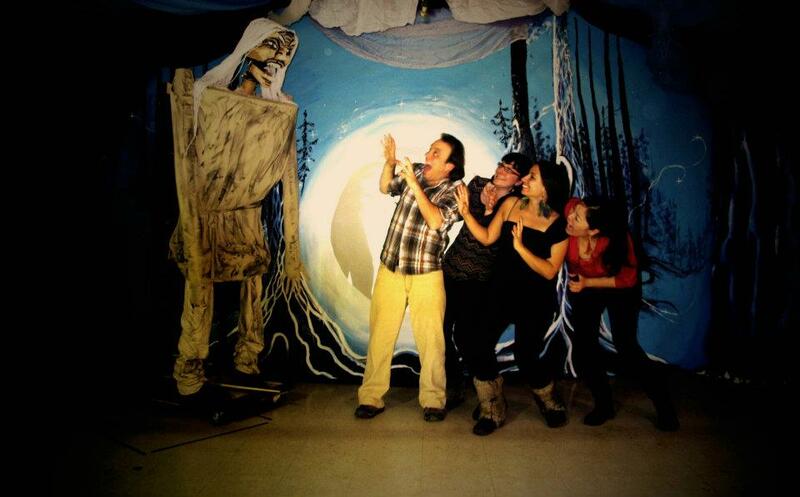 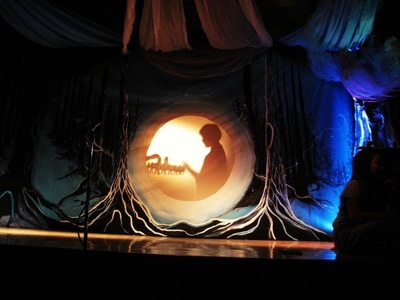 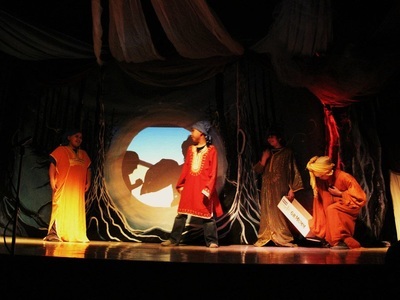 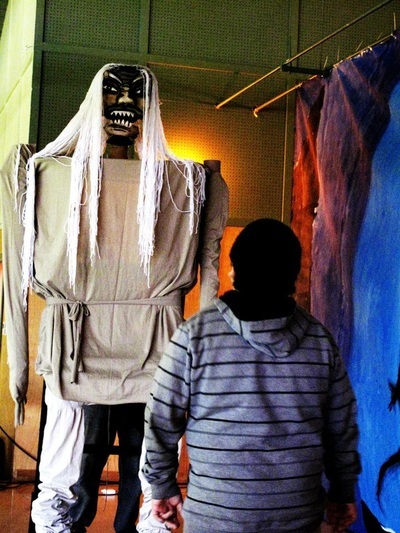 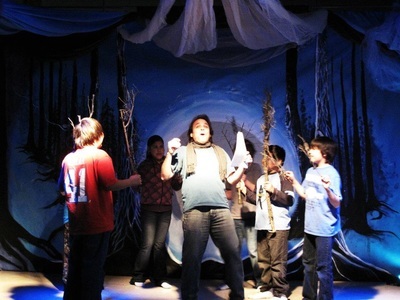 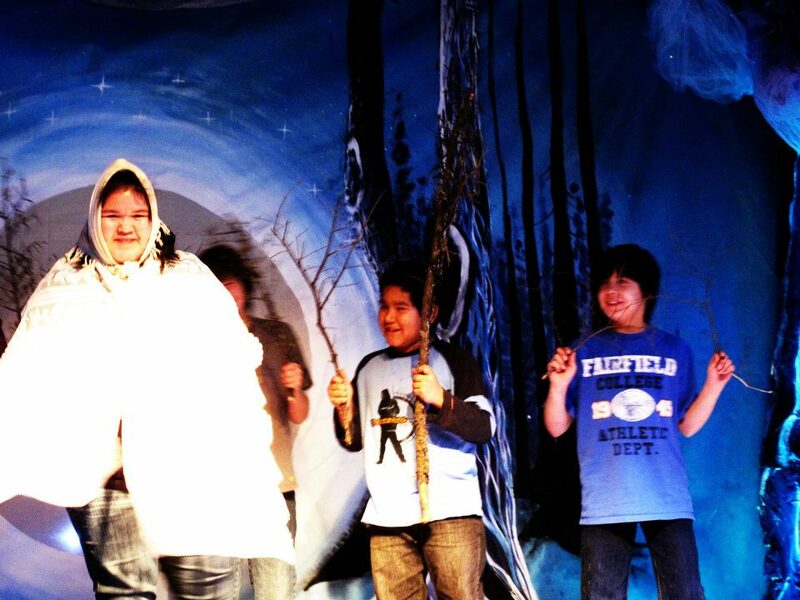 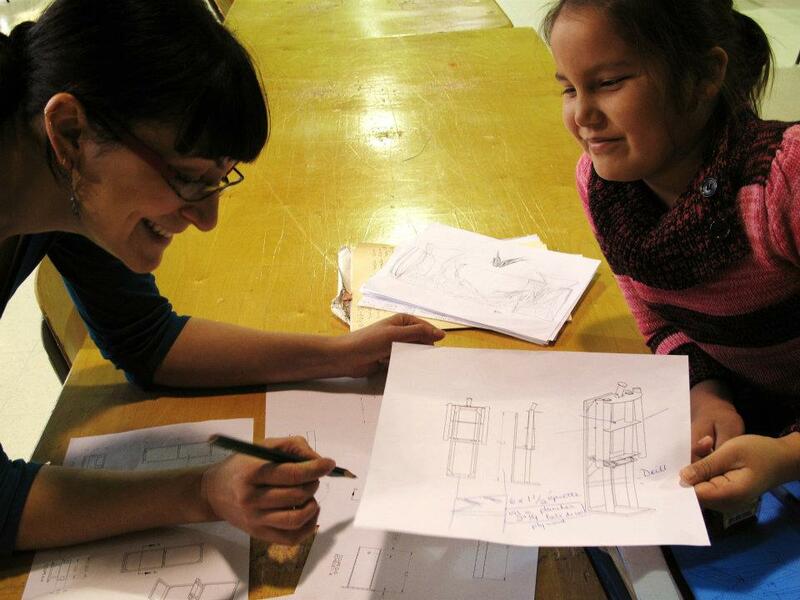 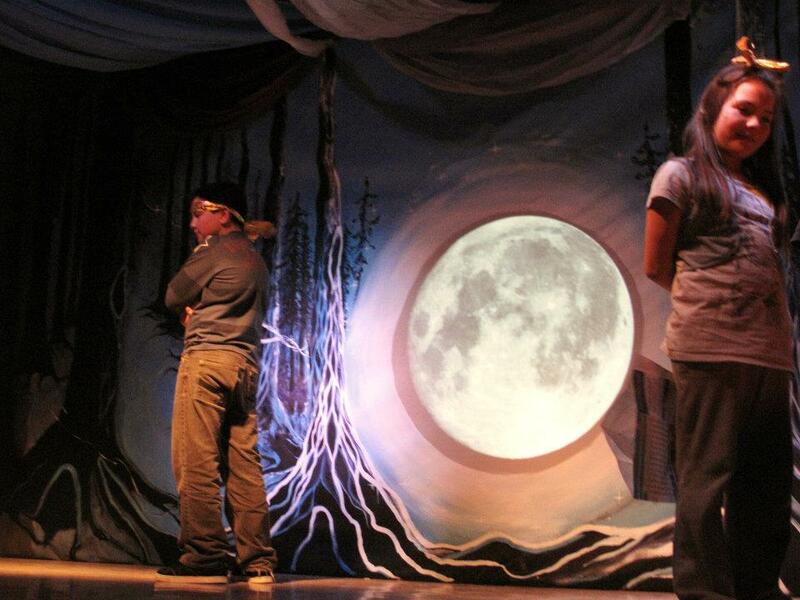 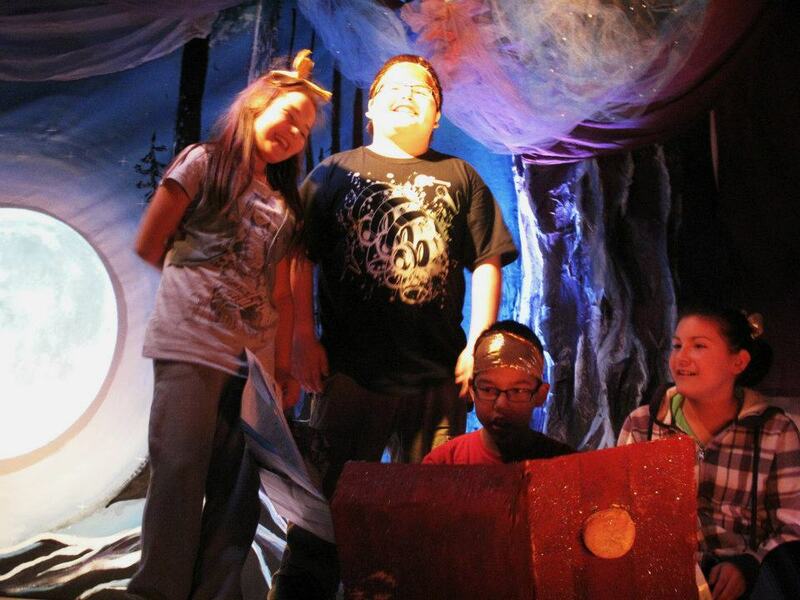 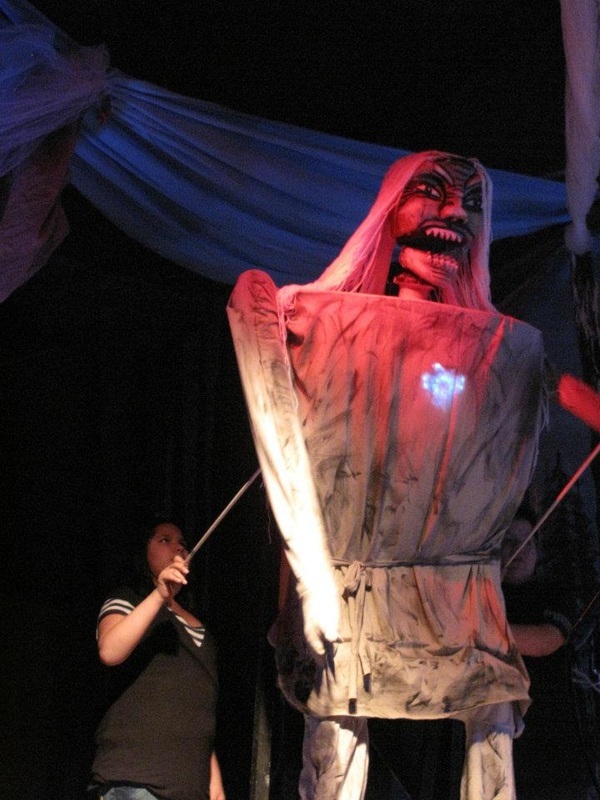 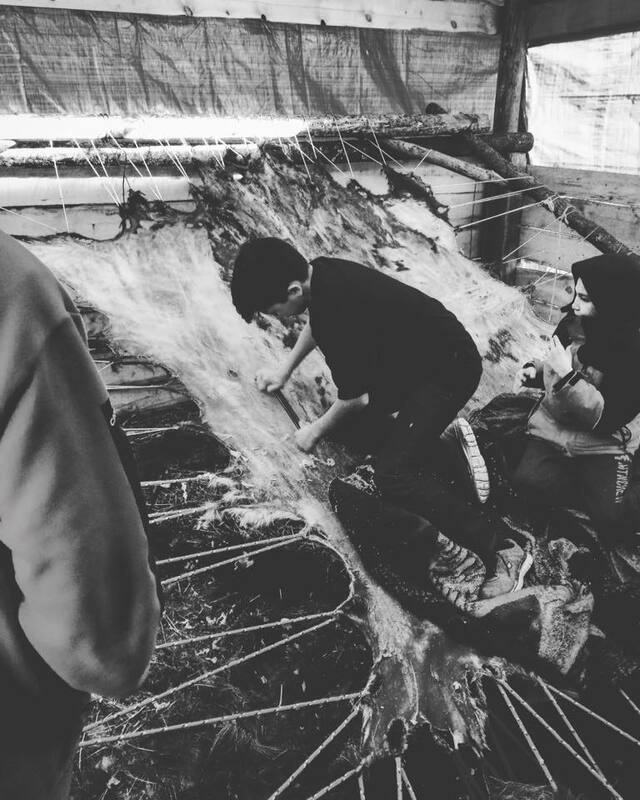 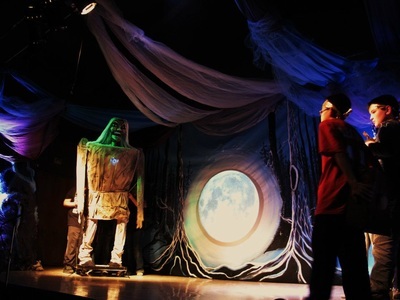 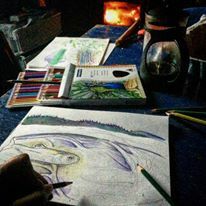 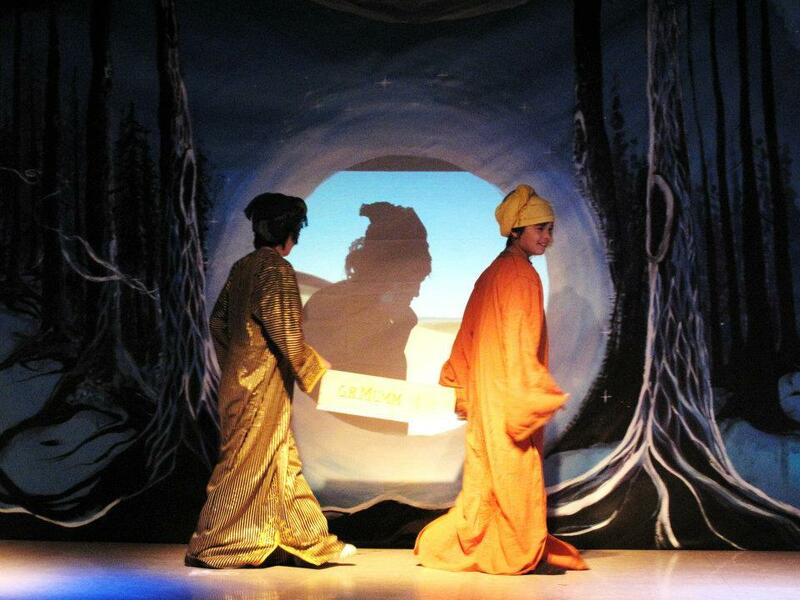 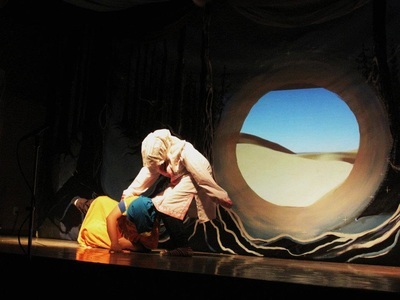 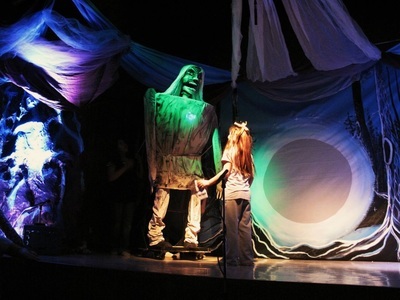 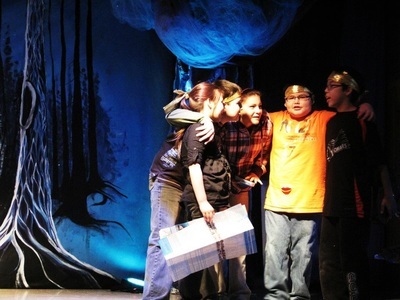 The children contributes to the show by making the scenography, decorations, actors, singer, building a giant puppet and inventing the stories that would melt the cold heart of the Windigo. Collaboration with Papu Auass Productions. 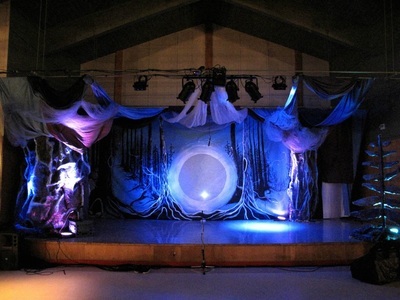 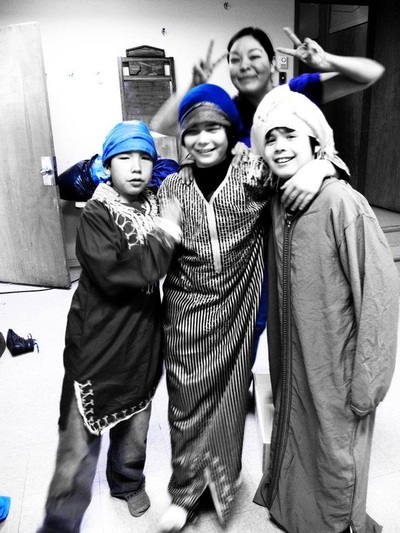 Tshinashkumitin to the Principals of both schools Sylvie Pinette and Marie Fontaine to offer this opportunity to involve their youth in this magical christmas show! 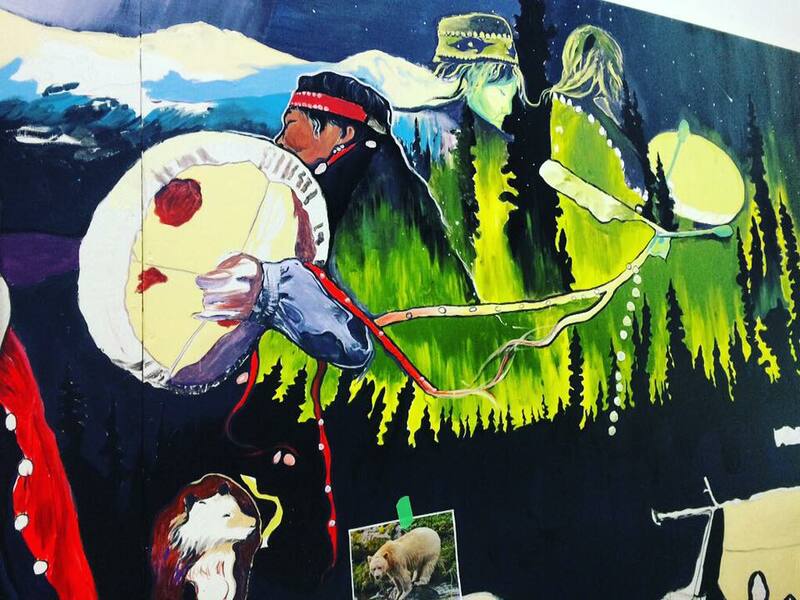 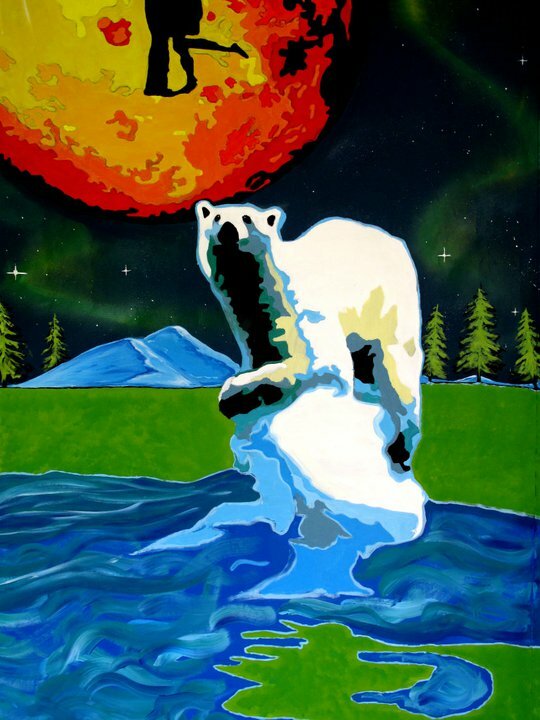 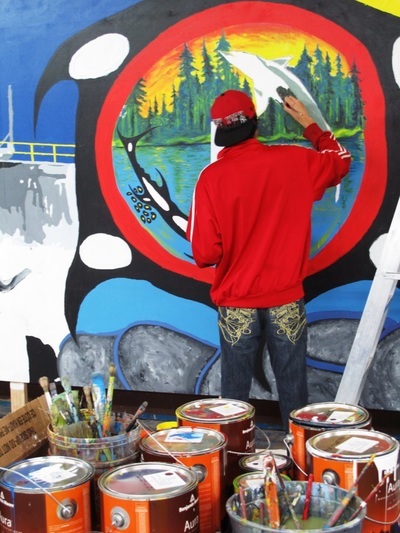 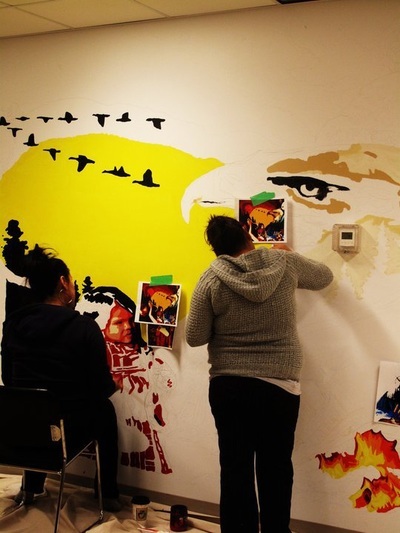 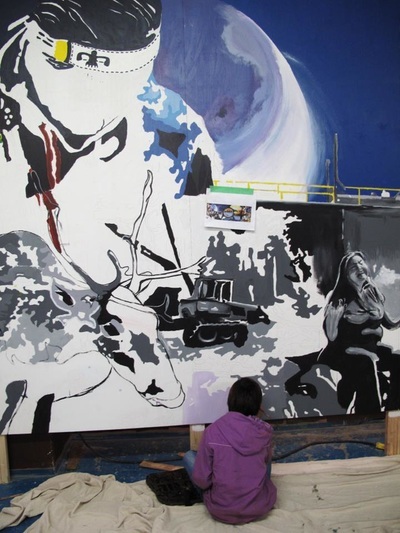 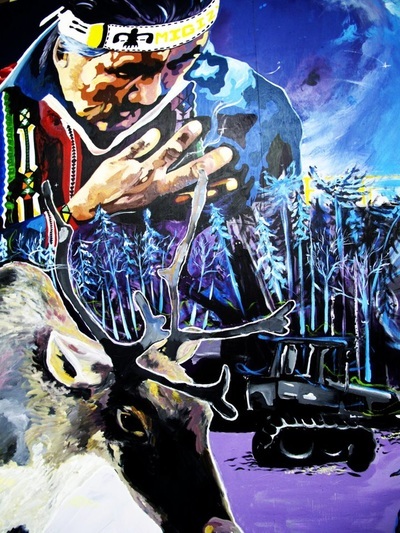 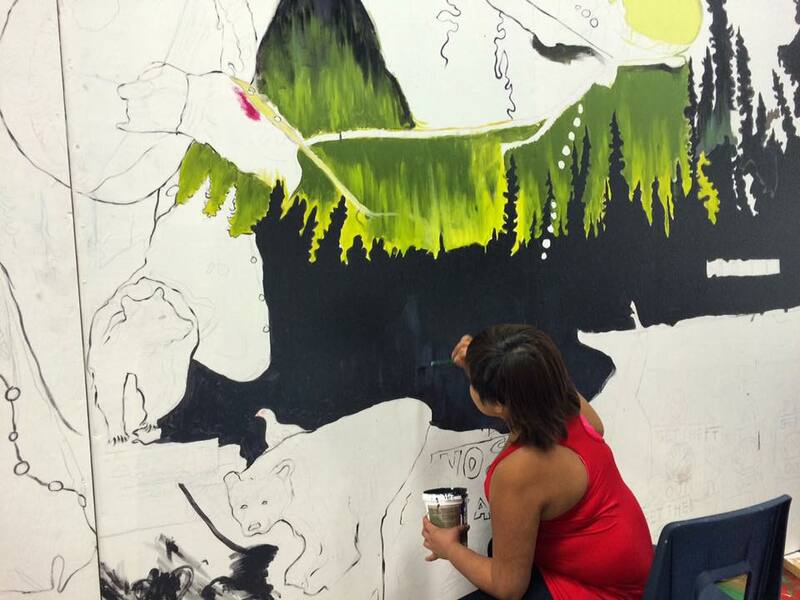 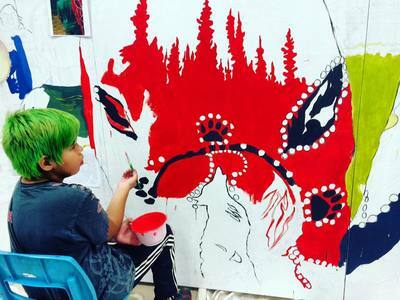 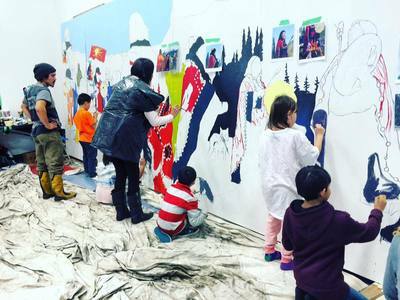 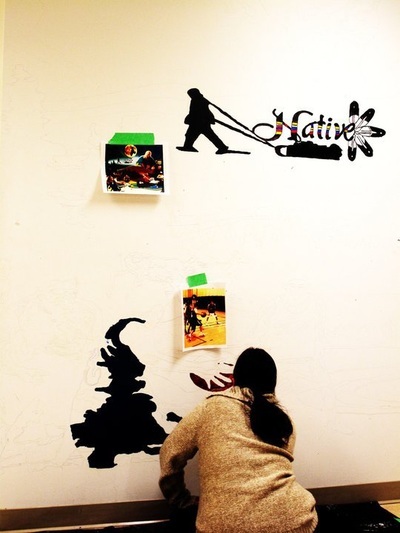 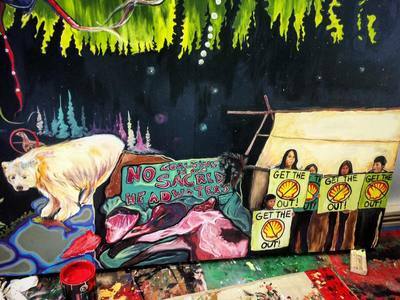 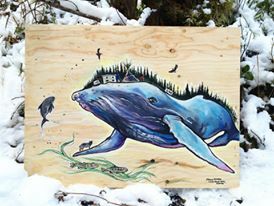 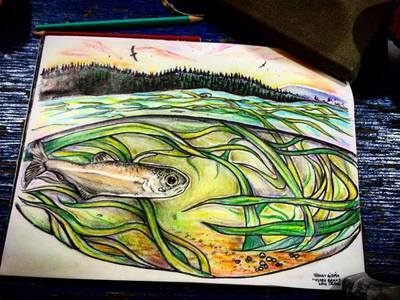 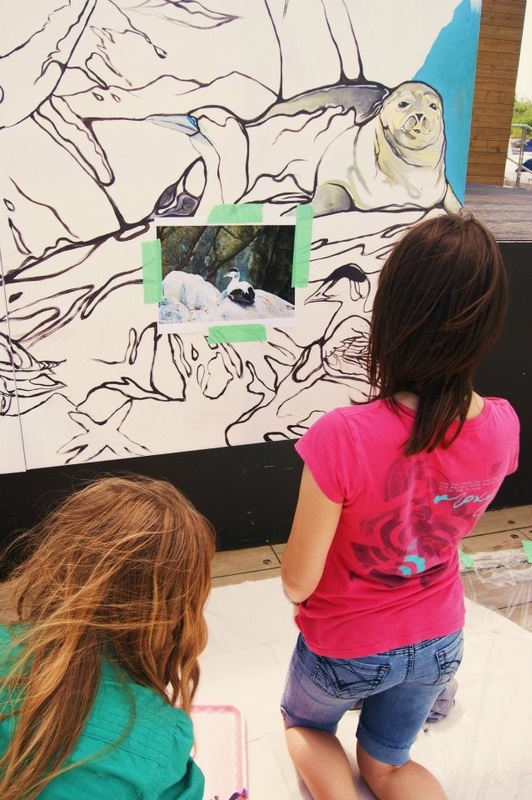 Participative Mural commissionned to work with youth and community to learn about their relationship to the Esturgeon and Cariboos as they are 2 species at Risk. To paint about traditions, teachings, visions they valued to protect all life and what wisdom they would like to transmit outside the community. 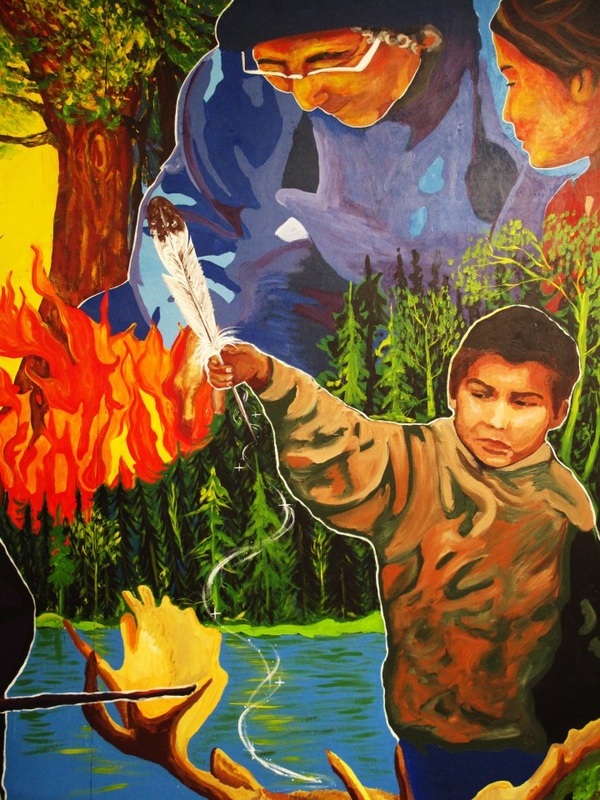 We learned a lot about the impact of damming, clearcutting, land abuse and colonial violence that affect Anishinabe People and the balance of their traditional lands. 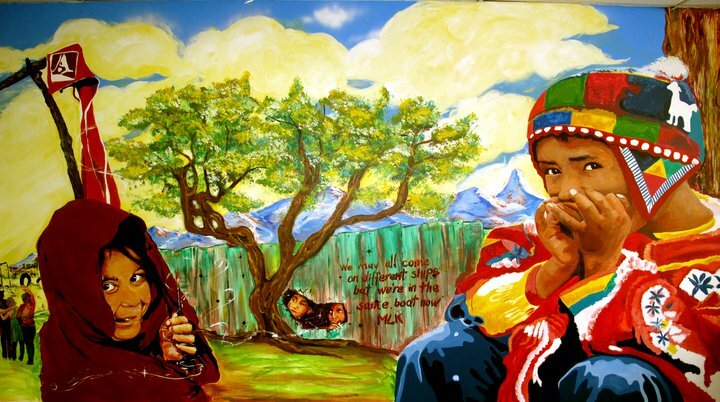 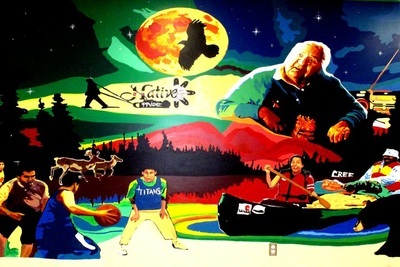 In the mural we can see 7 grandfather teachings represented in order to maintain a relationship of respect with all life. 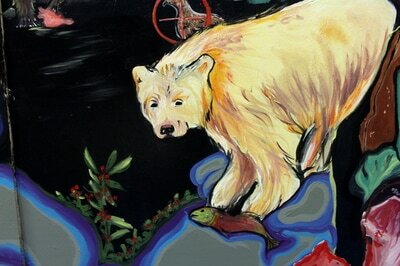 We can see too the gratitude of giving tobacco when animals offers their life to sustain humans. 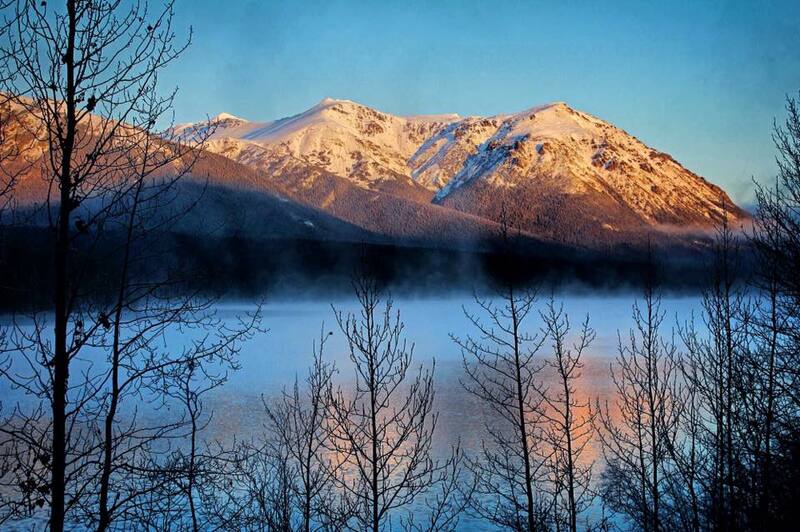 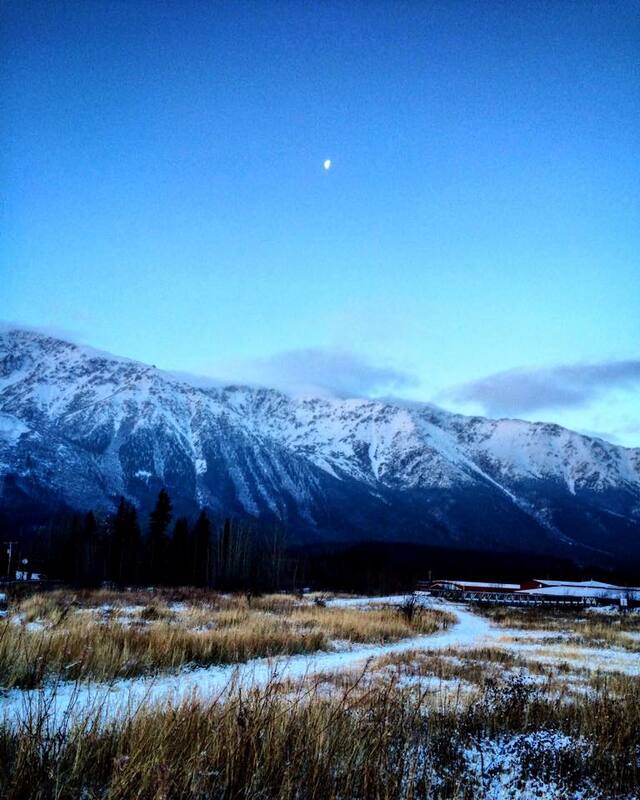 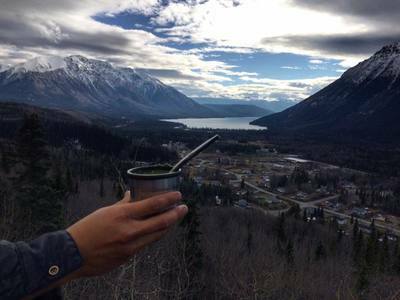 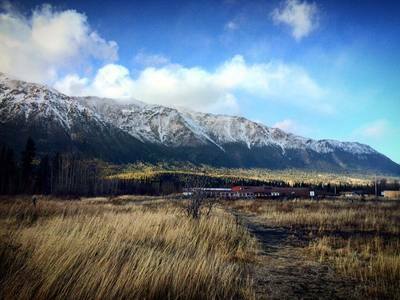 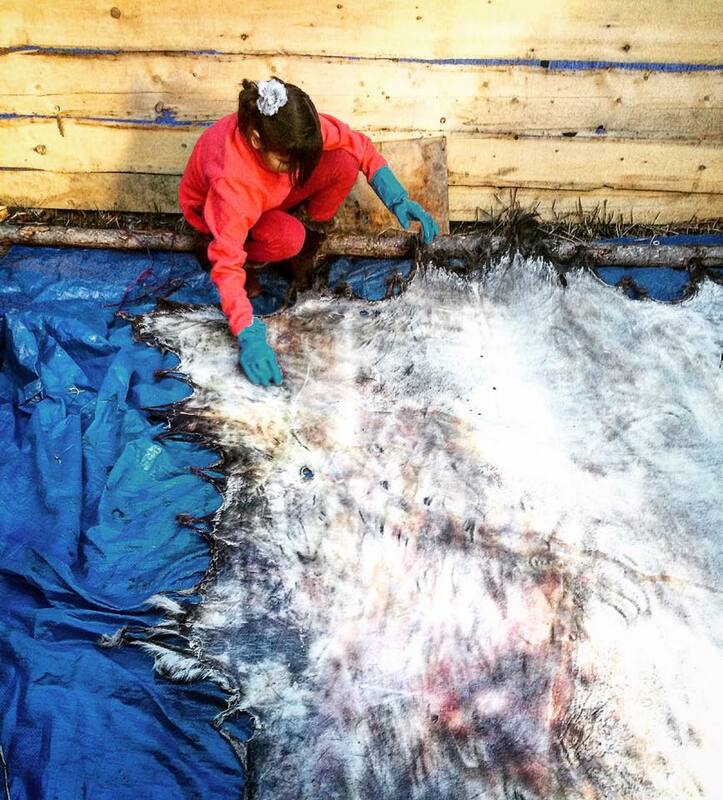 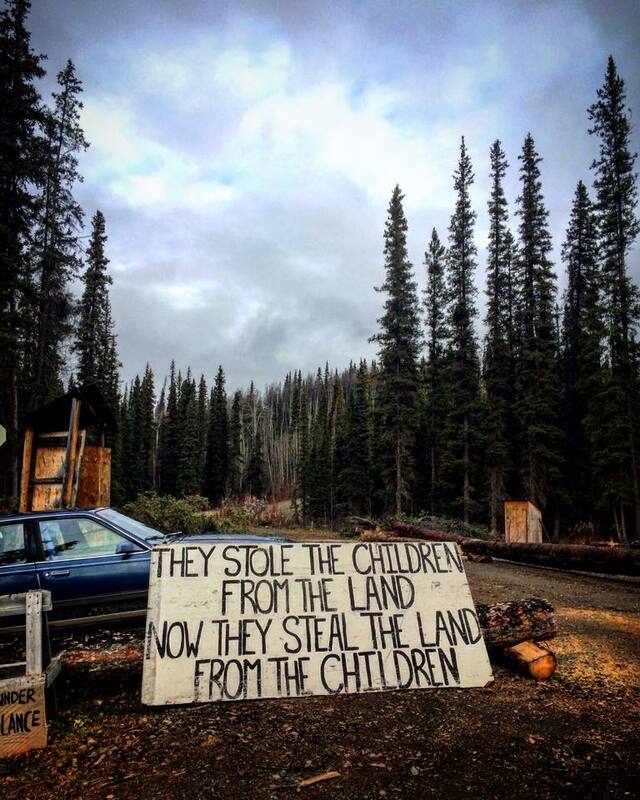 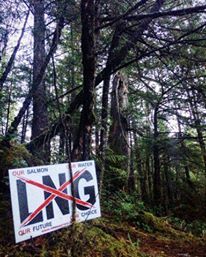 Today, we can't really see anymore cariboo as their food has been destructed by industries extractivism. 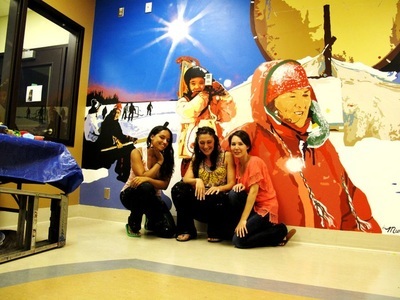 There were so many stories shared, i'm really grateful to have visit!! 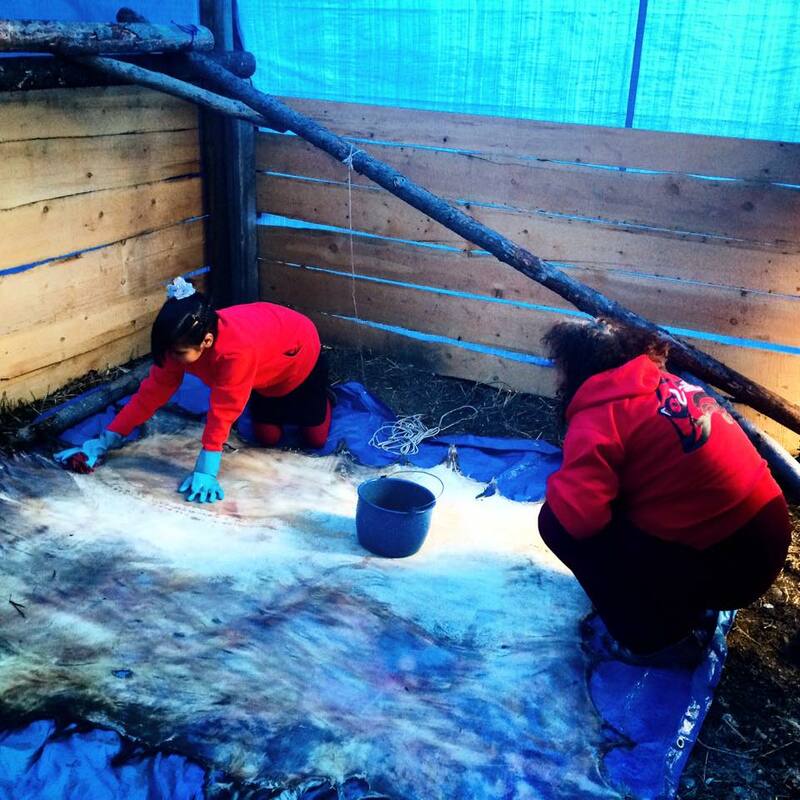 ​Partnership with Long Point First Nation (Winneway), Amo Ososwan School, Council of Anicinapek of Kitcisakik, Murales des Peupliers, Species at Risk Indigenous Fund. 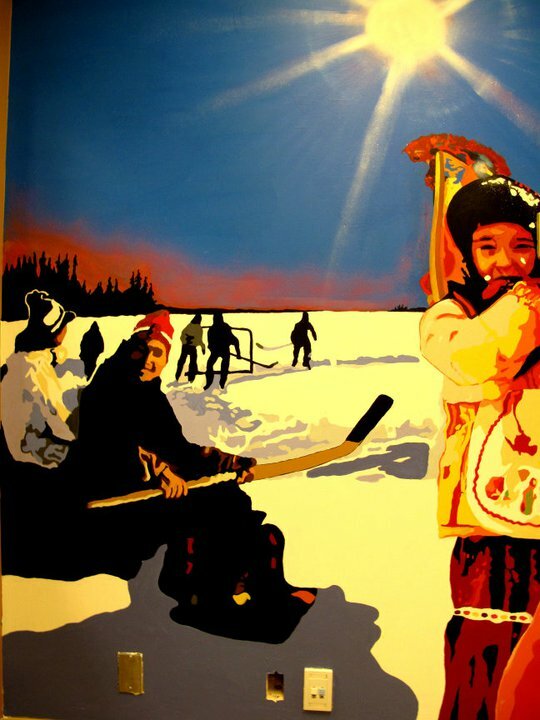 Meegwetch to all the artists, heartists:) !!!!!!! 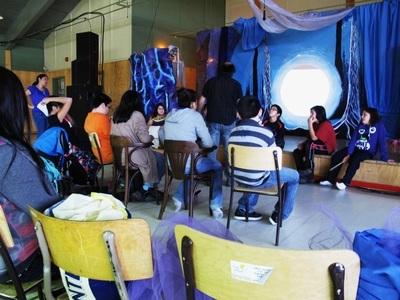 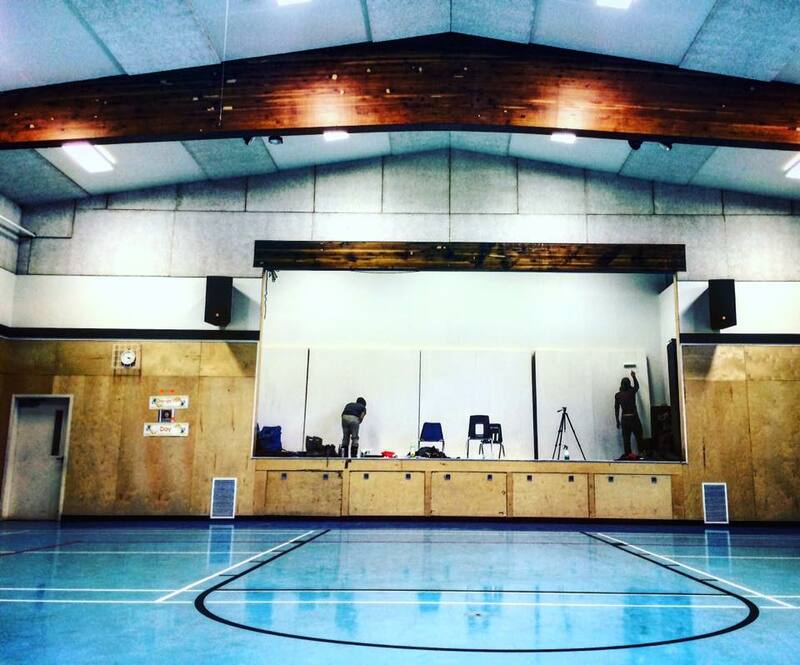 Amo Ososwan School à Winneway, le Conseil des Anicinapek de Kitcisakik, Murales des Peupliers et le Fonds Autochtones d'Environnement pour les espèces en péril. 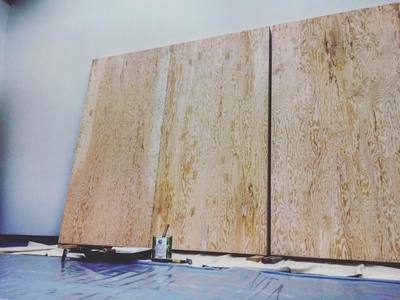 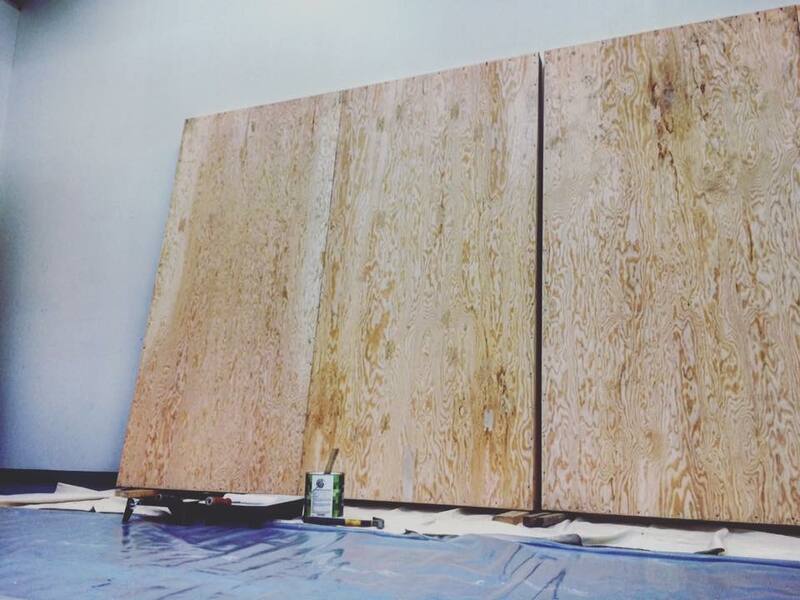 35 feet X 9 ft. Thanks to Michel Lambert et Alternatives for concrete actions of change everyday here and abroad. Thanks to Caroline Tagny, Mariel Rosenbluth, Parker Mah, Julie Langelier, Marie Lalonde, Noe, Nirah Shirazipour for photogtaphic references! 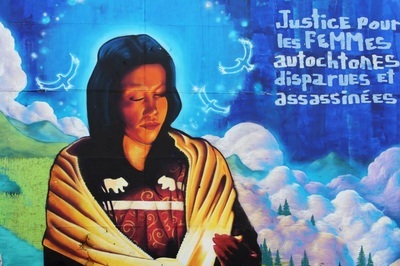 Que tous les peuples se rencontrent dans l'unité et la justice! "The Air of Our Choices" & Who Does Waters Belong To? 2 Mural 16 feet X 10 ft.
Partnership with Murales des Peupliers, the Museum Québécois de Culture Populaire, Festival Urbain of Trois-Rivière, Jeunesse HipHop Mauricie, Action Jeunesse, the Youth Centerl'Entr'Amis, Projet of Criminality Prevention (Plein Art) & Youth from Mauricie region.. L'Heure est graff is a local projet of street art that explore muralism, graffiti and street art elements involving community. This project was done on ideas shared by youth and concern about consumption values, stewardship of natural element like soil, air, water and our choices as human to choose directions that honors all life. 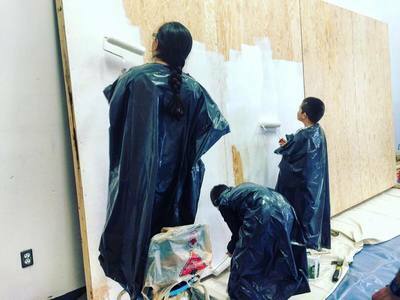 La murale a été bâti à partir d'idées de la communauté sur les préoccupations de la surconsommation, la contamination. 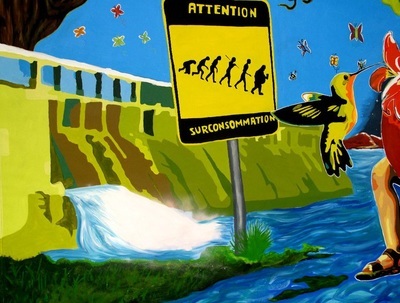 À qui appartient les éléments naturels comme la terre, l'air, l'eau et se rappeler que l'humain est un être de choix qui peut choisir une direction qui honorent les êtres vivants. 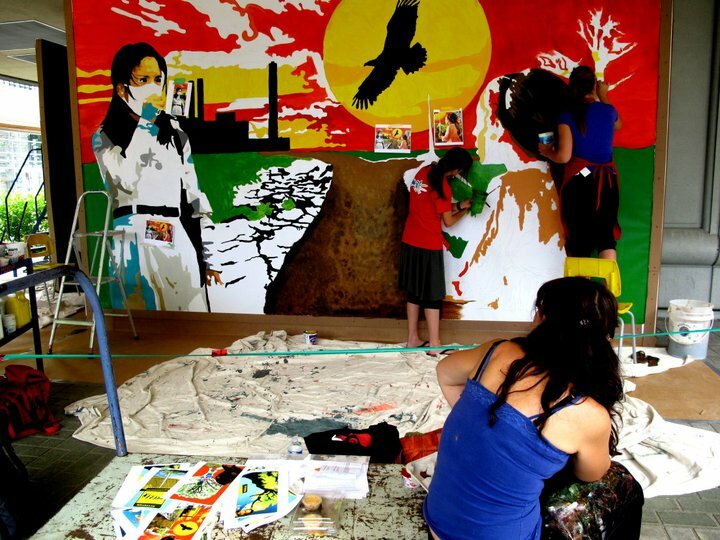 Partenariat avec le projet Murales des Peupliers, le Conseil Cri de la Santé et le Fond de Prévention du DIabète. 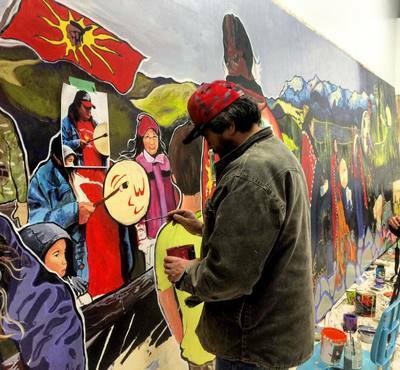 Murale réalisée à partir d'idées des jeunes sur l'activité physique et la valorisation d'activités traditionnelles, du mode de vie cri pour rester actif, en santé et conserver une relation de respect au territoire.